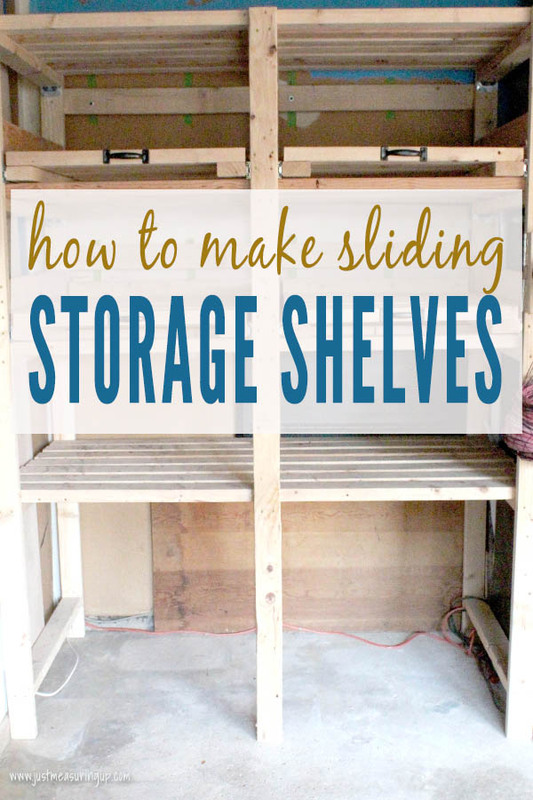 Learn how you can turn a 20-foot garage corner into 70-feet of space with stacked, slide-out storage shelves. 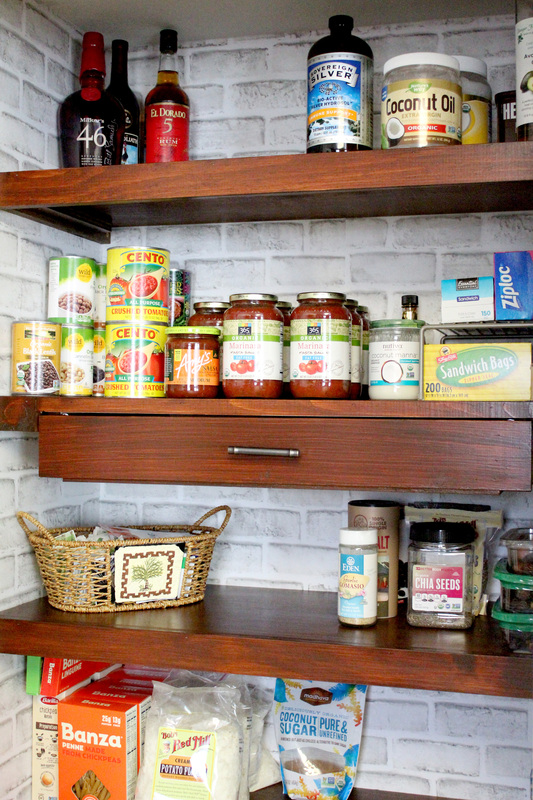 Plus, see how to create bonus shelving with leftover wood. My garage was getting a little out of control. Bulky tools from home improvements projects, boxes upon boxes of holiday decorations, gardening tools, piles of landscaping bags – nothing seemed to have a place. It was hard to get work done efficiently – not to mention, find something when I was looking for it. 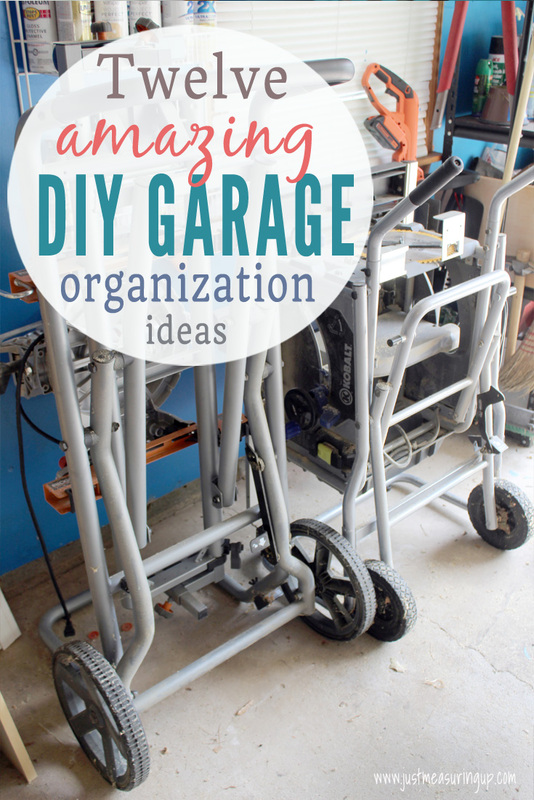 ​It was time to get smart about garage organization, storage, and shelving. I decided we need a some sort of shelving tower with deep shelves. 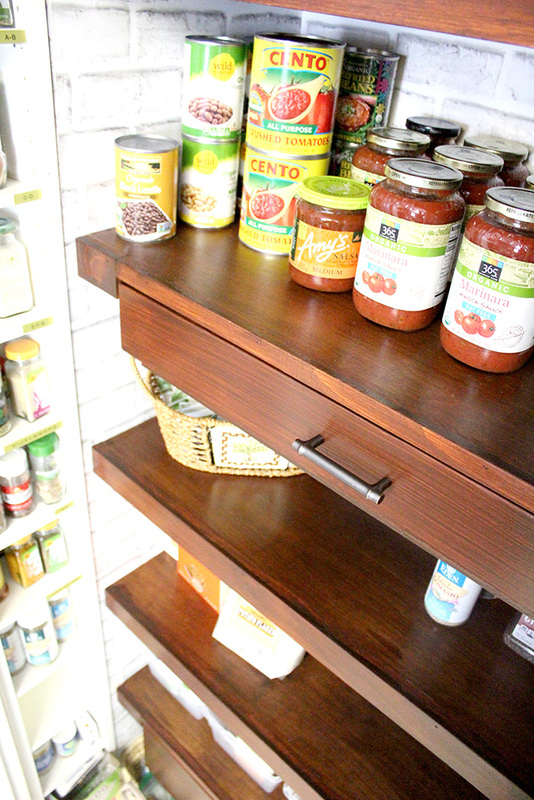 One of the ways I maximized was by using sliding shelves in the storage tower. This increased the amount of things our shelf could hold but didn’t compromise being able to easily find them. 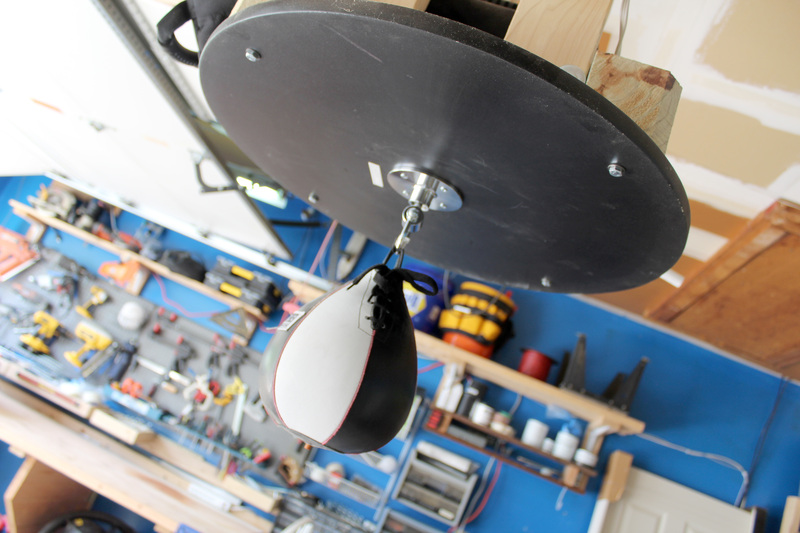 It was definitely an easy and practical addition to the garage shelf project. 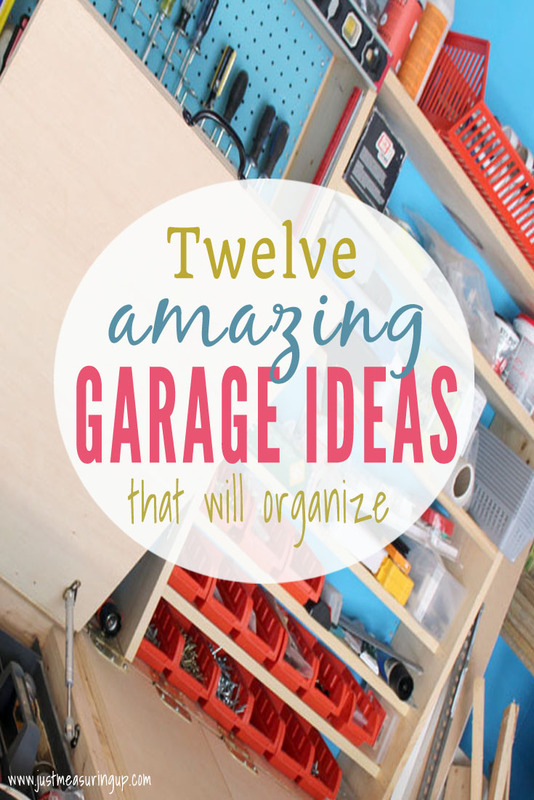 I already had several prefabricated metal garage shelves doing a decent job of garage storage, but they had their shortcomings. I had been eyeing this corner space next to our garage fridge. The space was 3 feet deep and about 6 feet wide, and it was currently underutilized. There were just piles of boxes, gardening tools, and other things that had accumulated. Corner spaces in the garage often become dumping grounds, as ours had become. I decided to capitalize on the vertical square footage, transforming this messy corner into garage storage shelving. 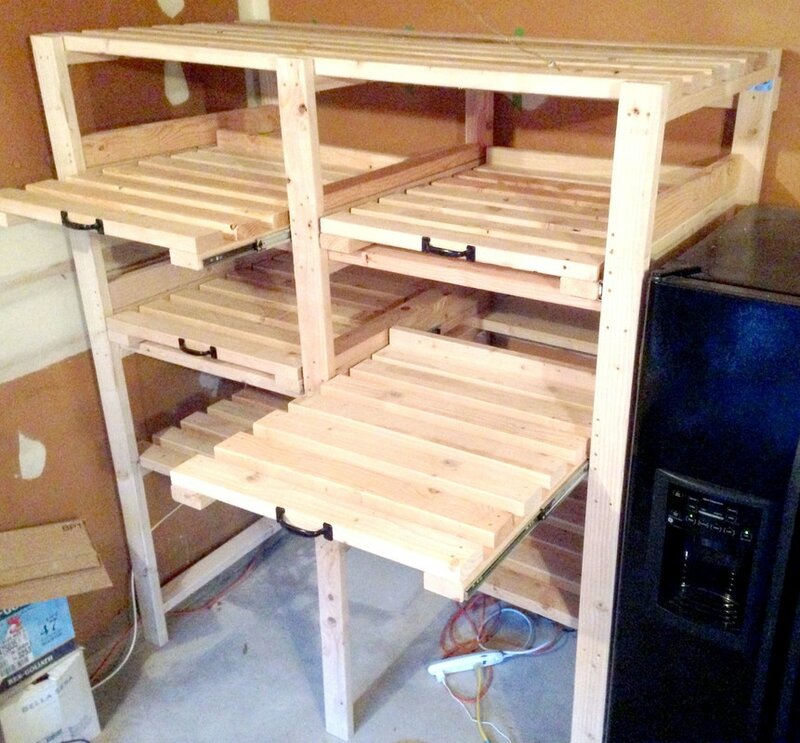 I had 3 requirements for the sliding storage shelves project for my garage. My first requirement was deep storage shelves. The area had a lot of depth, and I wanted to make the most of the space. 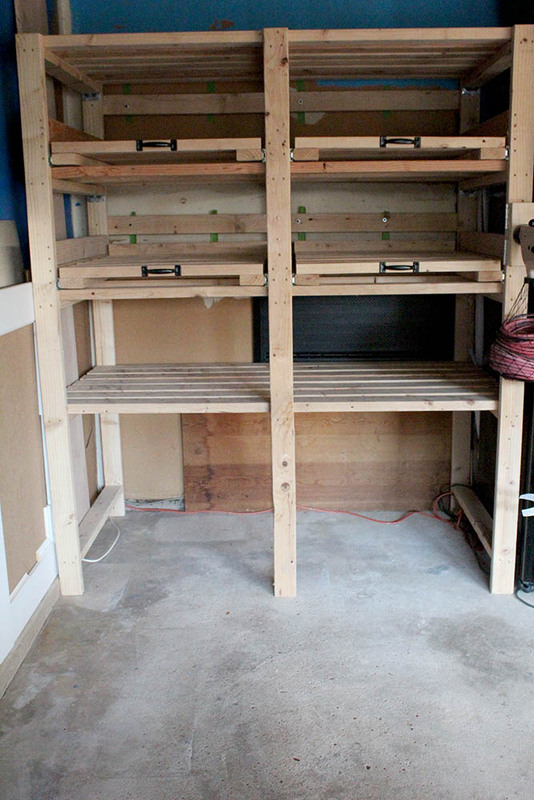 I went with 3 ft deep shelves; this was twice as deep as the prefab shelves, so twice the garage storage space. 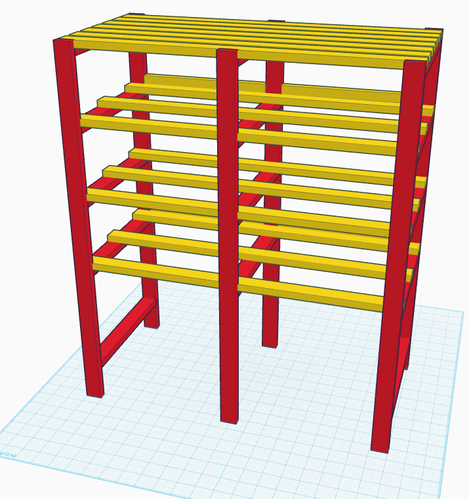 The second requirement (which is not evident in the TinkerCad drawing above) was sliding garage shelves. Although 3 ft deep garage shelves would hold a lot, trying to reach something at the back seemed very burdensome. You would have to move things out of the way to get back there, which wasn’t very efficient, especially for vertical space. 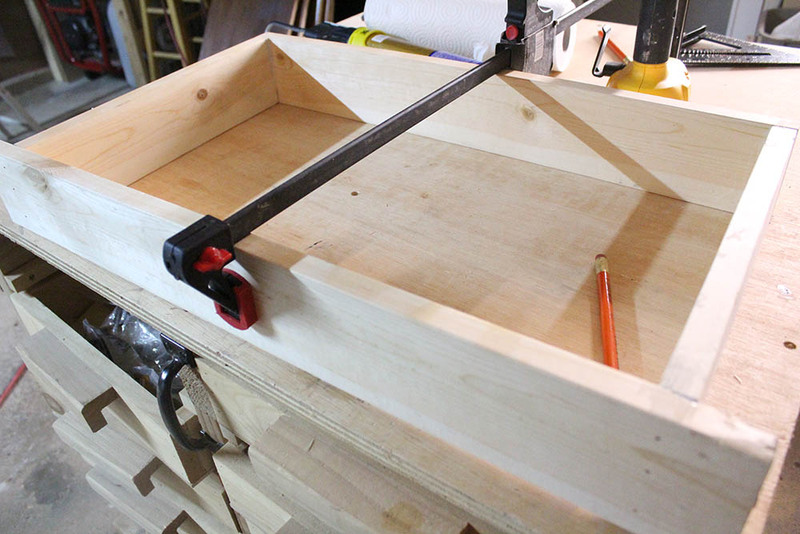 Therefore, I wanted some of the deep garage shelves to be on drawer slides. My last requirement was enough clearance at the bottom of the garage shelves to fit some of my taller tools (like my shopvac), and for them to just roll out (without having to drop off a shelf). 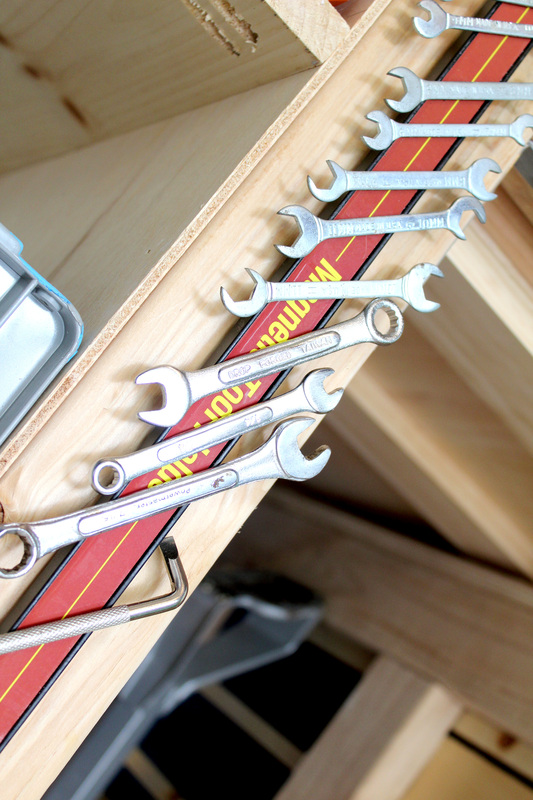 Get our DIY garage storage shelf plans below by signing up for our mailing list. Subscribe to our free newsletter for updates and ideas - plus, get instant access to our resource library with this printable and more. Each week, you’ll receive a newsletter with ideas and inspiration. 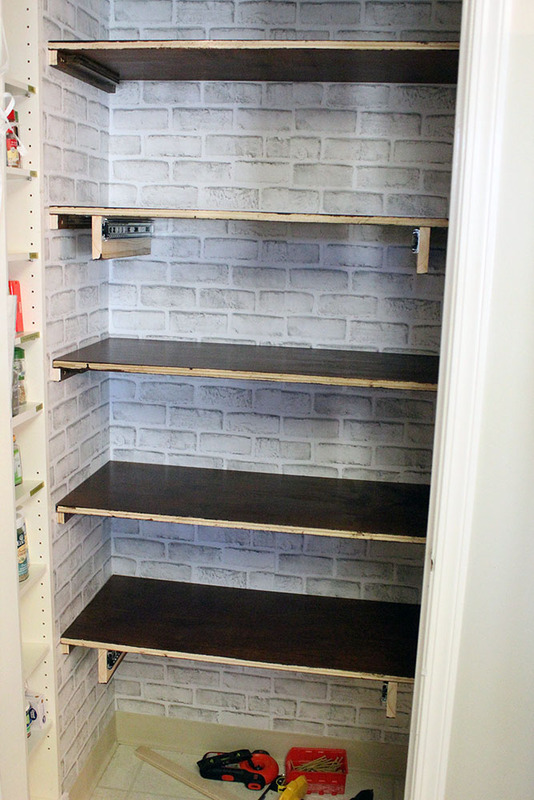 To start the sliding storage shelves, I first cleared out and cleaned the designated area for the garage shelves. 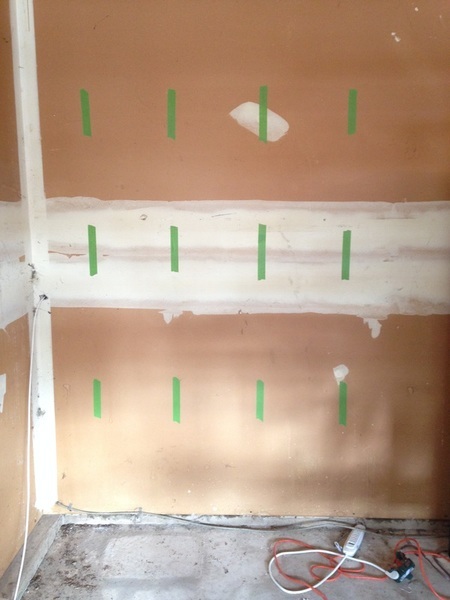 Then I located the studs in the wall (using my trusty stud finder), and used green painters tape preserve their locations. 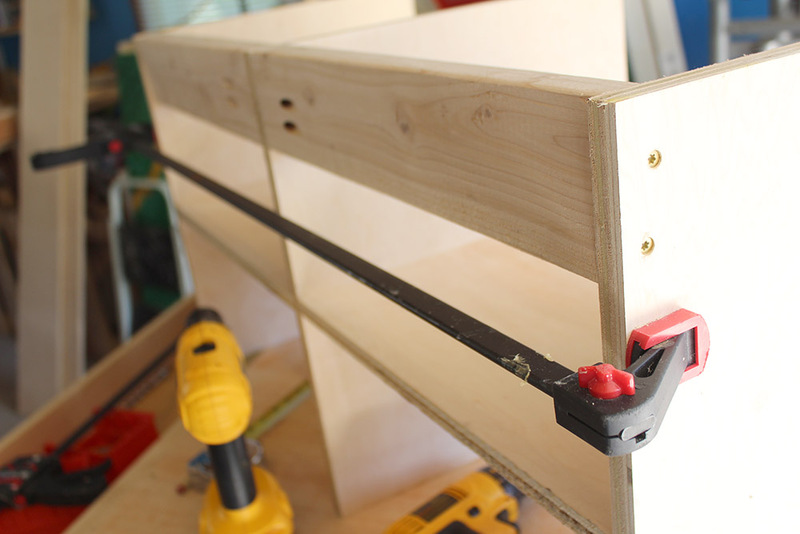 ​The garage shelving unit was going to be bolted to the studs to make it stable. 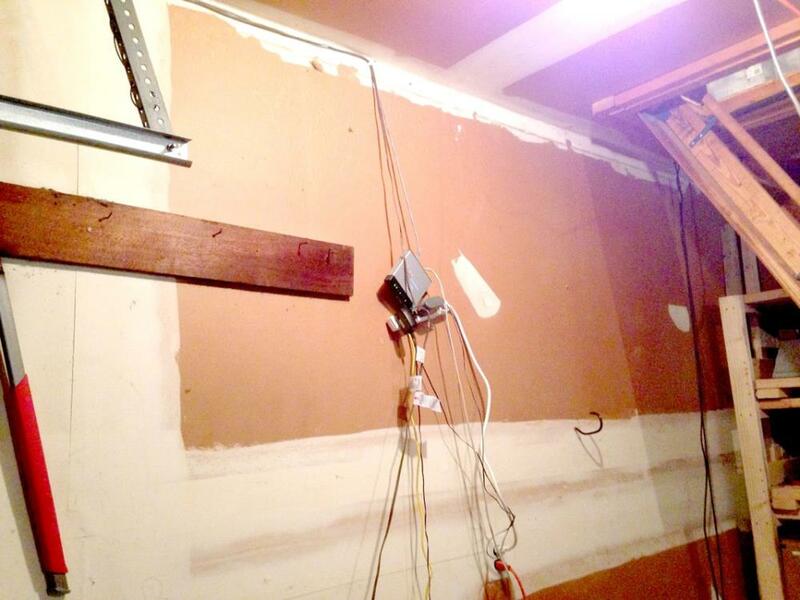 The actual construction of the garage shelves was fairly straight forward. 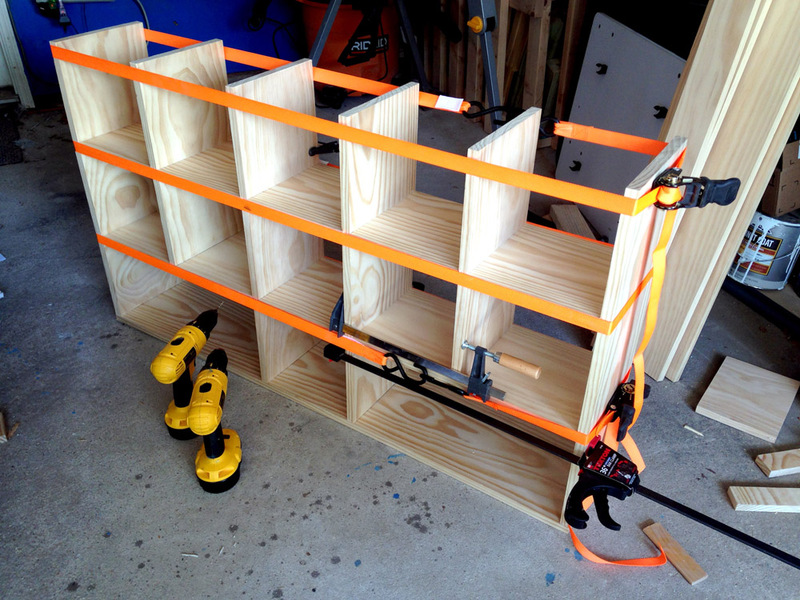 I just followed the design I created to construct the sliding storage shelves. 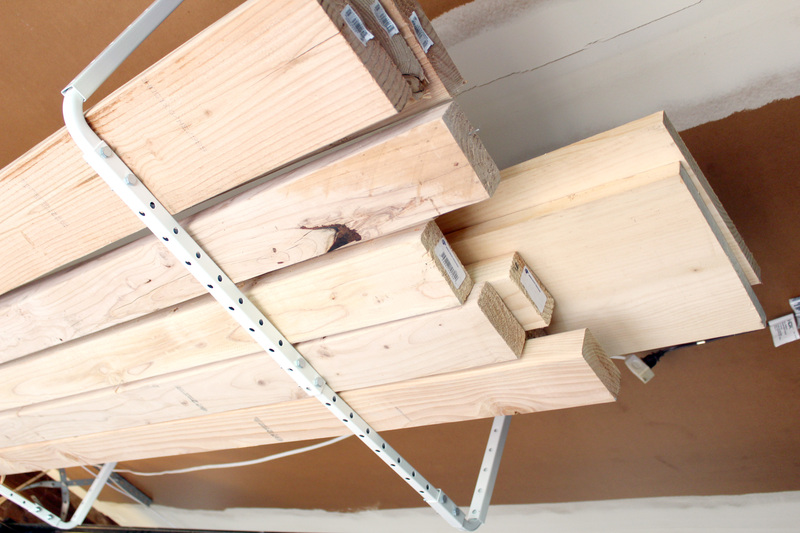 The whole garage shelf was made of 2 x 4 wood that was cut to different lengths. Unfortunately, I was so caught up in the construction (it was a pretty fun project to work on), I forgot to take many pictures. Therefore, I’m just going to provide some visuals. 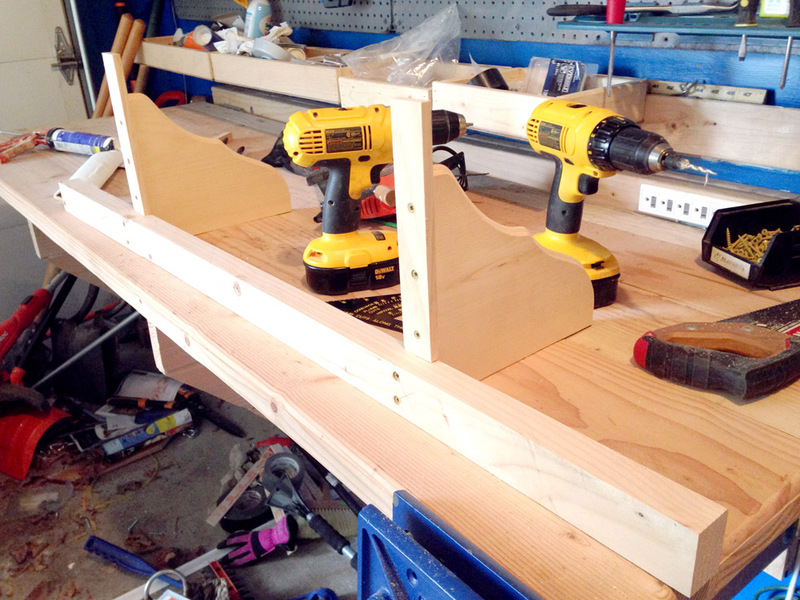 First, I made 3 vertical support structures for the garage shelves. I would install these on the ends and middle. 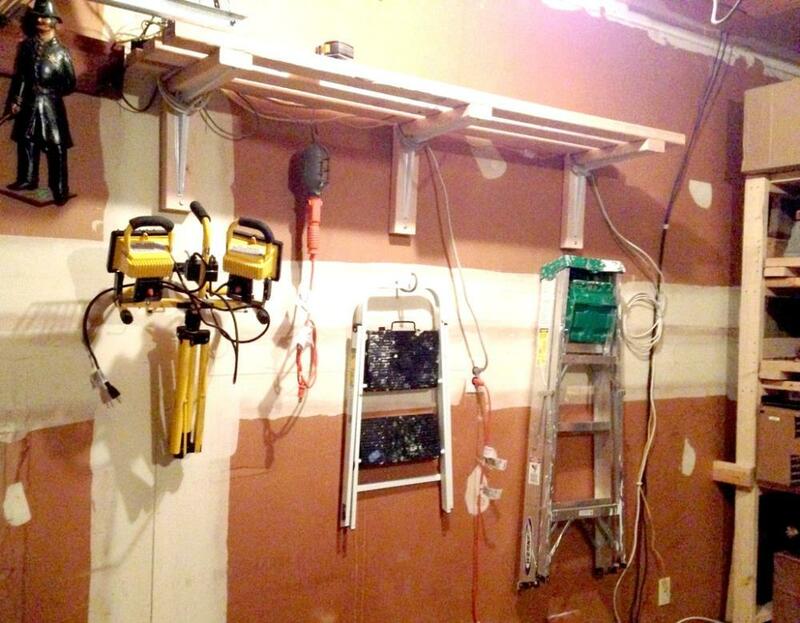 Next, I used 6 ft cuts of 2 x 4s to connect the 3 vertical supports, and to form a basis for each garage shelf. 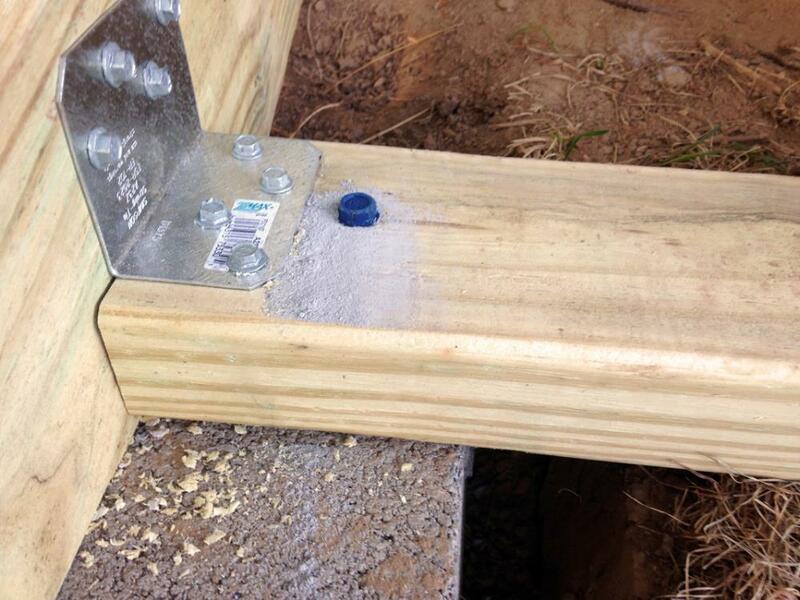 ​I also added 2 extra 6 ft pieces at the back of the structure to bolt into the wall studs. 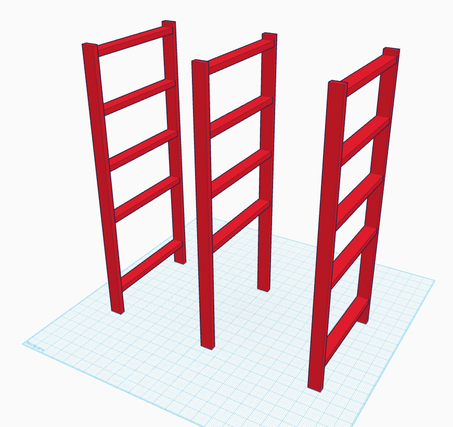 Before considering sliding storage shelves, I thought about making all of the shelves look like the very top one. However, that was going to be too simple, and I like to make things a little challenging. 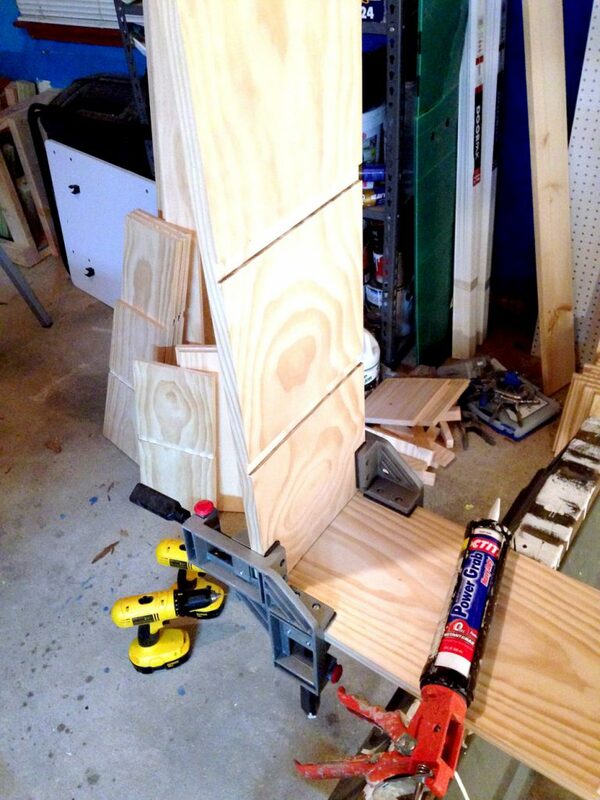 Hence, the modifications for the garage sliding shelves. 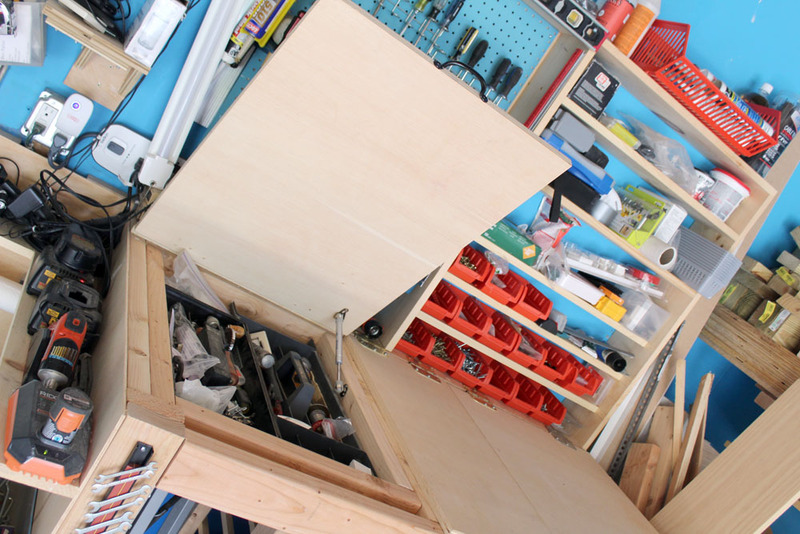 The shelf slides were going to bear the load of the garage shelves, so it was not necessary to run as many 6 ft planks as the top shelf (which was just a static shelf with no slides). Three connecting pieces per row was sufficient. Notice the 4 slide supports on each row (one on each end and two in the middle). 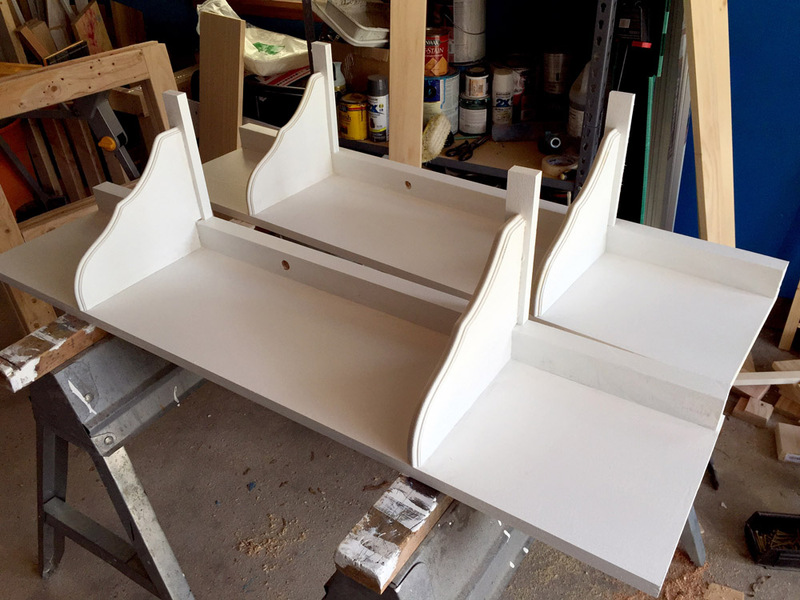 In between each pair of slide supports was going to be the actual sliding shelves. 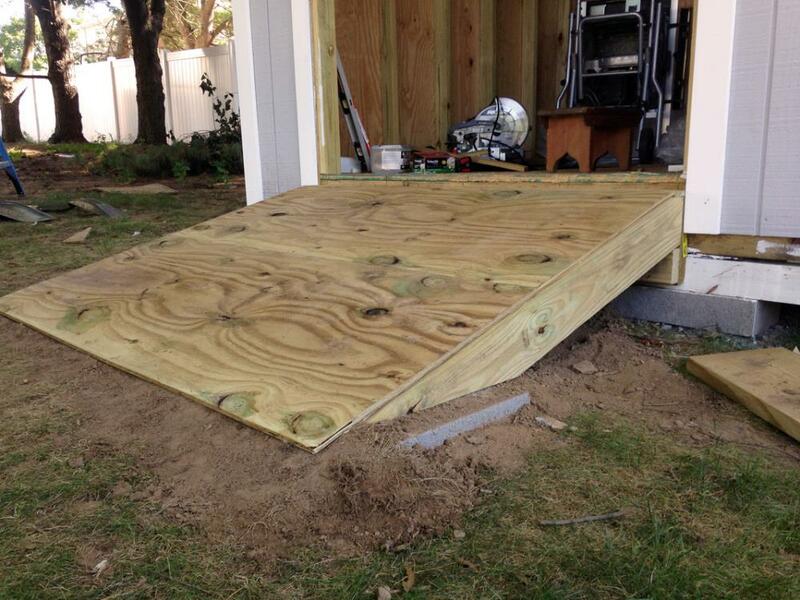 At this point in the project, it was time to secure the structure to the garage wall. If I proceeded any further with construction, the DIY shelving unit would be too heavy for me to carry (not that it wasn’t already really heavy). Also, there was just enough room for me to squeeze in between the 2 x 4s to get to back to bolt the structure to the wall studs. Next, I wedged myself in the middle of garage shelving unit, picked it up like superman, and inched my way over to the wall. I used some lag bolts to secure the shelves to the studs. 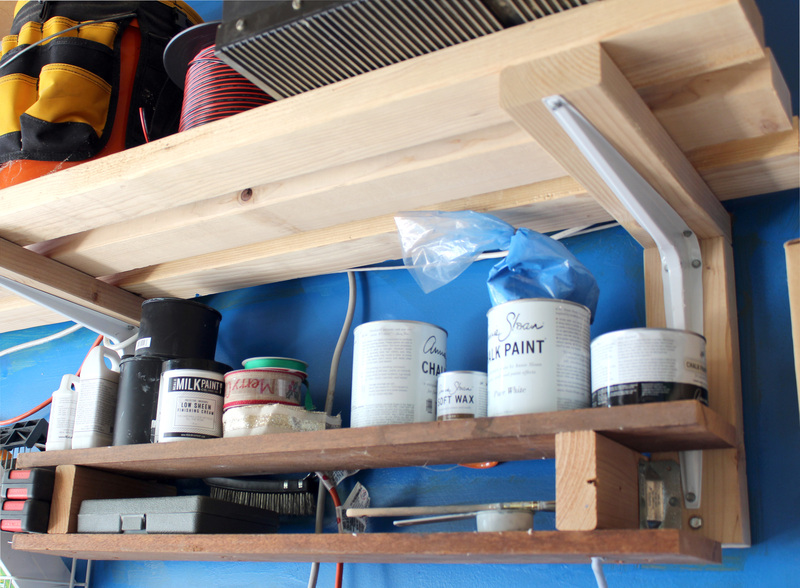 During construction of the garage shelves, I did add an elevated piece to the back of each shelf. I didn’t want items falling off the back as I pulled the shelf forward. First, I installed the slides on each slide support. 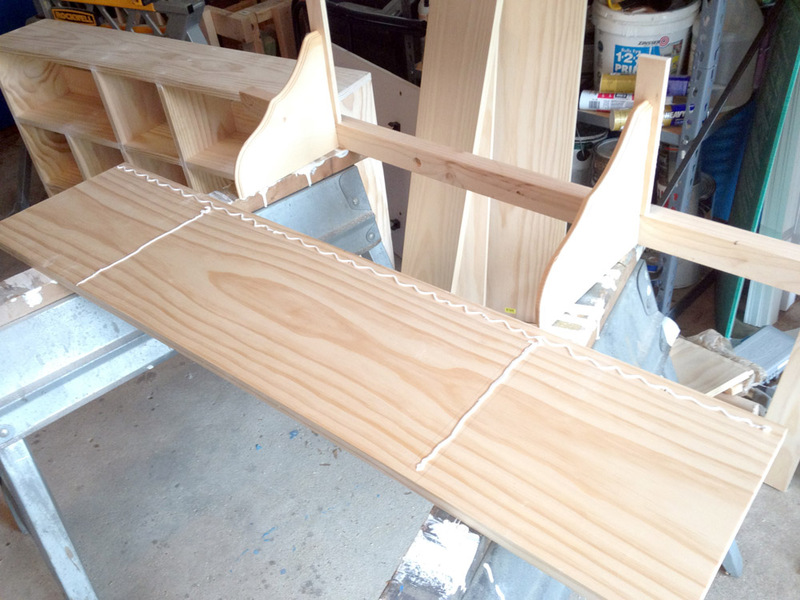 Then, using ¼” scrap wood as shims, I elevated each shelf and secured them to the slides. 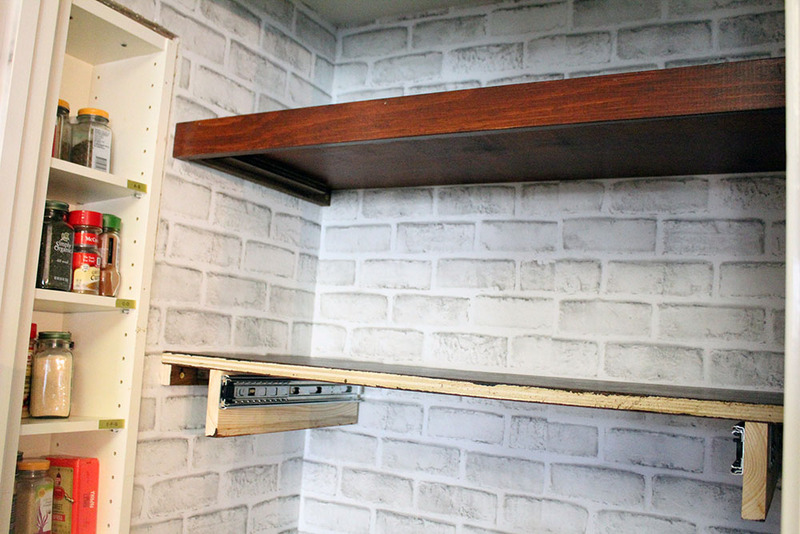 With the sliding shelves installed, the garage shelf project was pretty much complete. Last, I just had to install some gate handles for each shelf to be able to pull them out easily. 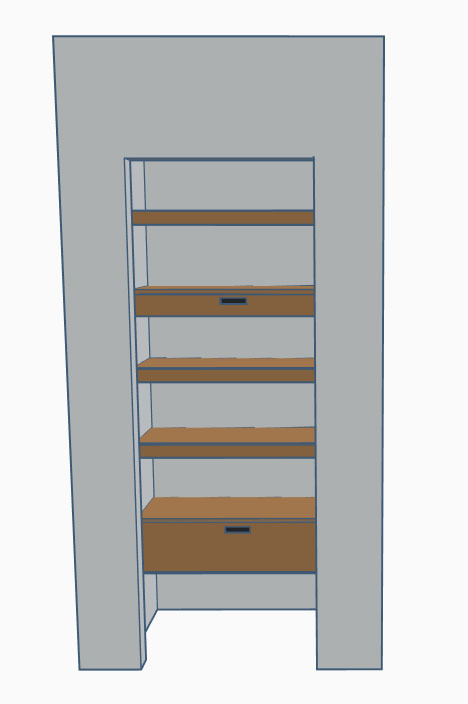 Although, I did make a last-minute design decision though – I omitted the bottom row of sliding shelves and replaced it with a static shelf (like the very top one). 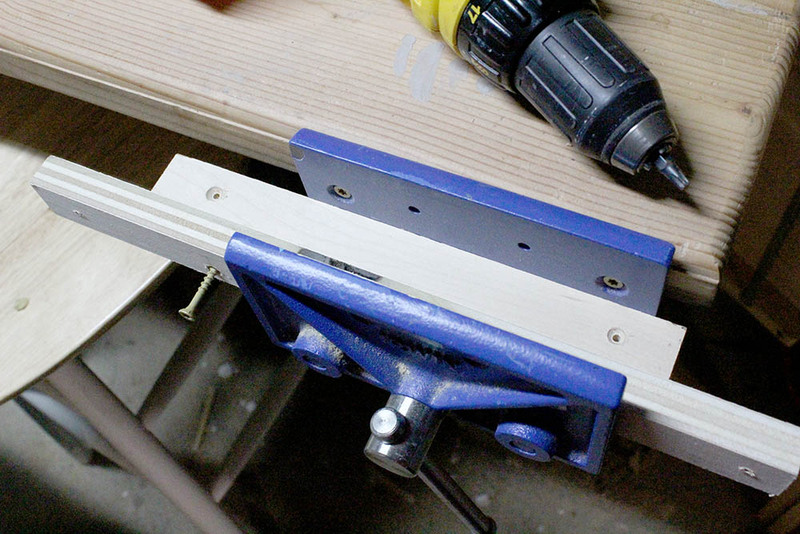 I realized that some of my tools (like my miter saw) didn’t have enough clearance to fit on the DIY sliding shelf. ​Consequently, I settled for just 2 rows of sliding shelves, which was still plenty of awesomeness. 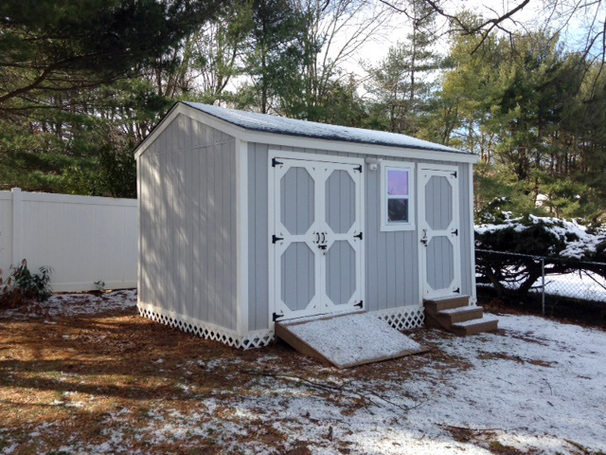 There is also enough space to pull a car into the garage too – with about a foot to spare. ​However, I was a little worried about bumping into the garage shelf with the car, so I got a cheap parking sensor to help (it turns from green to yellow to red as you get within a foot of the sensor). After I finished the garage shelves, I had an extra 2 x 4 leftover. Still in a shelf-frenzy mood, I turned those into some normal shelves on the wall. Using some shelf brackets, I bought a while ago, I threw together a simple shelf for the garage with the leftovers from the main project. 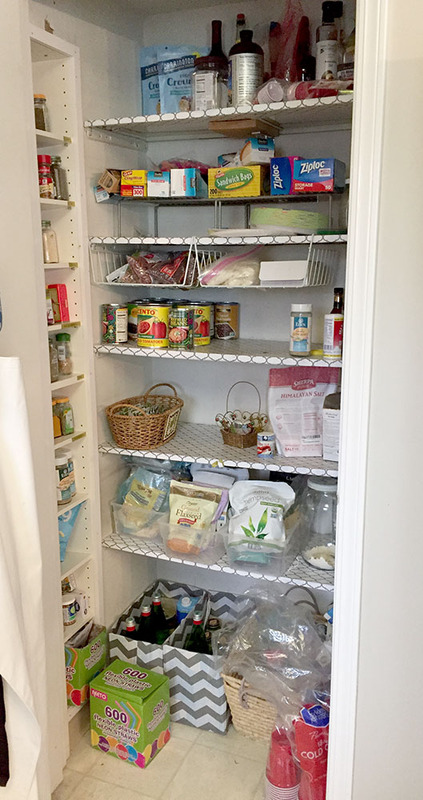 ​Below is what I turned the above disaster into – see shelf at the top of the picture. 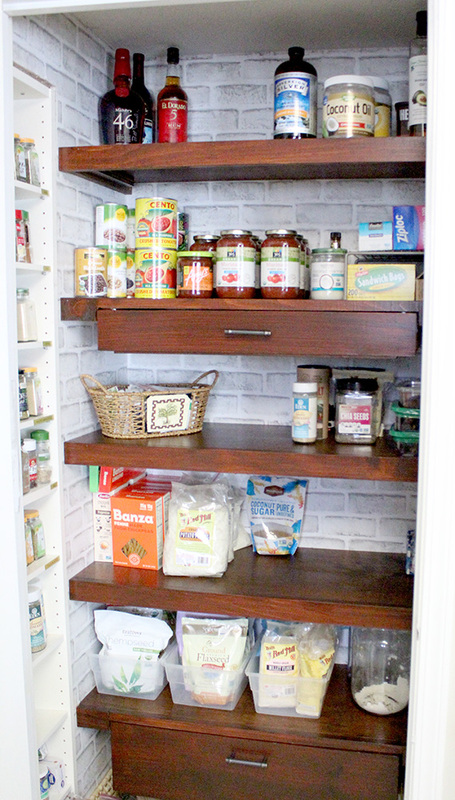 The sliding storage shelves truly transformed a disorganized corner. We gained a ton of lost space through building the shelf tower. 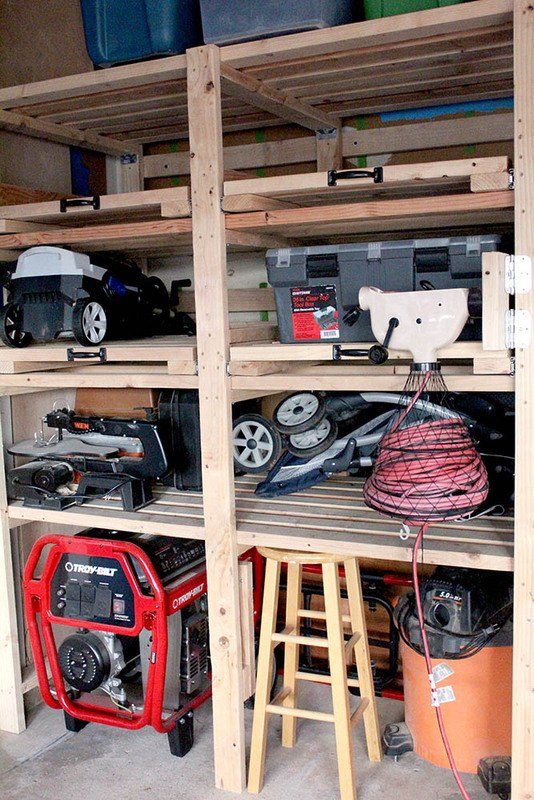 Storage-wise, the garage shelves hold more than we could have imagined – most of the boxes of holiday decorations (Eileen loves that she can easily access these), tool boxes, and large tools such as the miter saw. 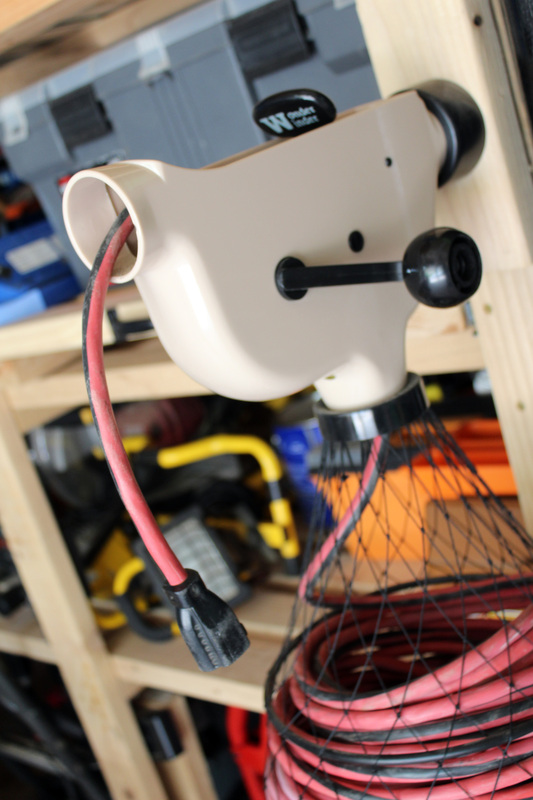 Underneath the storage shelves, I store the shop vac, jaw horse, and snow blower. It’s the perfect height. 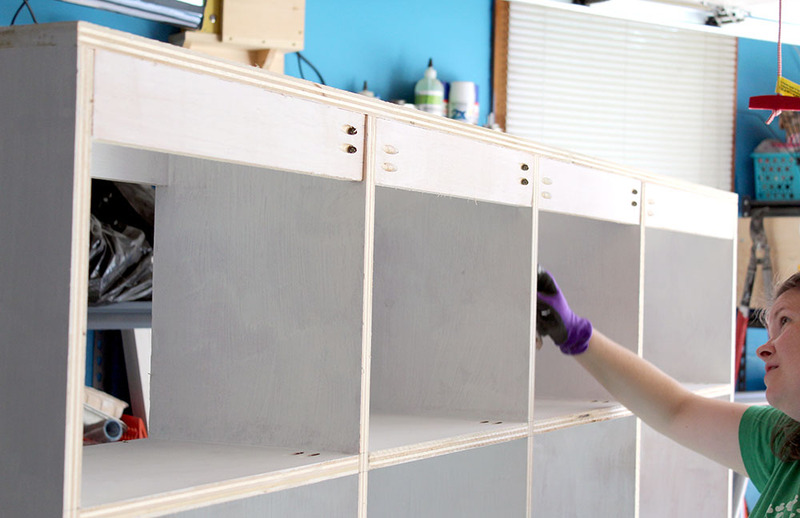 Pleased with the outcome of my DIY garage organization, I found building the shelving unit one of the most fun and creative projects I’ve worked on recently. ​I also completely impressed Eileen with doing the whole project in one weekend – that was the best part. She was also thrilled that the cost was less than $200. 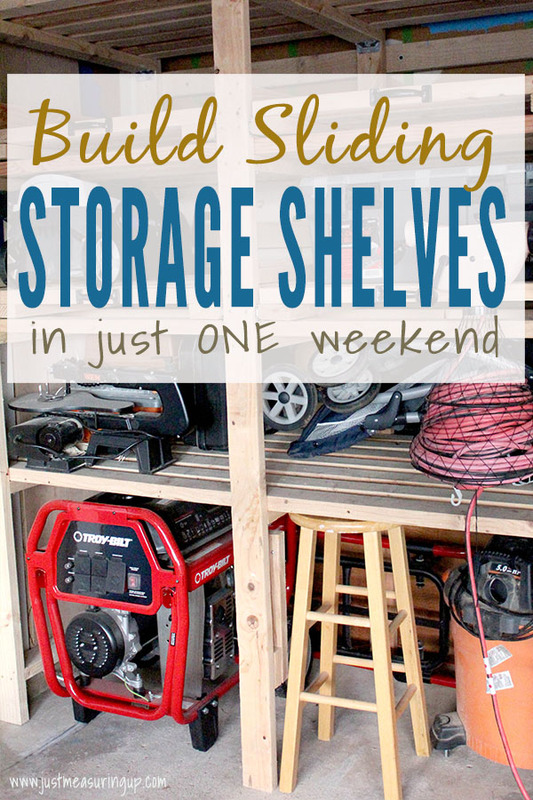 If your garage is getting out of control and you have underutilized space, you should definitely think about building these sliding garage storage shelves. The design worked beautifully, and you can’t beat the turnaround time and low-cost. With phase 1 of “Project DIY Garage Organization” was now complete. 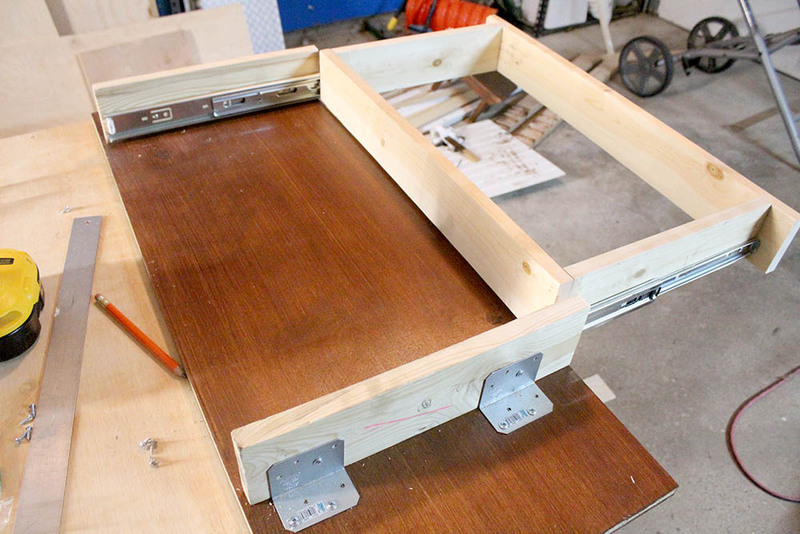 Phase 2 of the garage construction is coming this summer – a dream folding workbench with fancy storage solutions. 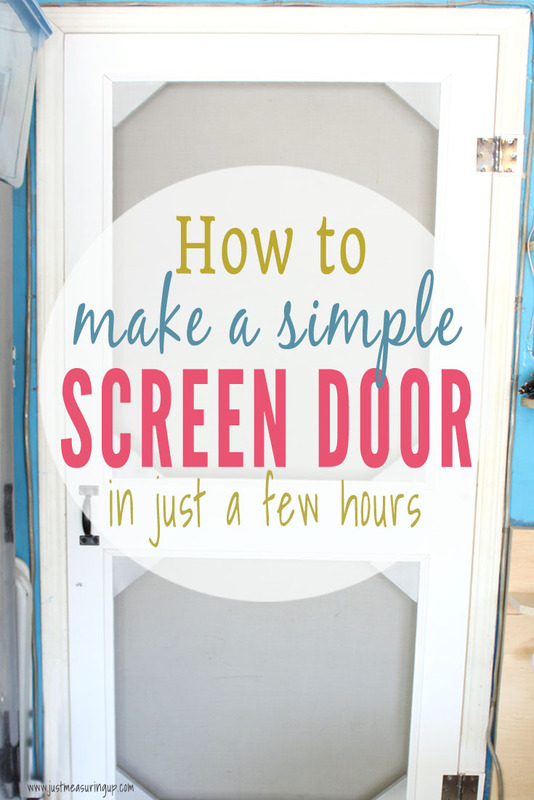 You know that wasted space in between your double garage doors? 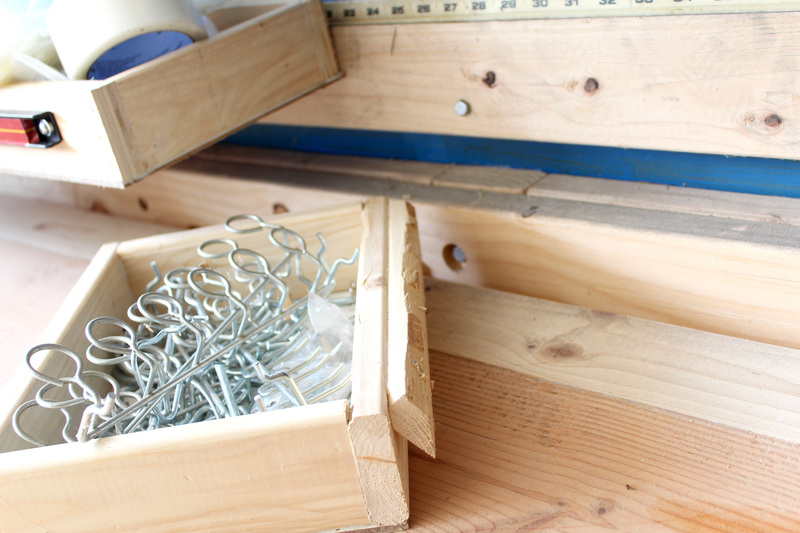 We used every inch of it with these easy DIY French cleat storage boxes. 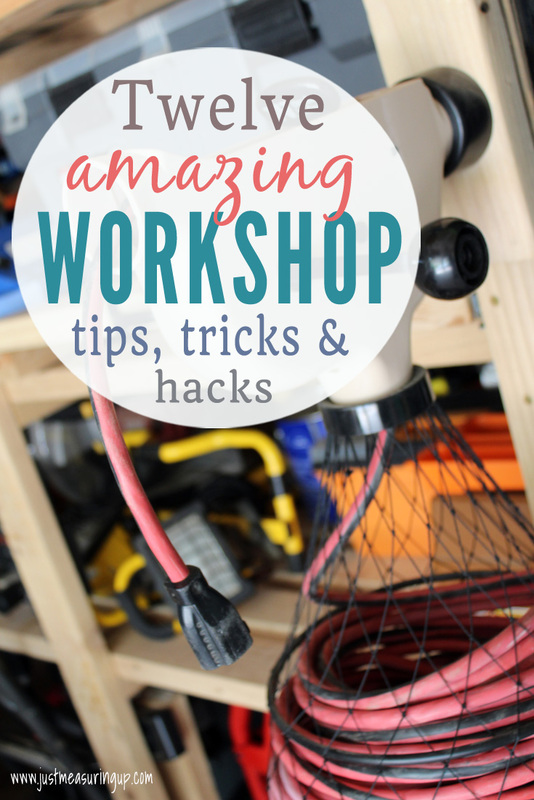 Our garage doubles as our workshop. 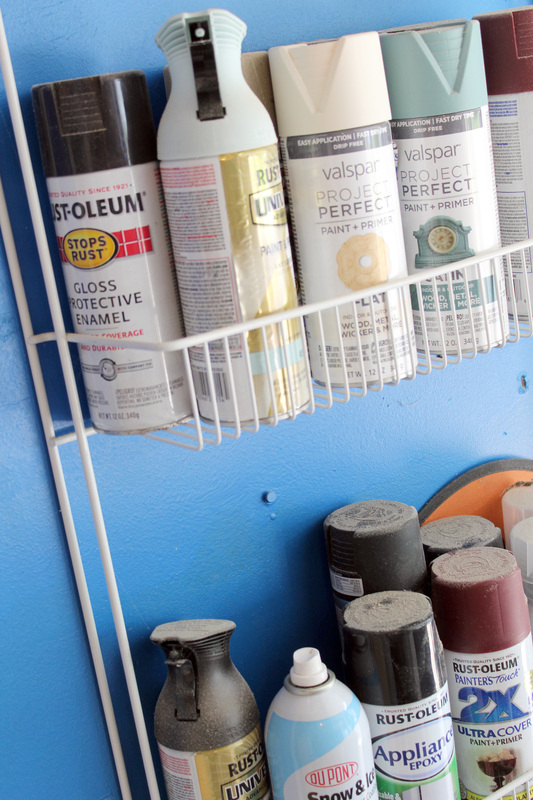 If yours does too, see 12 things every DIYer needs in their garage. 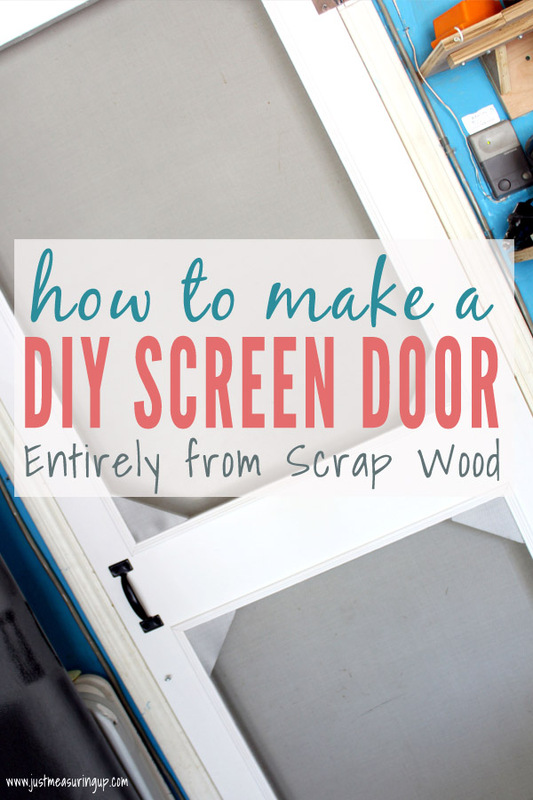 We just put a DIY screen door on our garage and are loving it! 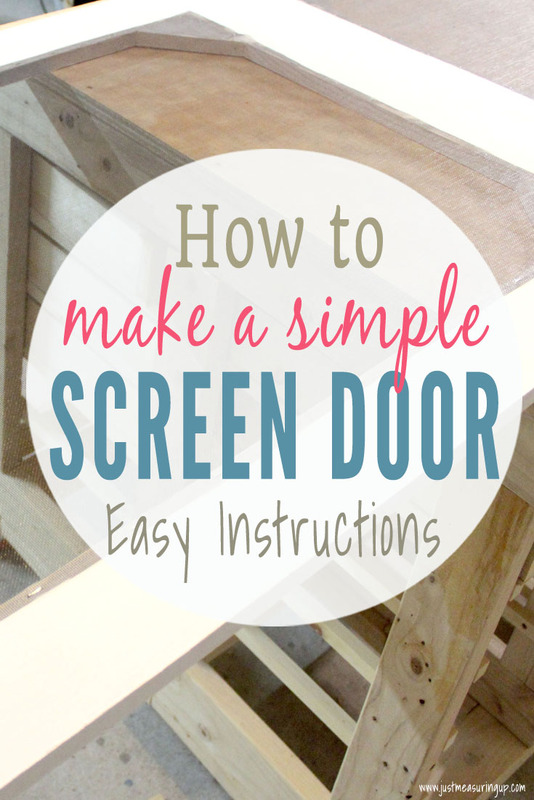 Screen doors are so easy to make and cheaper than buying the premade doors. 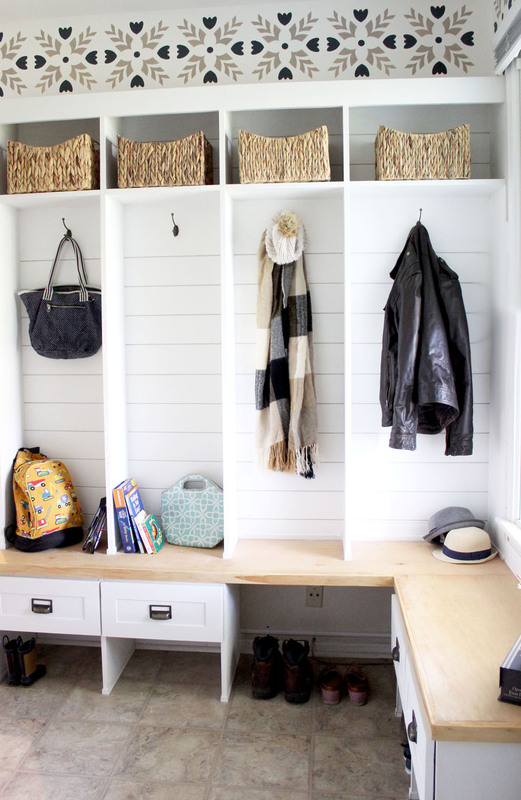 How to Build a Entryway Bench with Hooks and Storage Post Preview: This article will show you how to easily make this hallway bench with hooks and storage, perfect for mudrooms or entryways. 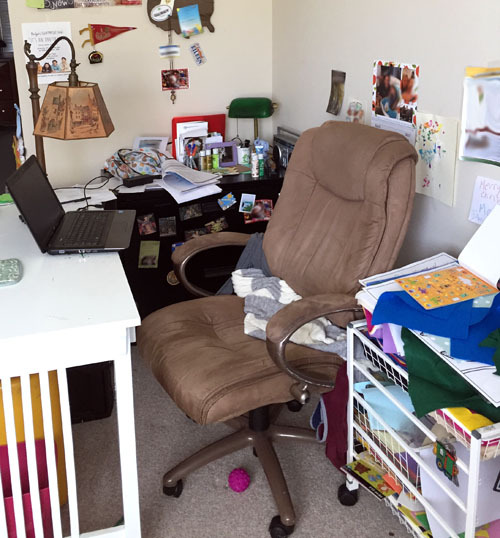 Do you ever have a busy room that’s an absolute mess? A room where there’s absolutely no efficiency? 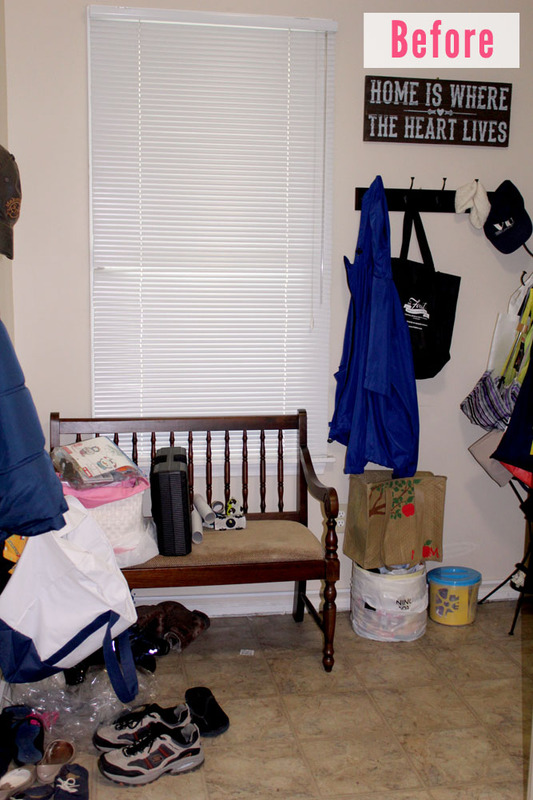 This was our previous mudroom (see before picture below). Shoes and coats were always just tossed everywhere. Backpacks, diaper bags with no place to go. When you have a room that drives you crazy like this, you have to rethink it. 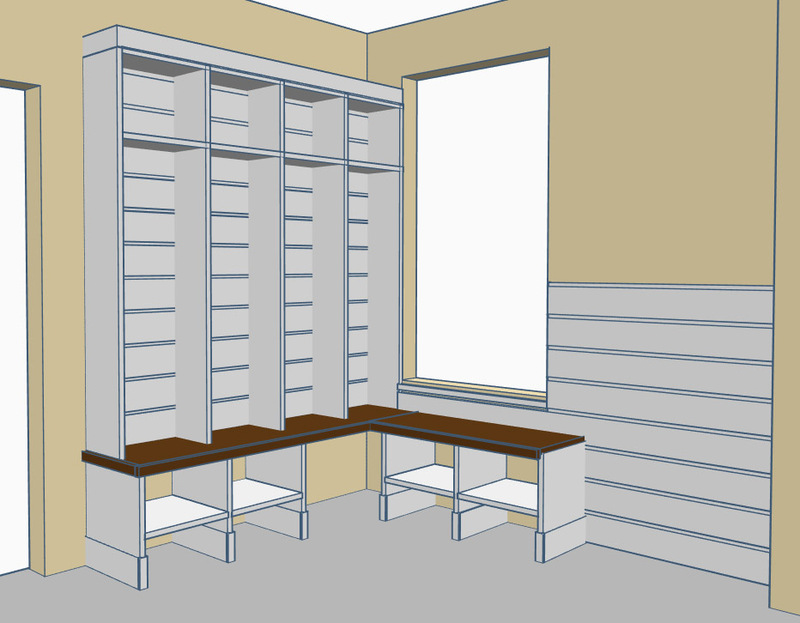 My wife came up with this great plan of installing a hall tree – with an L-shaped bench and locker-style cubby shelves. 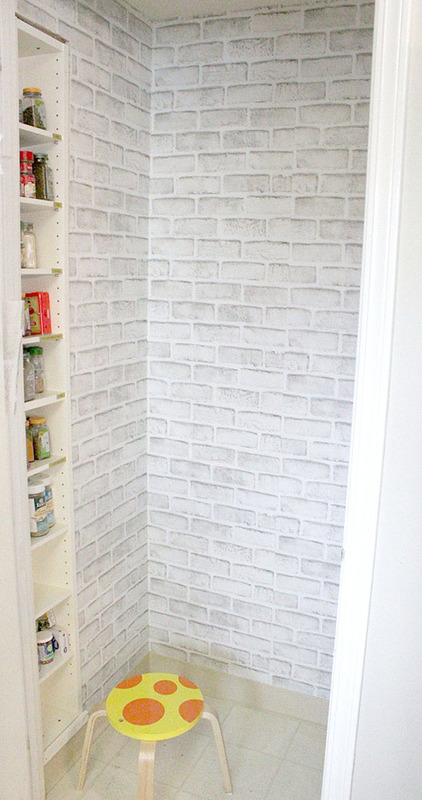 Upper cubbies would be loaded with hooks for hanging things like coats and kids backpacks. Lower cubbies would hold shoes. 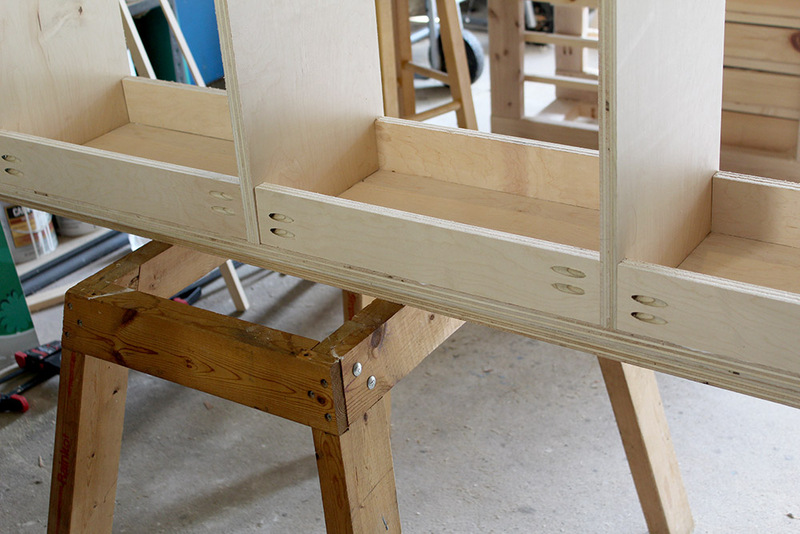 We even planned to add drawers to parts of the lower cubby shelves for additional storage. 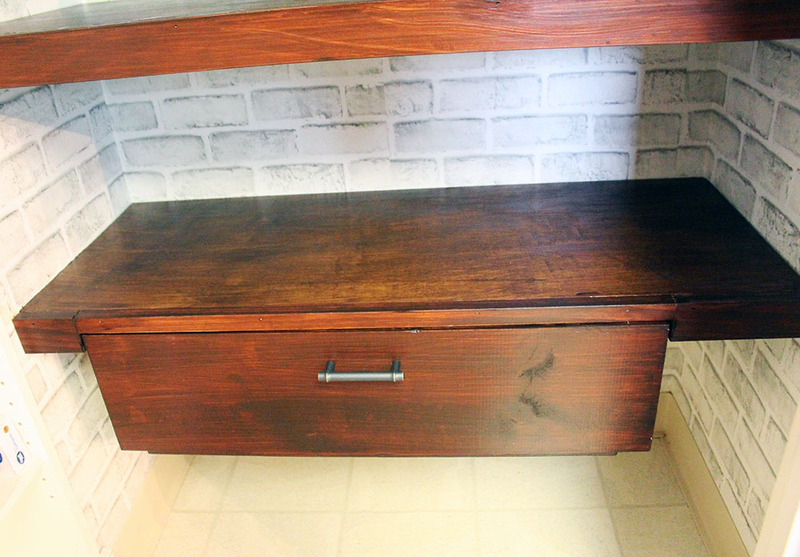 My wife’s favorite part of the plan, aside from the organization, was that we were using completely natural milk paint and Tung Oil, provided by Old Fashioned Milk Paint. 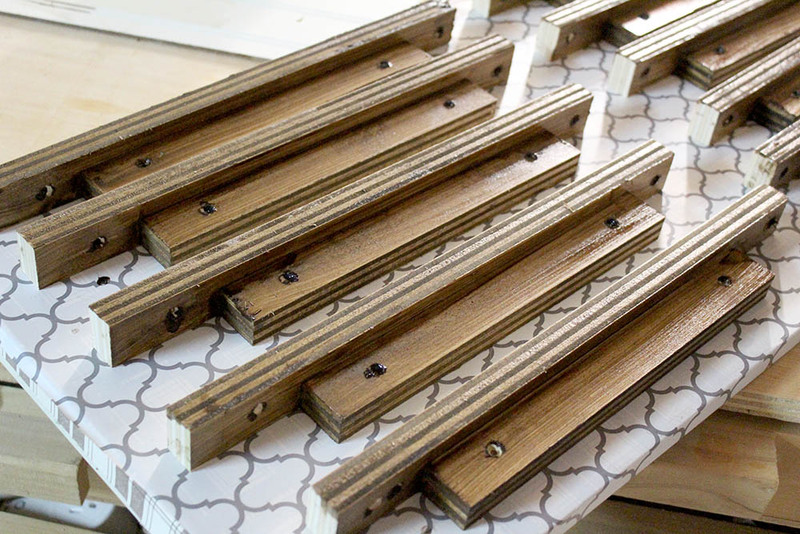 Their milk paint is a gem – completely natural ingredients and it was a dream to work with. 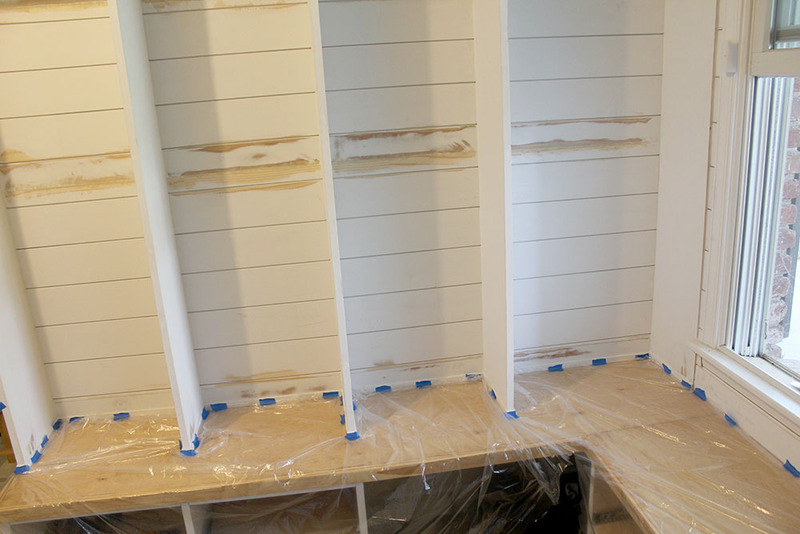 In addition to the built-ins that we were making, my wife Eileen also planned to stencil the wall and add some shiplap. So, Eileen came up with her vision and sketched it out. Before our kids could color over it, I put her vision into place using a 3d design on my computer. The entire structure was to be made mostly out of ¾” birch plywood, cut into strips. 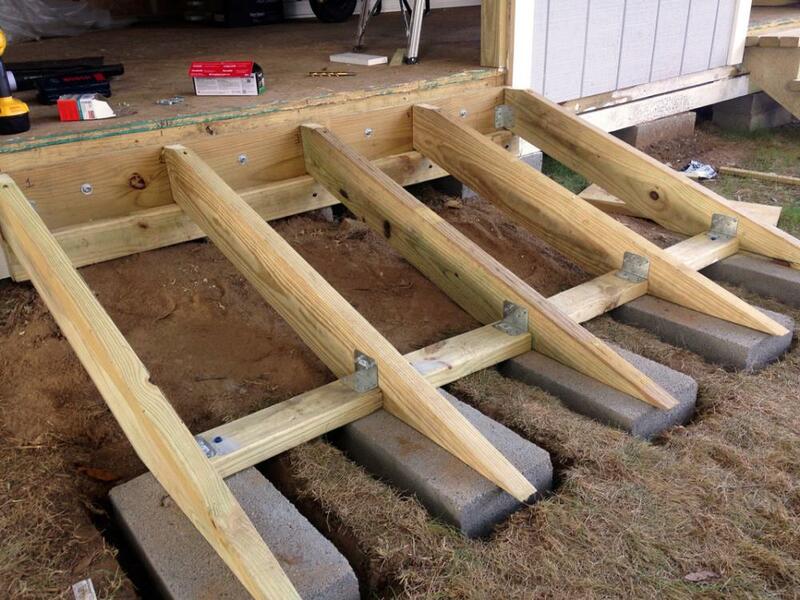 Several hidden areas were going to be reinforced with 2x4s. Finally, since plywood was being used, I had to cover all the exposed edges with trim. 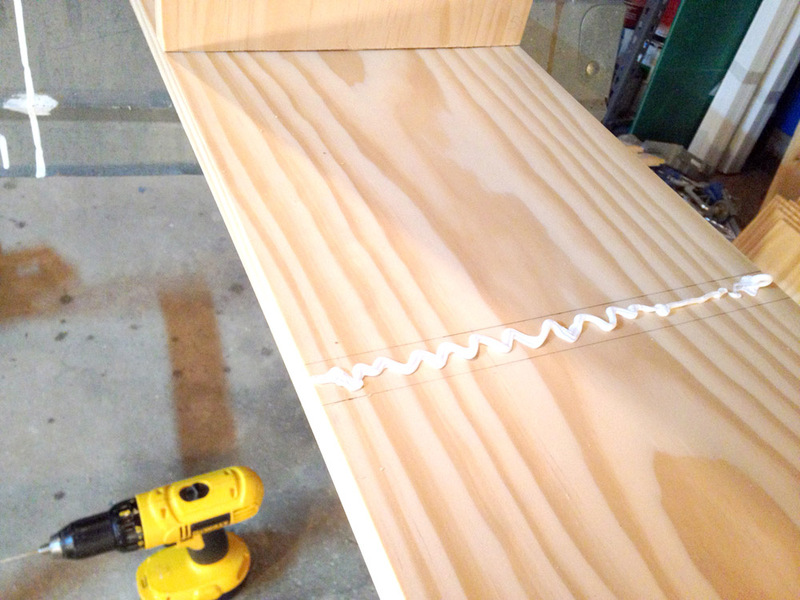 I planned to make my own trim by cutting thin ¾” strips of pine board. 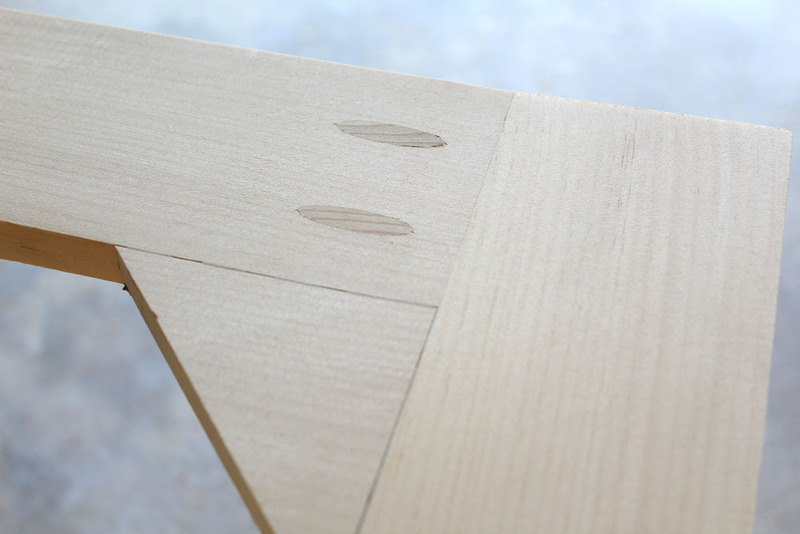 To join all the pieces together, I was going to use a combination of construction adhesive, deck screws (1.5” and 3.5”), pocket hole screws and finishing nails. 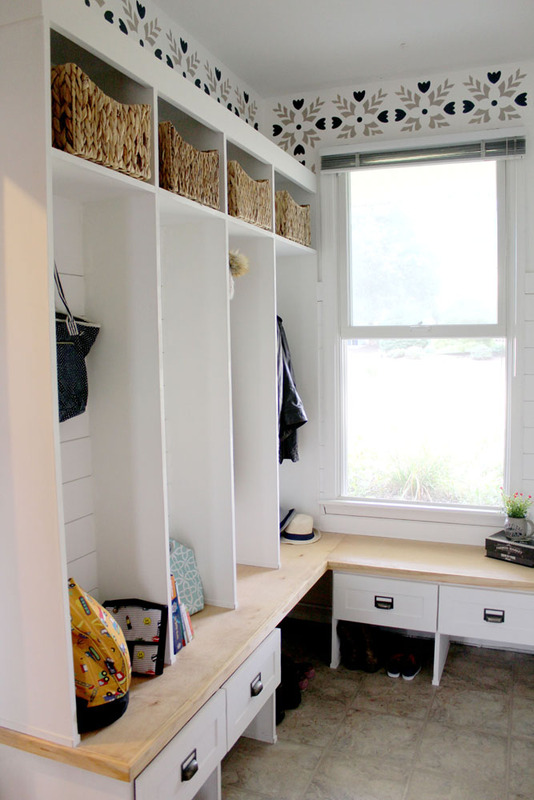 The mudroom hall tree shelves consisted of three segments – two lower cubbies for drawers and shoes (and to also serve as a bench), and the upper cubbies – think locker-style – for hanging things in. 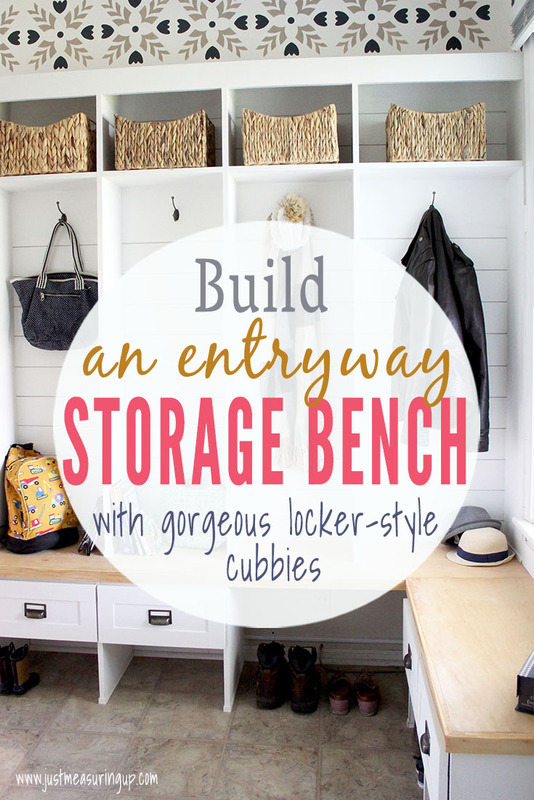 So logistically, this meant I could work on different parts of the cubbies as was convenient for me, and have them come together in the mudroom. 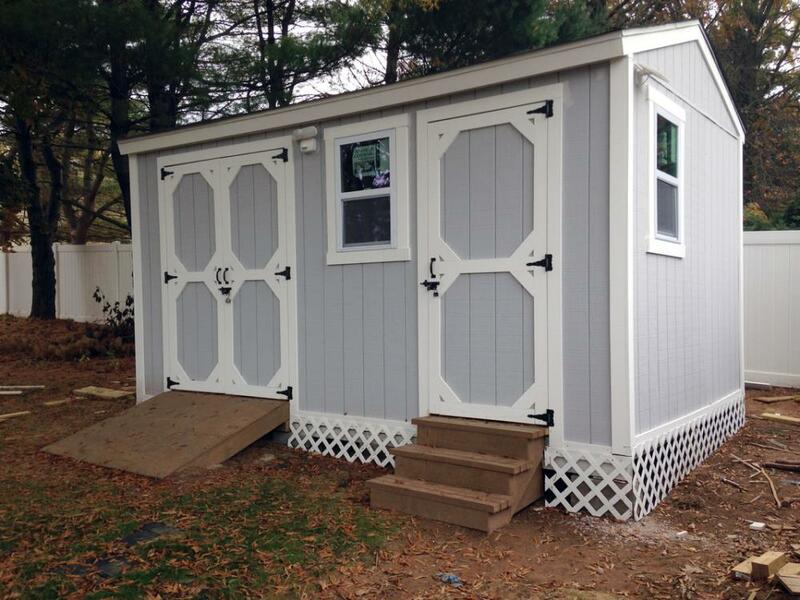 Each lower cubby consisted of three vertical (16.25” x 19”) and two horizontal (16.25” x 17”) pieces of plywood. The horizontal pieces attached to the vertical ones. 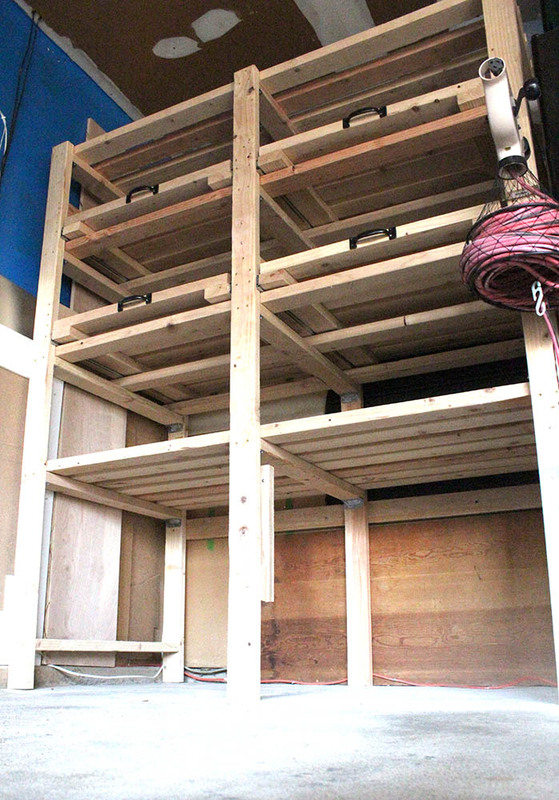 The structure was further reinforced with some 2x4s in the rear, and some plywood in the front. 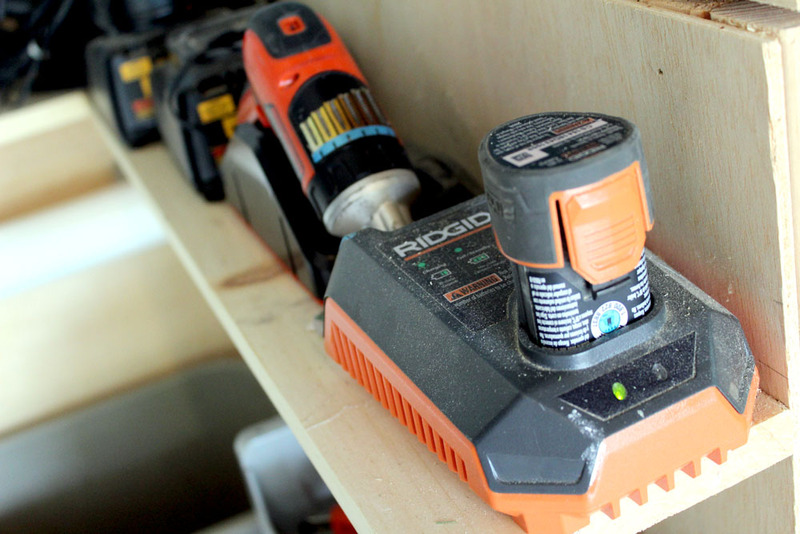 The rear 2x4s also would serve as anchor points to bolt the cubbies to wall studs in the mudroom. 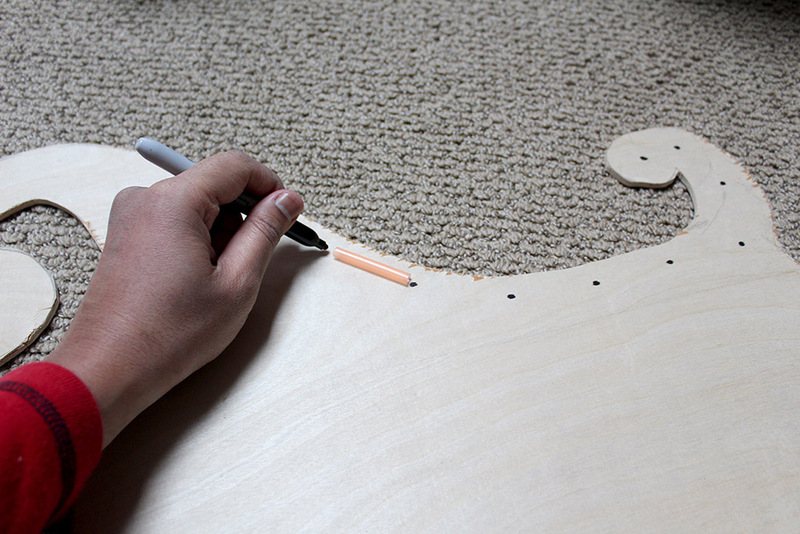 The pocket holes were ideal for joining inside pieces of wood, like the piece in the center. I also bolted some 2x4s to wall studs in the corner provide support for the entryway bench over there. Not wanting to sacrifice some electrical outlets in the room, I also cut out some notches in the cubby shelves, so the outlets could still be accessed. 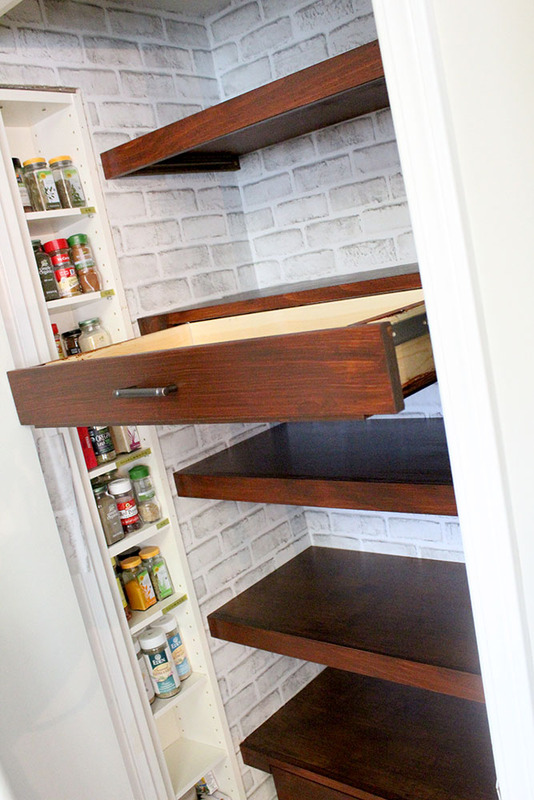 We used Old-Fashioned Milk Paint, which we absolutely love. It’s completely natural and has zero VOCs. It’s made from just milk casein, lime, and earth pigments. There’s no smell and it goes on beautifully. 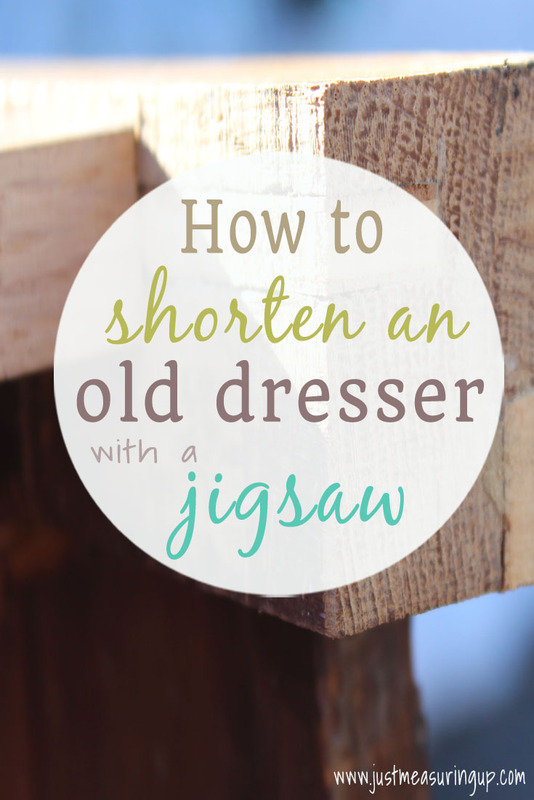 To see how to use milk paint on raw wood, check out this post. With the lower cubbies complete, I moved onto the drawers. 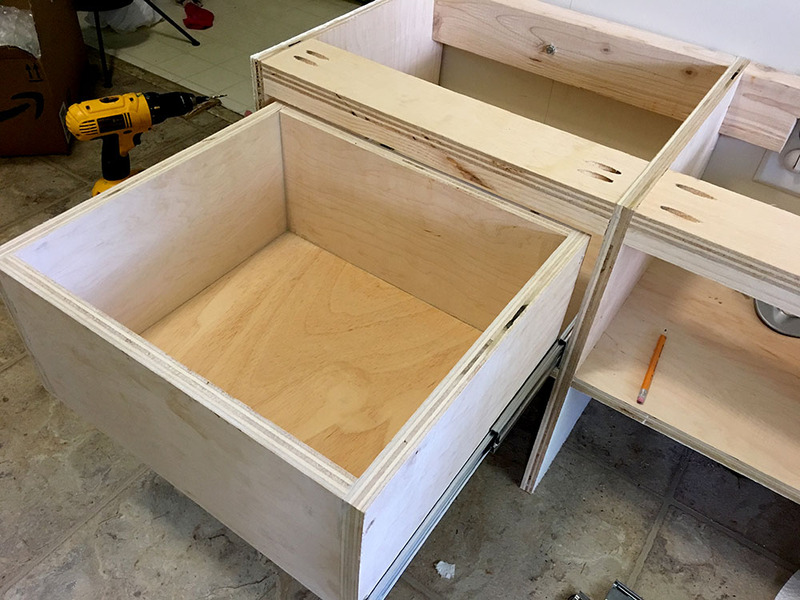 They were a simple box drawers made from 4 pieces of ¾” plywood for the sides, and a thin ¼” plywood sheet for the bottom. 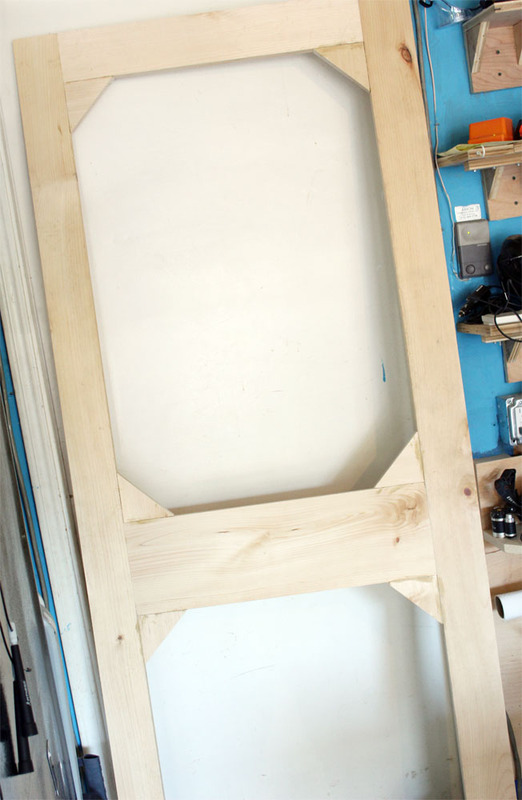 I attached the sides together with construction adhesive and screws to form a square. 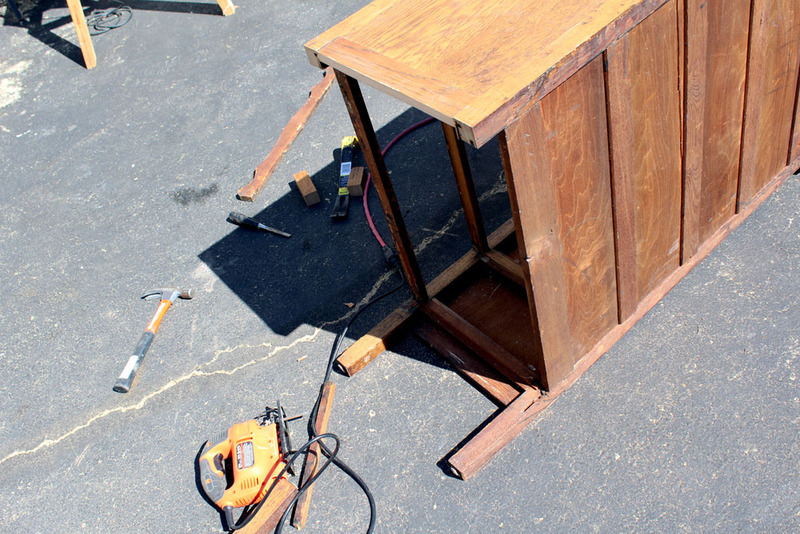 Then, I used more glue and finishing nails to secure the plywood sheet to the bottom. 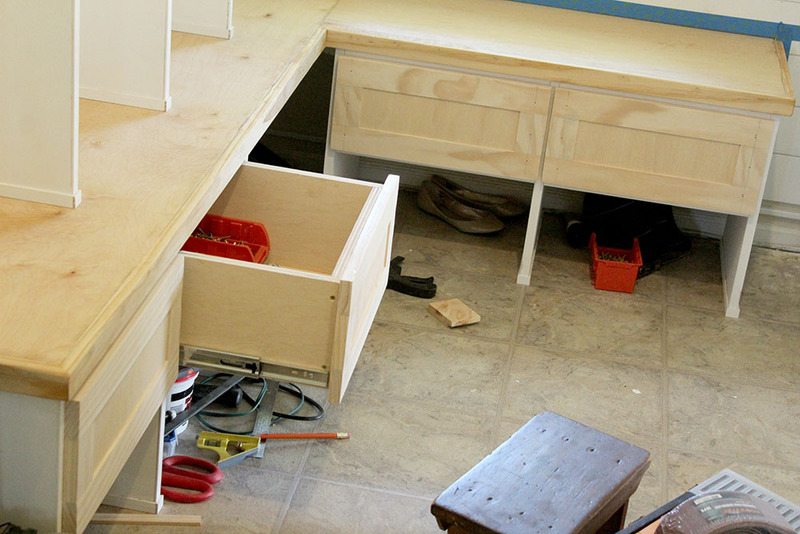 If you want to learn more about making custom drawers, check out my post on building pull-out drawers. 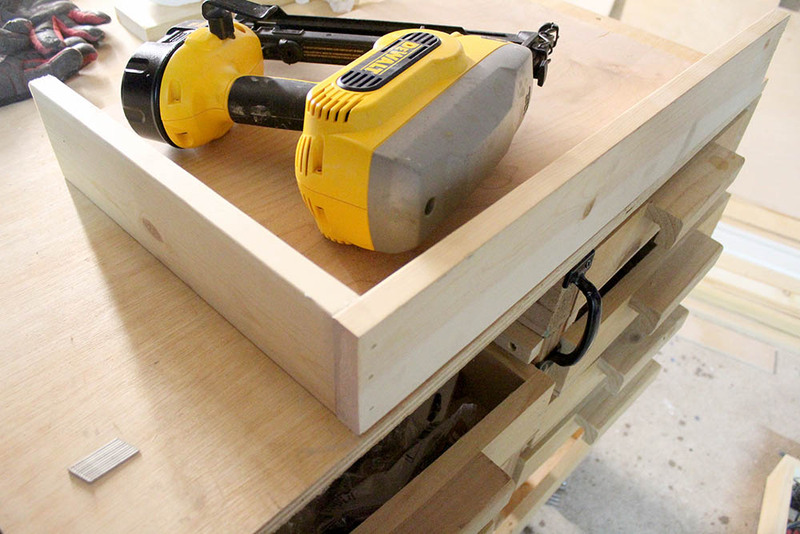 I give all the details on these DIY shaker-style drawers on that post. 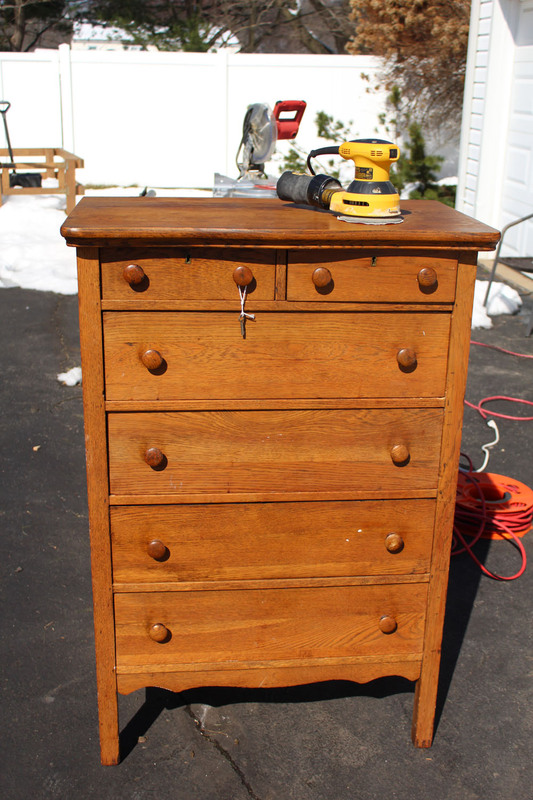 I would later revisit the drawers to add a nice custom shaker-style drawer fronts and handles. 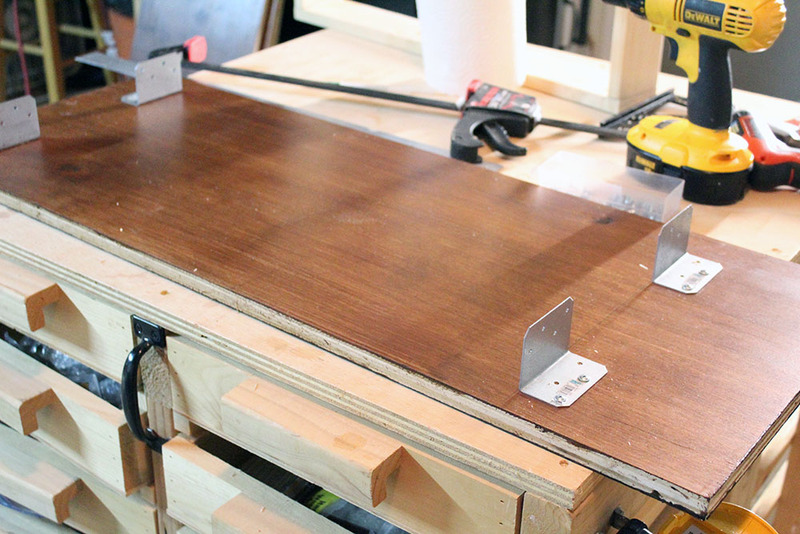 Now it was time to cut the wood for the bench tops that would attach to the lower cubbies. 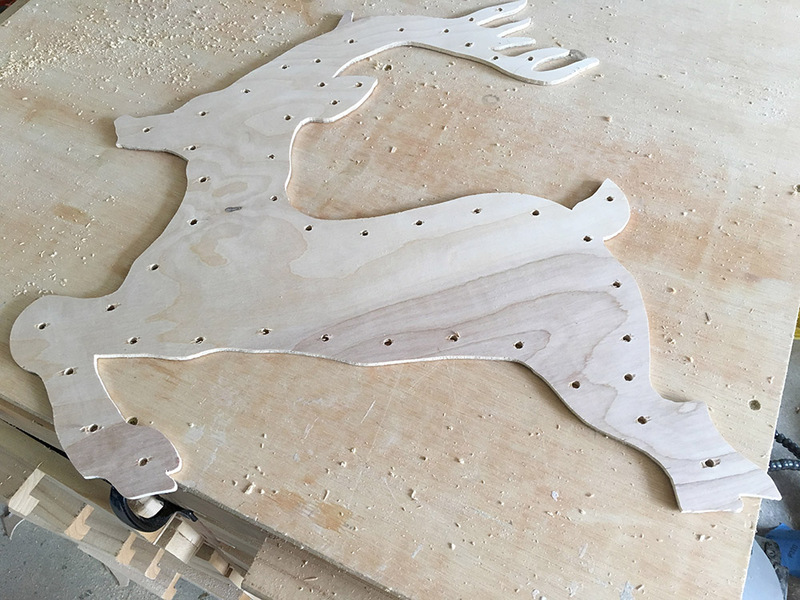 I used two pieces of ¾” plywood and cut them to size. 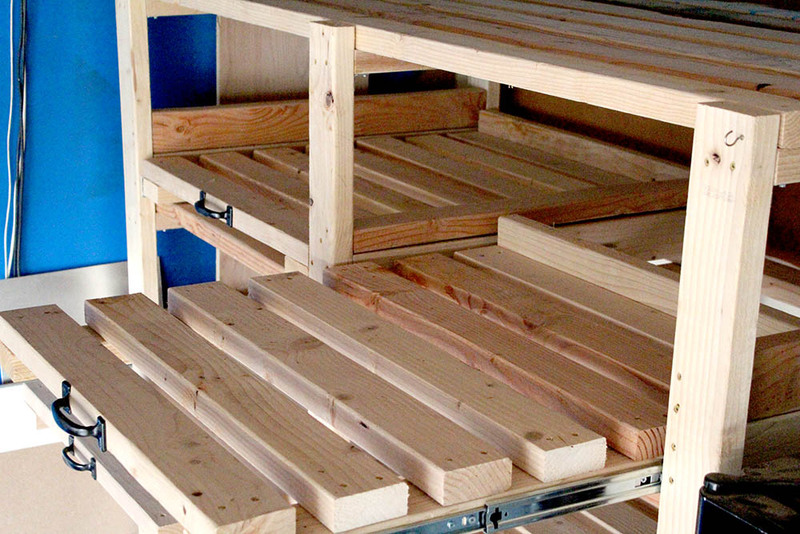 I secured the two plywood benches to the cubbies with construction adhesive, and inserted screws from underneath. 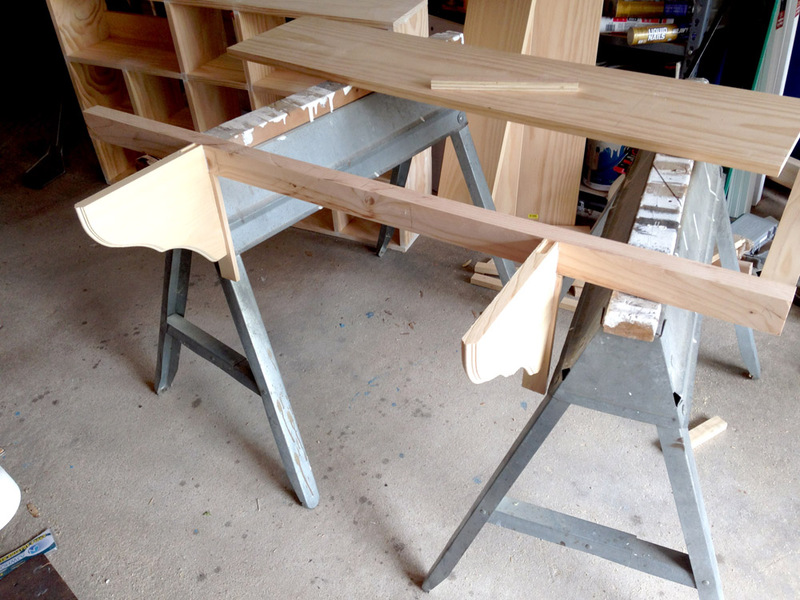 I used my miter saw to cut the corners of the trim at 45 degrees, so all the pieces would fit seamlessly together. 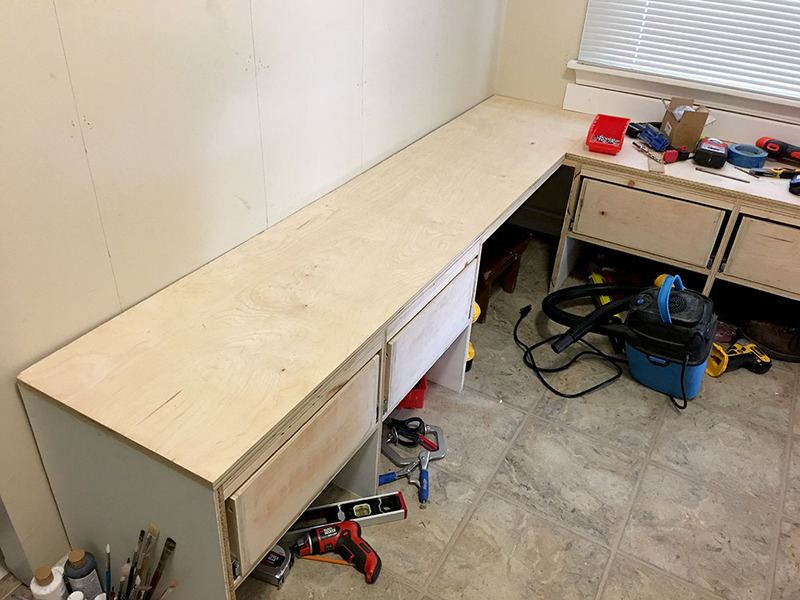 Then, I attached the trim to the plywood benchtop with construction adhesive and finishing nails (with the help of my finishing nailer to speed things up). Afterwards, I gave the trim edges a light sanding by hand to bevel and smooth them. 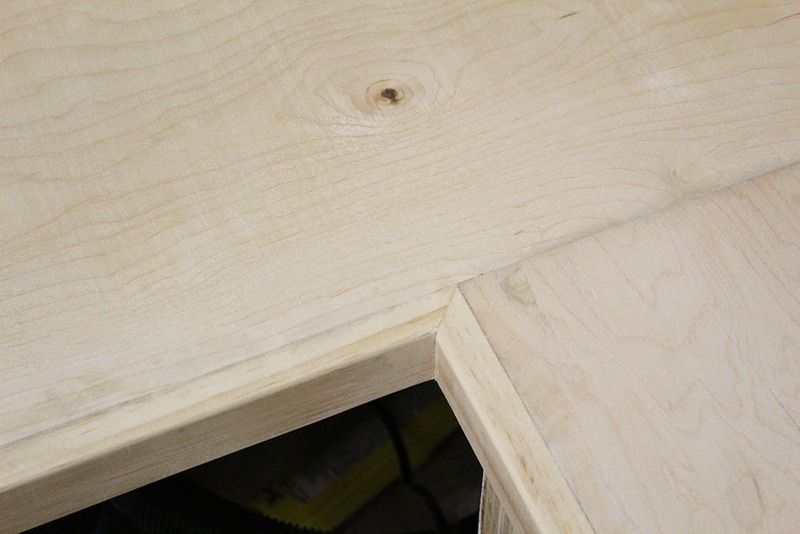 Here’s a neat little trick I did to fill in some gaps and holes after the benchtop trim was installed. Normally I would use wood putty to fill in these spaces, but I had planned on staining the wood and did not want the putty to stand out very discolored (especially since I was planning on using a light, very transparent tung oil stain). So I made my own wood filler. I took sawdust produced from cutting the trim and mixed it with Elmer’s glue. I mixed a little glue at a time, sometimes adding more sawdust, until the mixture was putty like. Then I filled in any gaps and holes with my custom made wood putty. After it dried, I sanded it down. The end result was great. My custom made wood putty produced a near perfect color match filler. 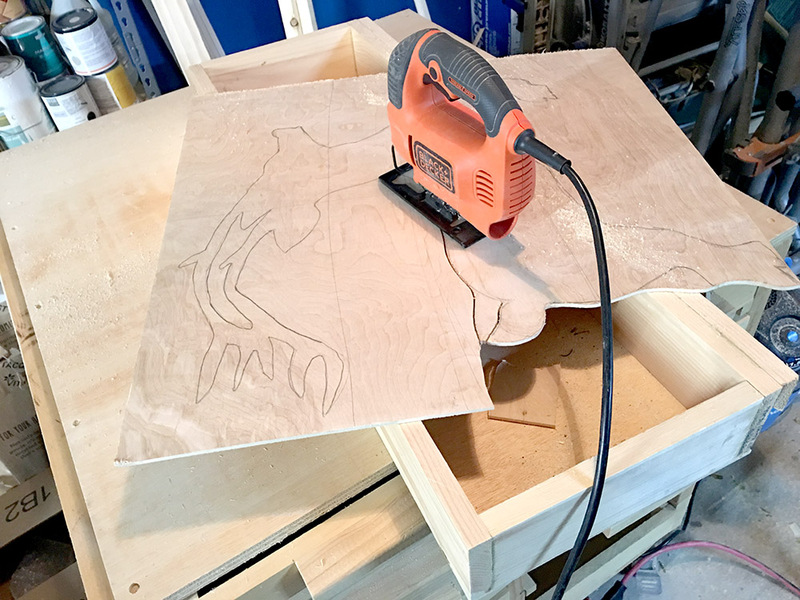 I did originally make the mistake of mixing the sawdust with wood glue on my first attempt. It was a bad idea. The mixture dried so hard that it was nearly impossible to sand off. 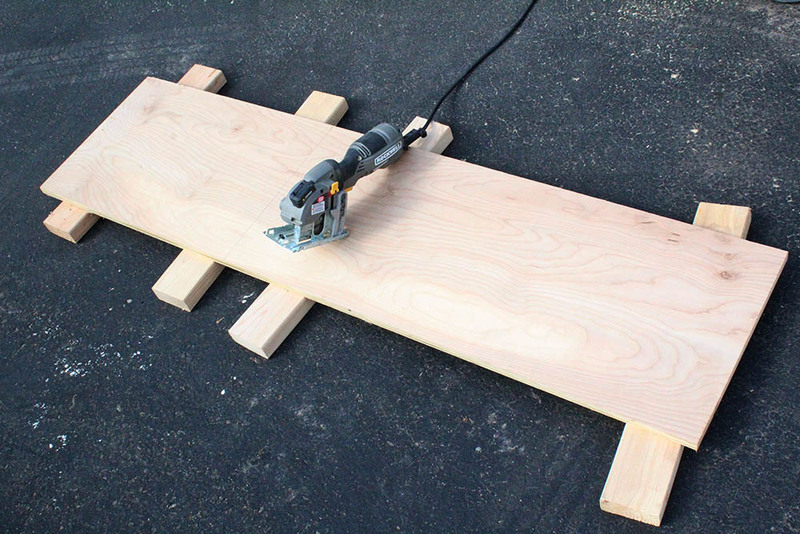 So make sure to use Elmer’s glue if you’re using the trick on one of your own projects. 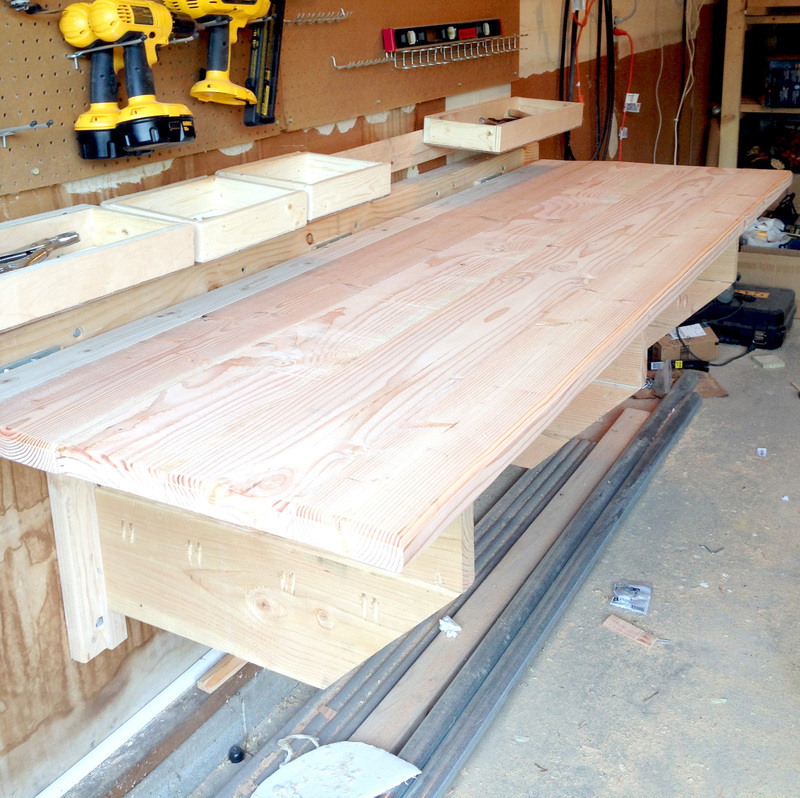 Next I started the process of applying Tung Oil to the benchtop. 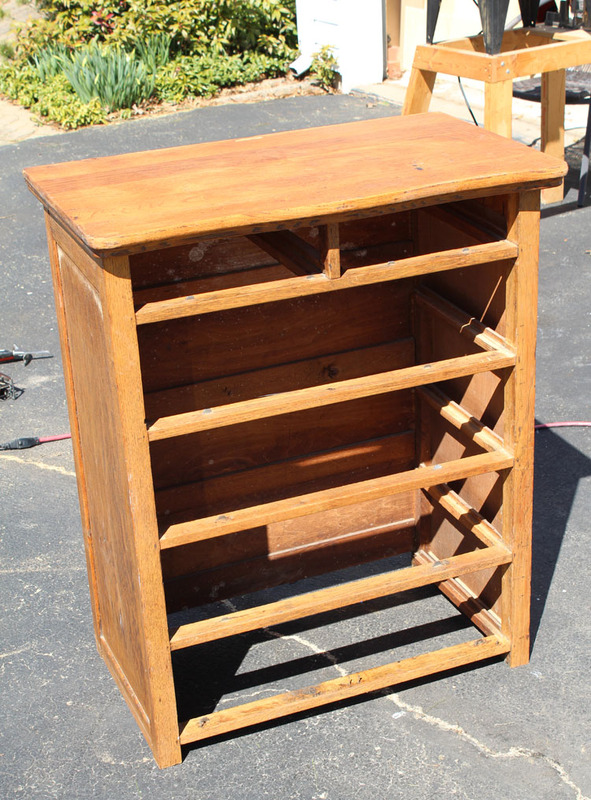 I opted to use pure Tung Oil for this project. It was going to be a little more work and time, but I didn’t want to use any chemical-based stains. This meant also staying away from any Tung Oil marketed as “fast drying”. Those meant the Tung Oil was mixed with a chemical to hasten the drying period. 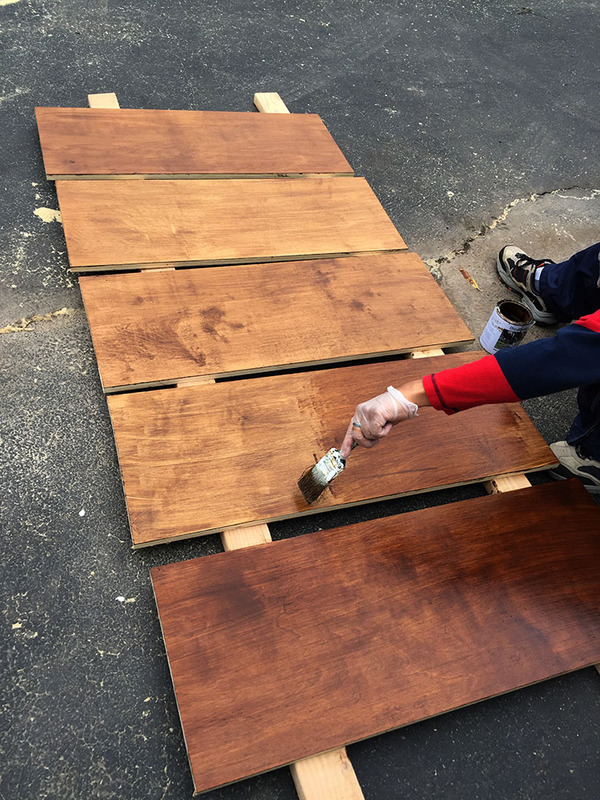 Pure Tung Oil takes several coats spread over a long period to achieve good results. So I rubbed on some pure Tung Oil to the wood with some lint free rags, then gently rubbed off any excess oil sitting on the surface. I was pretty liberal with the amount of Tung Oil, as it was the first coat. Then I let it dry for about 24 hours (or until the surface wasn’t so tacky anymore). The room did have a fairly strong odor of Tung Oil, but at least it wasn’t a strong chemical odor. It was akin to the smell of cooking oil. I made sure the window was open during the day with a large fan. I kept the fan running all night too to help with the drying. 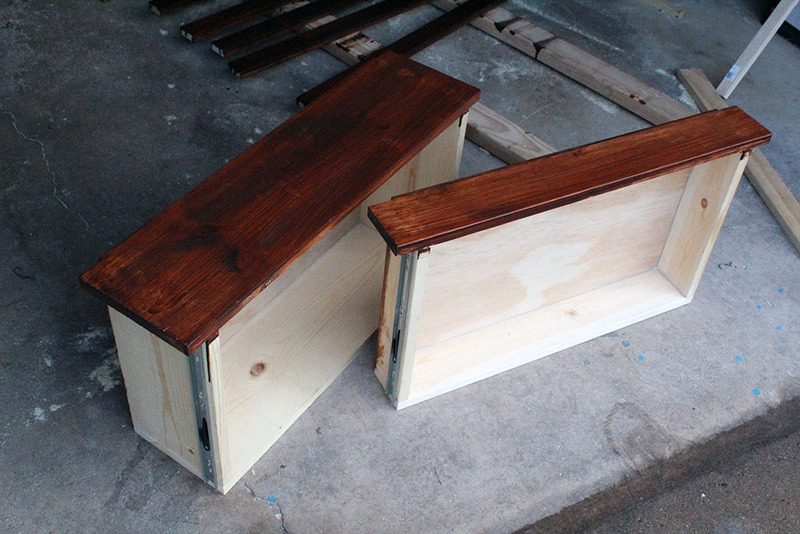 After the first coat was dry, I started the process of applying more coats, about 24 hours apart. I did about 4 more coats in total until I was happy with the color. 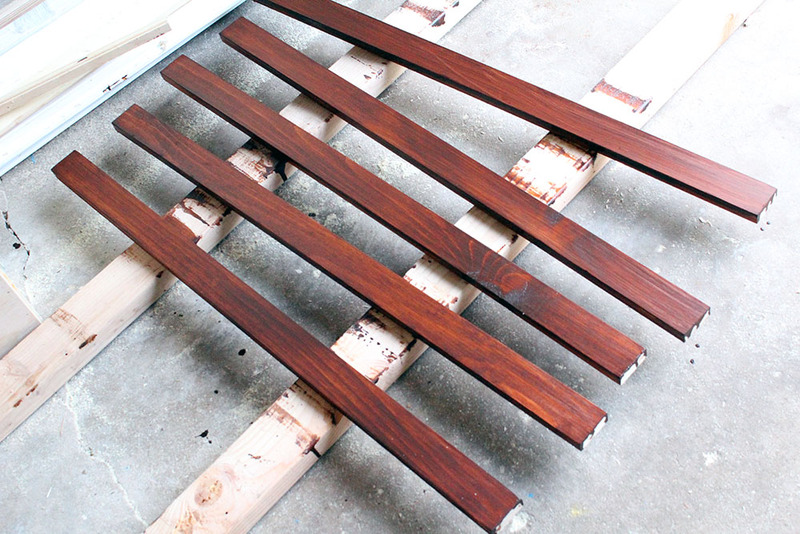 The more coats you do, the darker the stain gets. On these subsequent coats, I did not use rags though. I wet sanded them. This means I lightly rubbed on the Tung Oil stain with very high grit sandpaper specially made for wet sanding (the paper wouldn’t fall apart if sanding while wet). 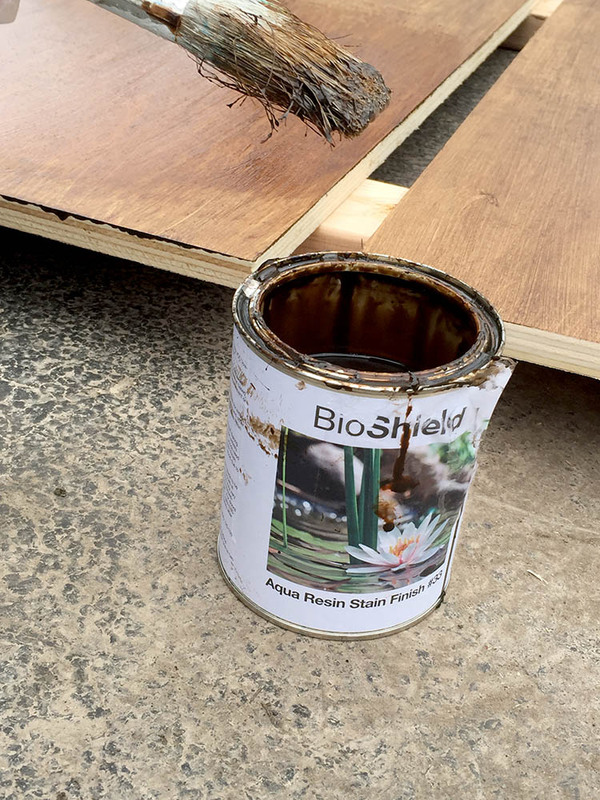 Using high grit sandpaper to apply the Tung Oil resulted in better penetration of the oil into the wood. The lower cubbies were done for the time being. It was time to move onto the upper cubbies. 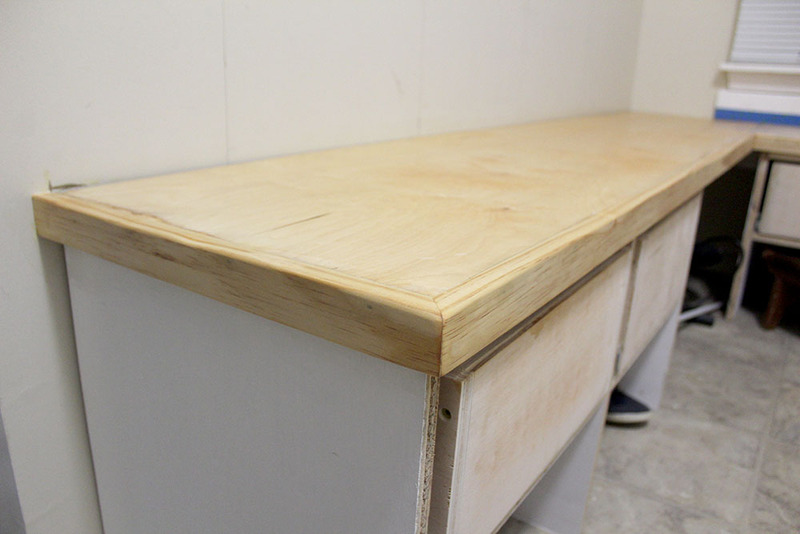 I had to give the Tung Oil stain a few more days of drying anyway before I could work near to the benchtop. 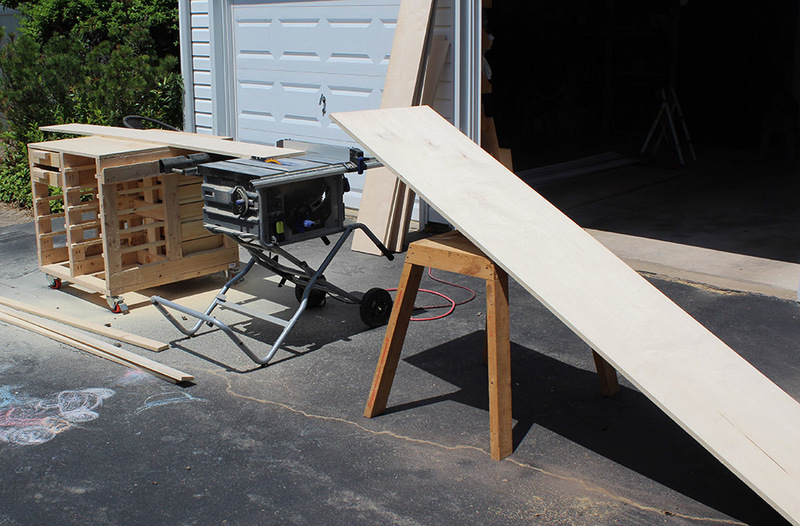 These strips of plywood were going to be the five vertical segments of the cubbies (10.5” x 69.5”), and the header piece (10.5” x 71.25”). 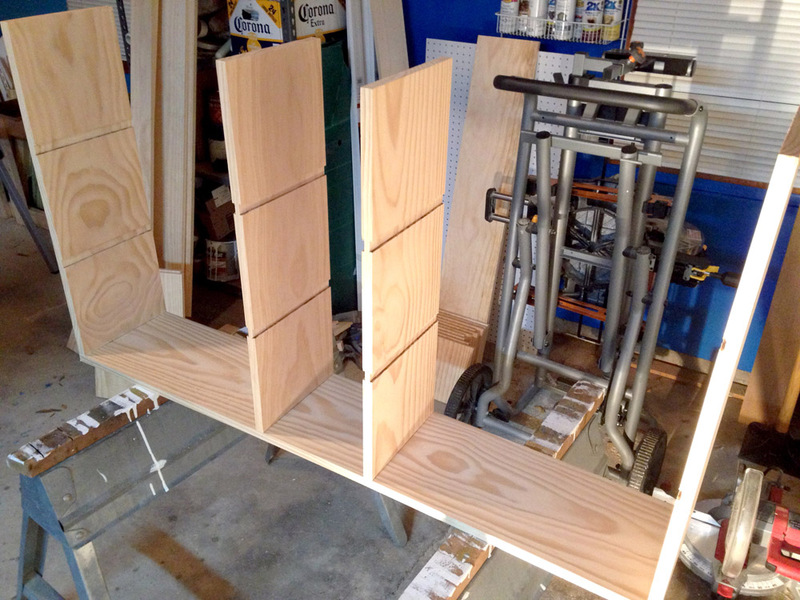 Also, I needed four smaller pieces (10.5” x 17.25”) for some shelves at the top of the cubbies. 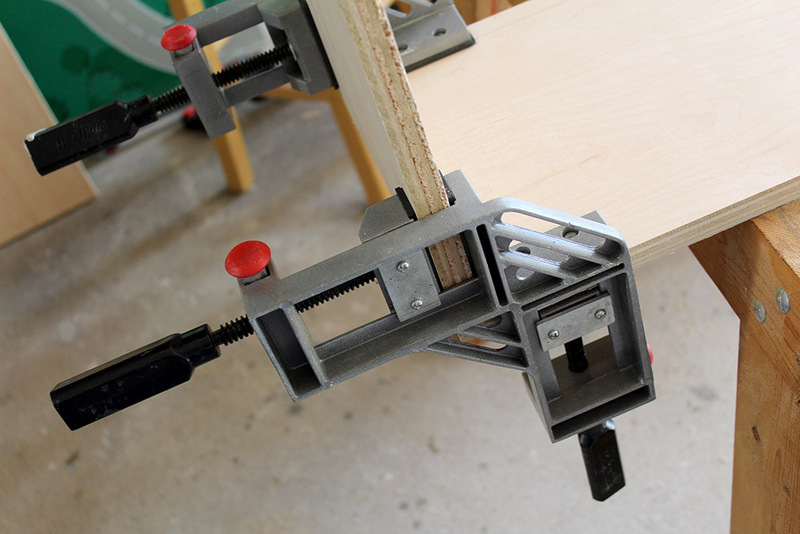 To attach the vertical pieces, I found it super convenient to use a 90 degree wood clamp. Next, I added some more pieces in between the sections. These additional pieces served two purposes. First, they reinforced the cubbies even more. Second, they were going to hold hooks for the cubbies. 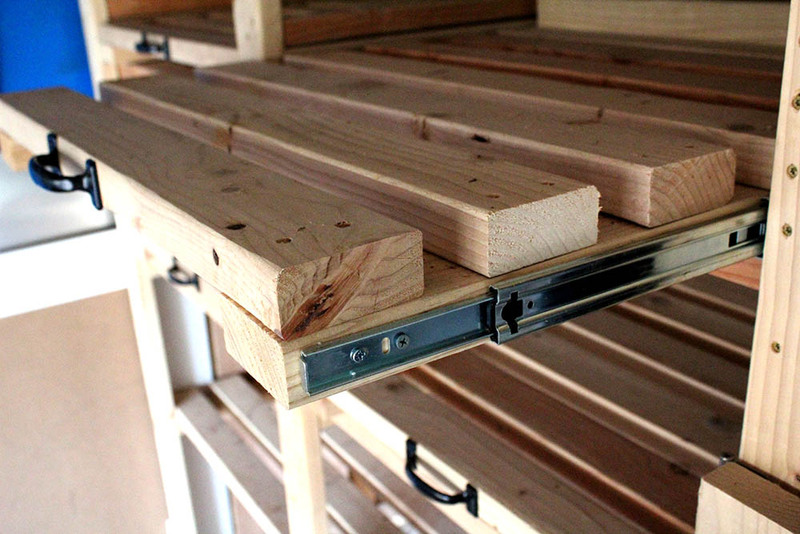 I wanted strong mounting points for the hooks so they wouldn’t fall out, and attaching the hooks directly to the cubby structure made the most sense. 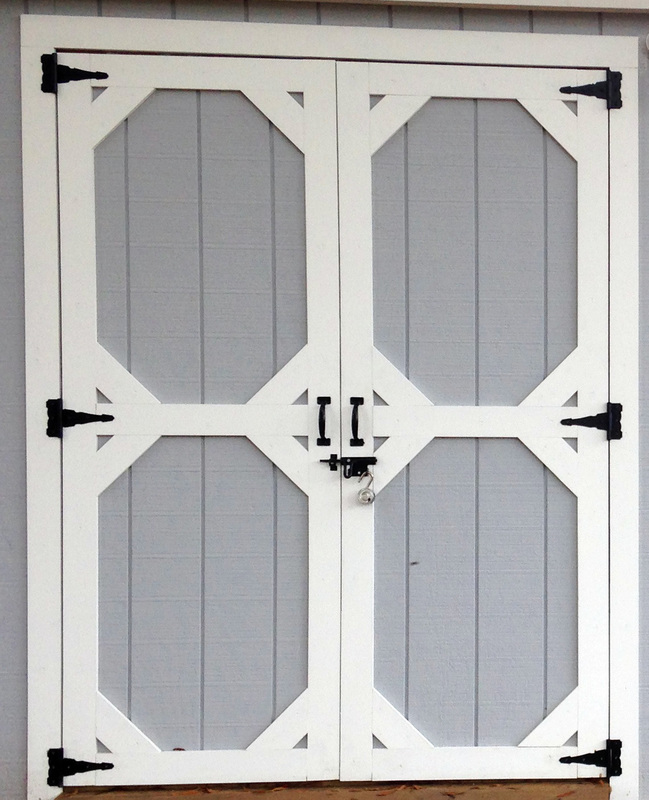 BTW, check out Eileen’s awesome post on using achieving great results with milk paint and raw wood! 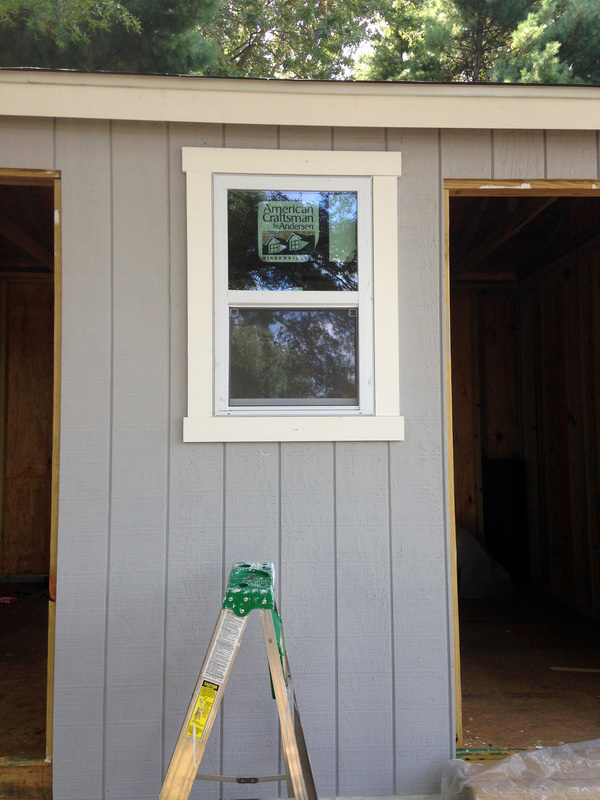 The cubbies were now painted and ready for the mudroom installation. 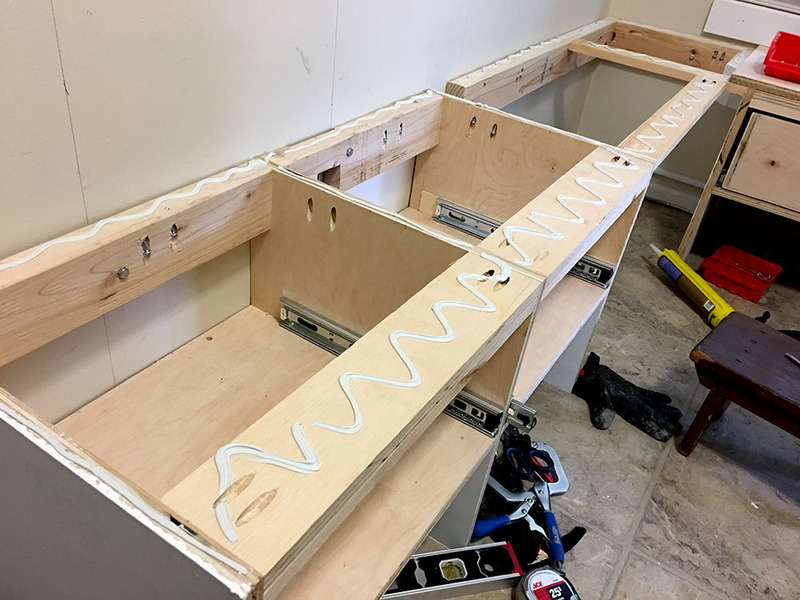 I lifted them onto the benchtop and started securing it to wall studs (I used 3.5” deck screws for this task). I would later fill these pocket holes (using special pocket hole plugs), sand and repaint to hide them. 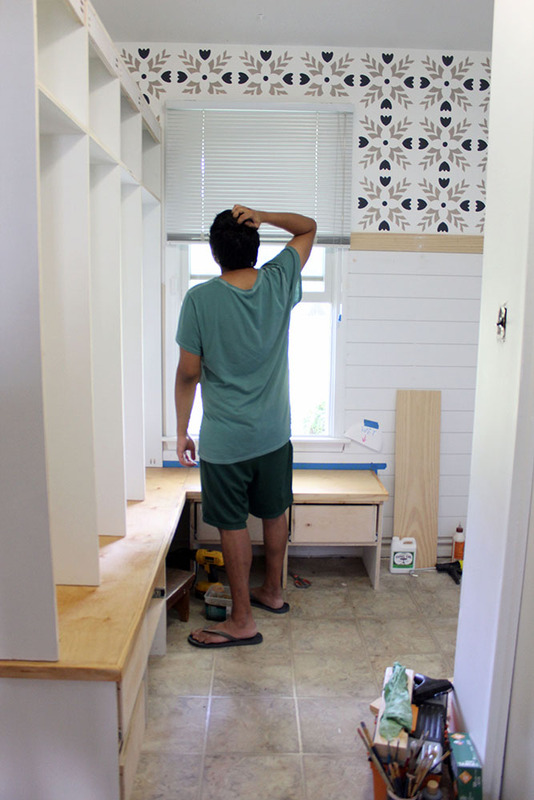 I had already installed most of the shiplap (post coming soon), and Eileen did a wonderful job of stenciling the wall. 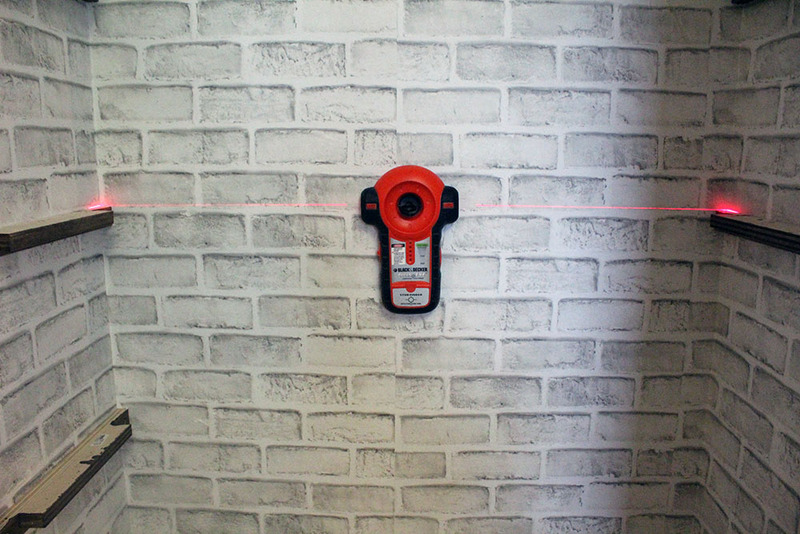 See Eileen’s great post about stenciling walls! At this point in the project, I went back to the drawers to finish them. I custom made some shaker-style faceplates. 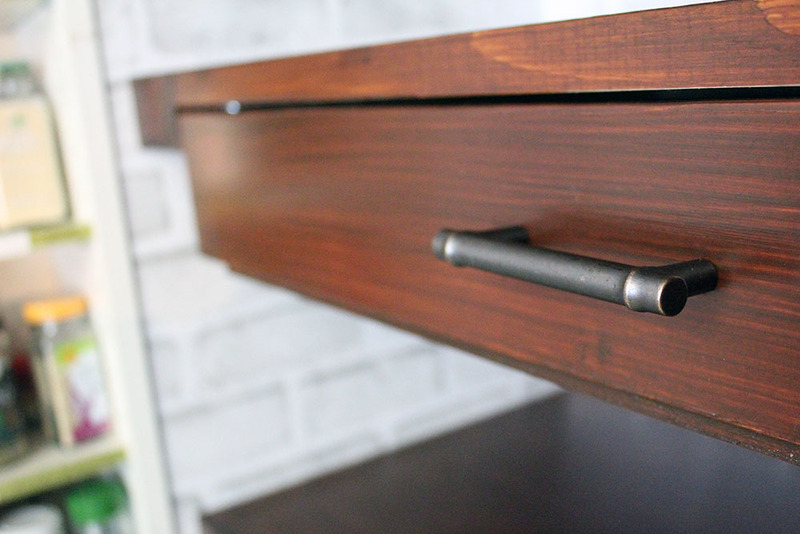 Make sure you read up on my post about making custom drawer fronts for full details. 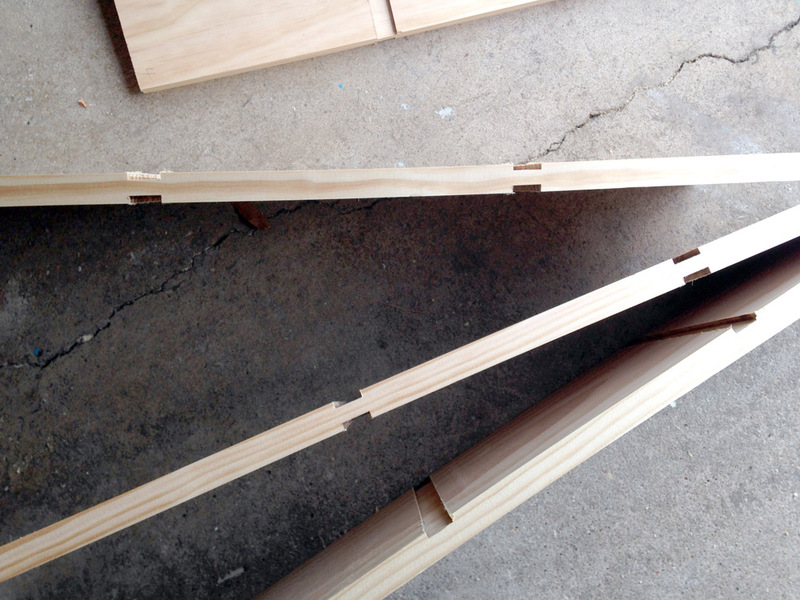 The structural pieces of the vertical cubbies were starting to blend into the shiplap. They only stand out now because they are sanded and unpainted. Notice how I also taped off the benchtop. 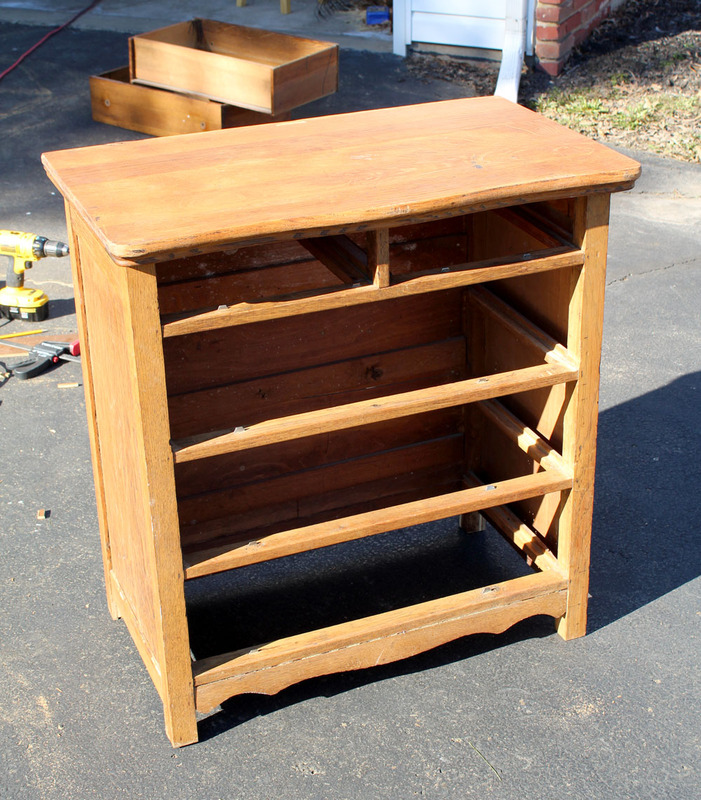 The Tung Oil was still a bit tacky and I did not want sawdust, paint and other debris falling on it as I worked with the upper cubbies. 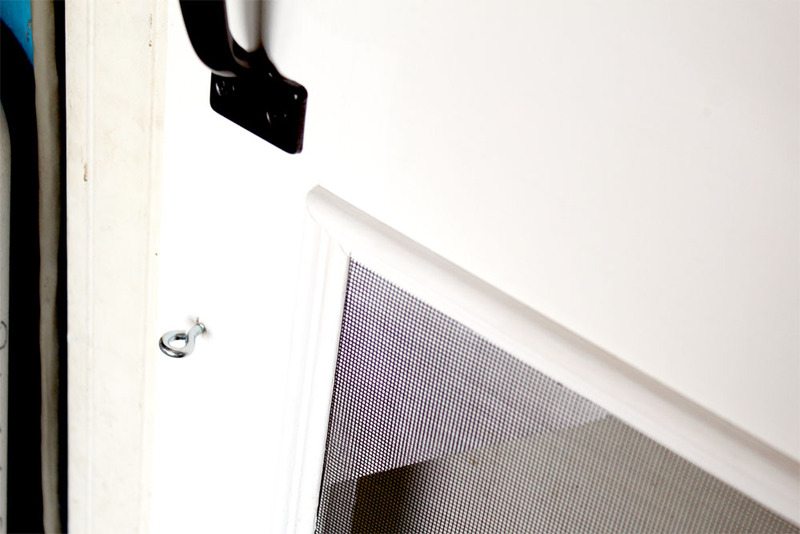 We ordered some simple hooks from Amazon – we used 8 of them on this built-in hall tree. 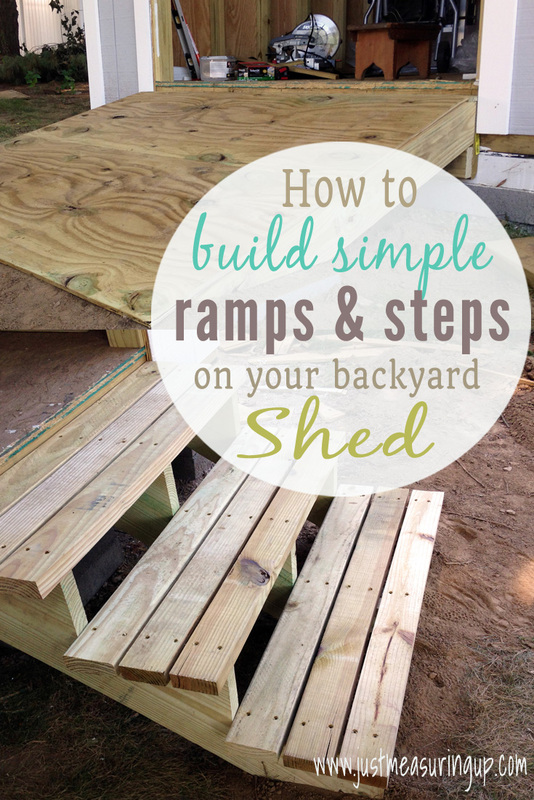 I added them directly into the cubby structure – not into the shiplap. 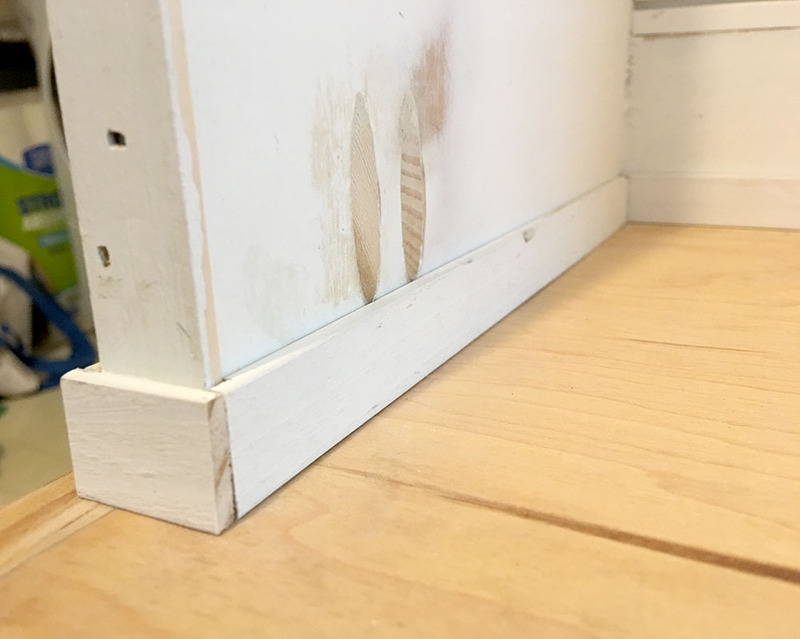 The shiplap wouldn’t have been strong enough to hold the hooks, as the shiplap in between the cubby shelf was only secured to the wall with construction adhesive because of their size. We also have been using 3M command hooks for extra spots on the sides of the locker cubbies. 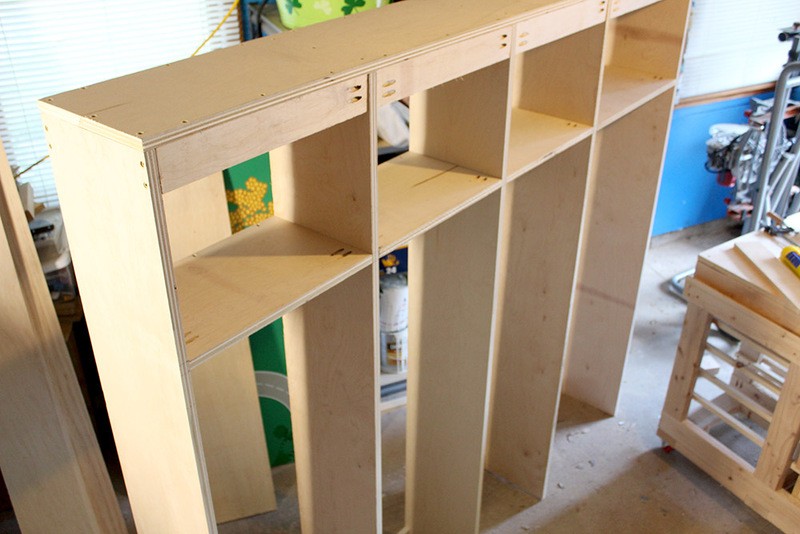 That is an added bonus of putting dividers between each of the cubbies – you get more storage. 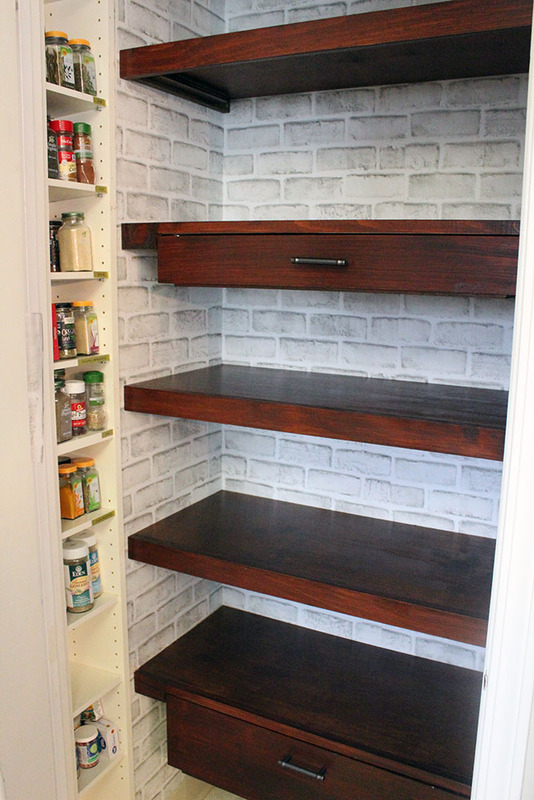 It’s perfect because it gives more space for coats and hats. 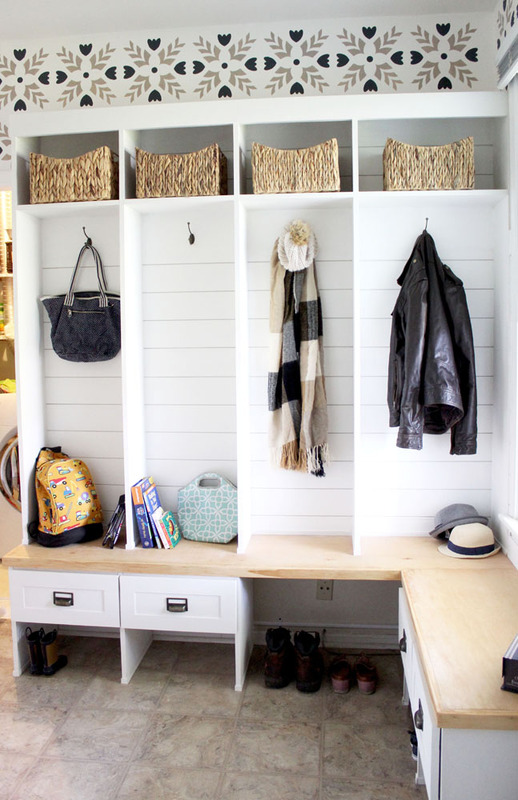 And boy, you can pack a lot of stuff into this built-in entryway storage bench. Shortly afterwards, the project was completed! The Tung Oil technically needed some more time to cure, so I put up “Wet” signs to let people know not to sit on the bench. I gave the Tung Oil about two more weeks to cure before the bench was available for use. Amazing isn’t it! Eileen and I love our new mudroom cubbies. Everything has its place. 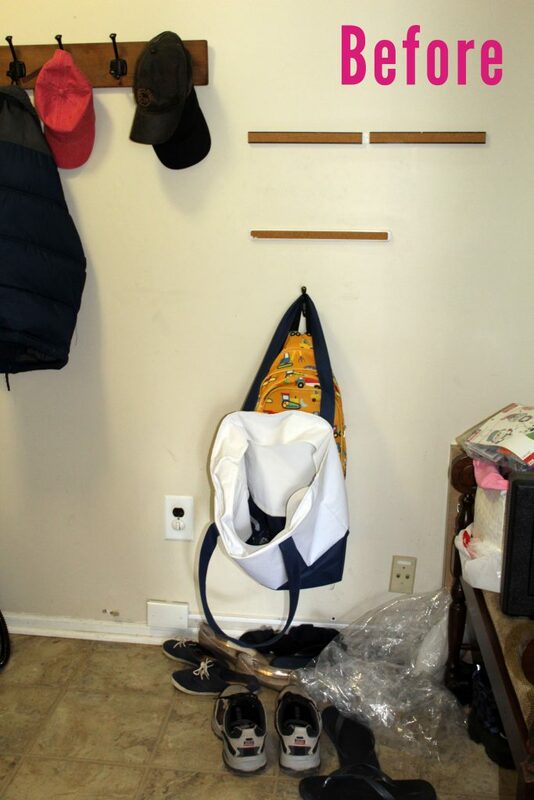 All the shoes are tucked away and coats and bags hung neatly on the abundant hooks. 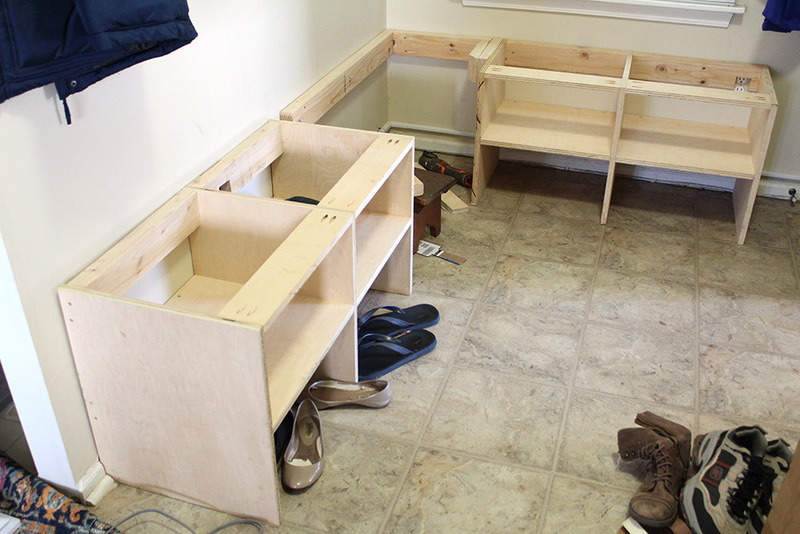 It took about 3 weekends (not full days) to build this decked out entryway storage bench with locker-style cubbies. I did also work a little bit during the week to apply Tung Oil here and there. The cost was $250. Not bad for a huge piece of furniture? 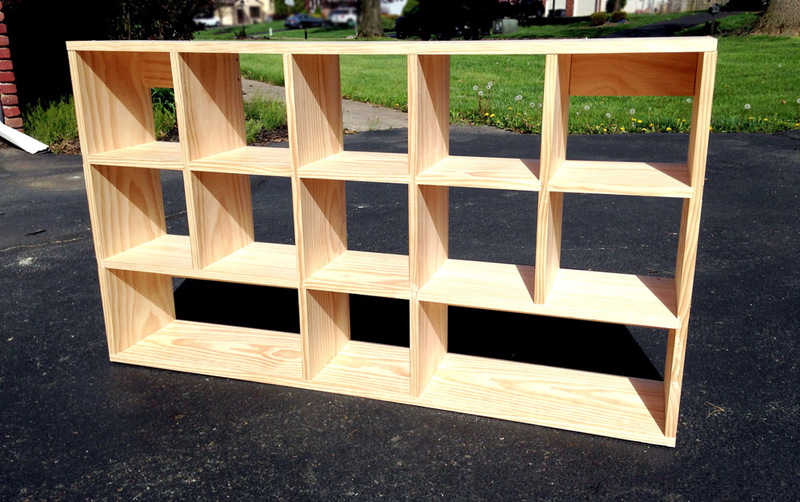 How to Build Simple Wall Shelves Post Preview: In this post, you’ll find out how to build easy DIY wall shelves. 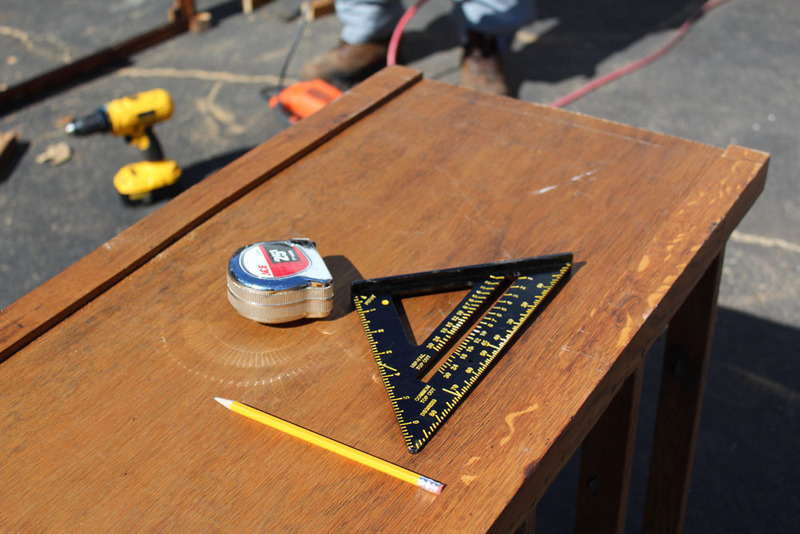 You can customize the measurements to your needs. These shelves perfectly fit 8 fabric storage bins. 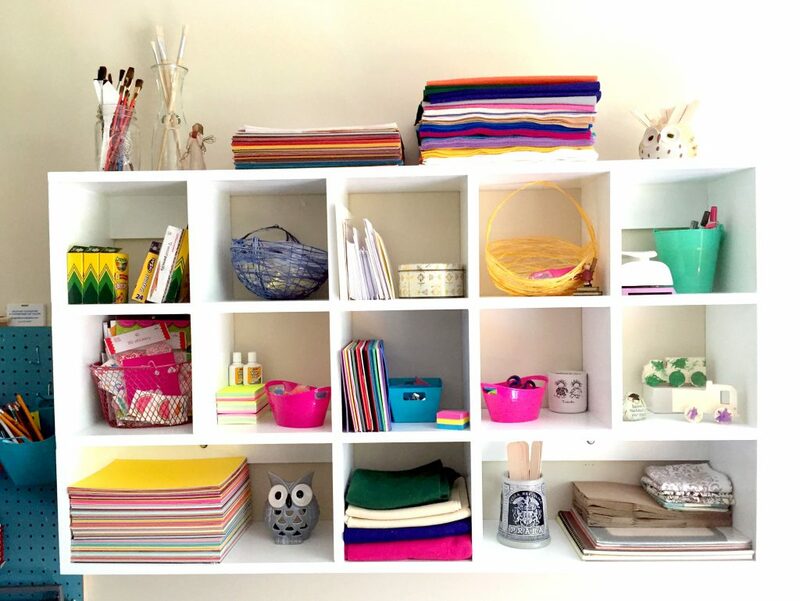 As part of our craft room organization, we turned a haphazard corner of space into a truly organized craft corner. 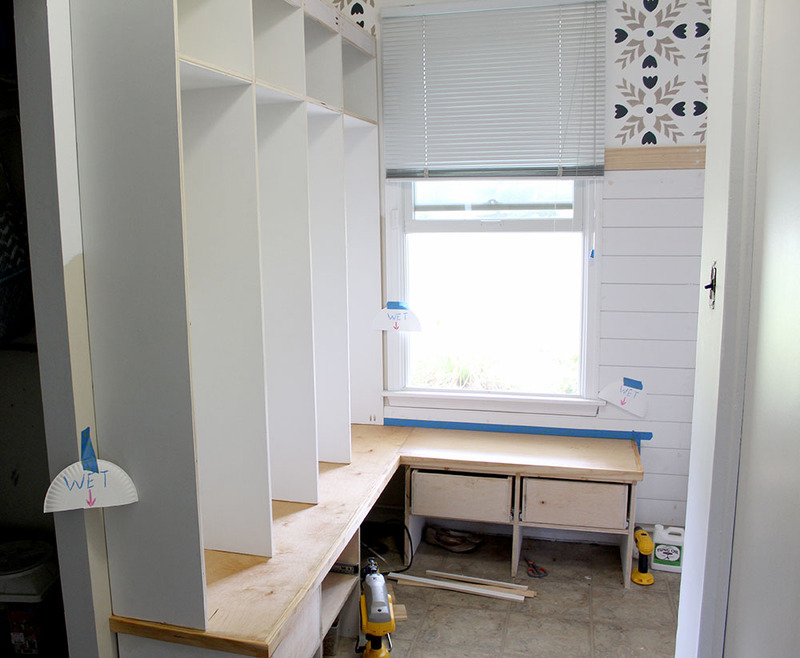 Previously we installed the pegboard and built and mounted a cubby shelf. Last, we are added two simple shelves to go above the pegboard. One of the things we love about doing DIY projects is that you can customize what you are making to be perfect for your needs. 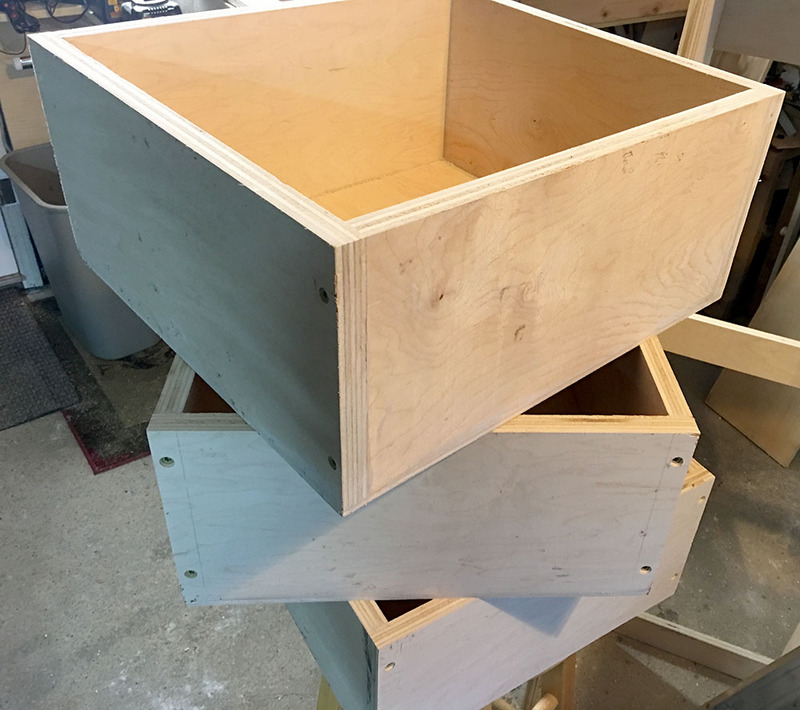 Just like how we made the cubbies to fit tons of scrap book paper, we were making these to fit four fabric storage bins per shelf. 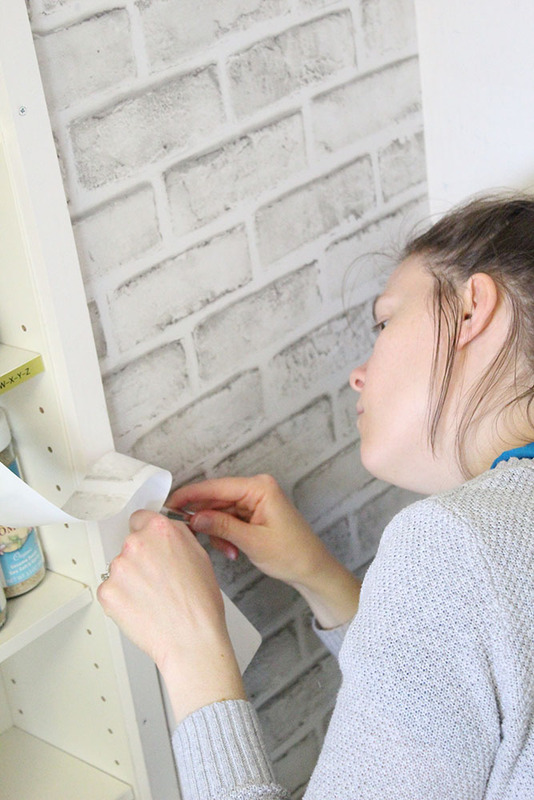 These easy DIY wall shelves are perfect for holding bins. 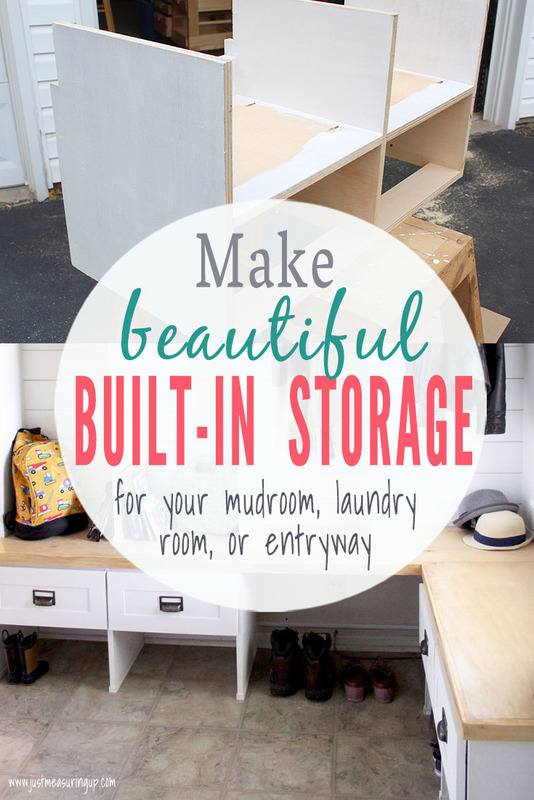 You create customized storage out of just a little wall space and wood. Here’s a before picture of the entire craft corner organization project. 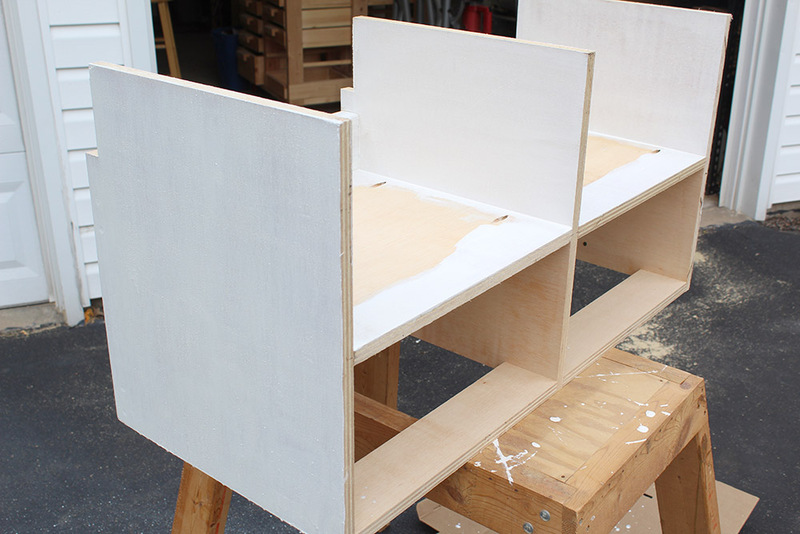 Here’s how we made the final part of the project – the simple DIY wall shelves. 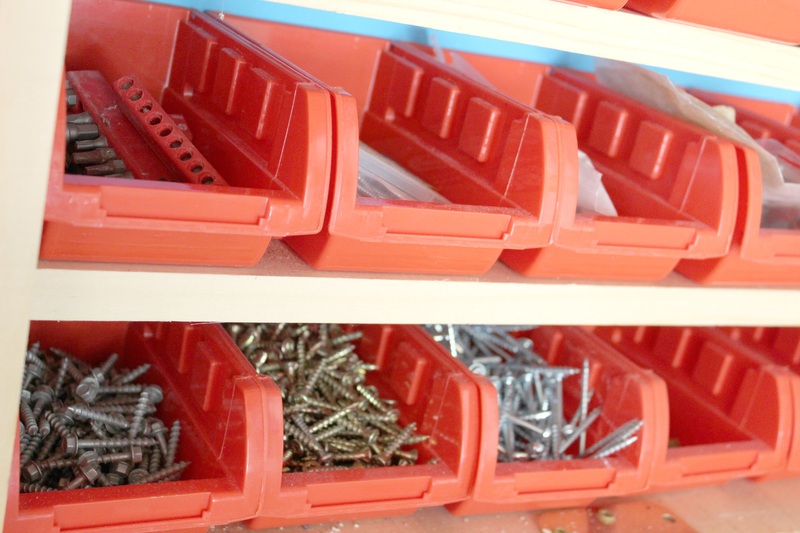 The first step in making these simple storage shelves was figuring out my supplies. First, I needed to find shelf brackets. 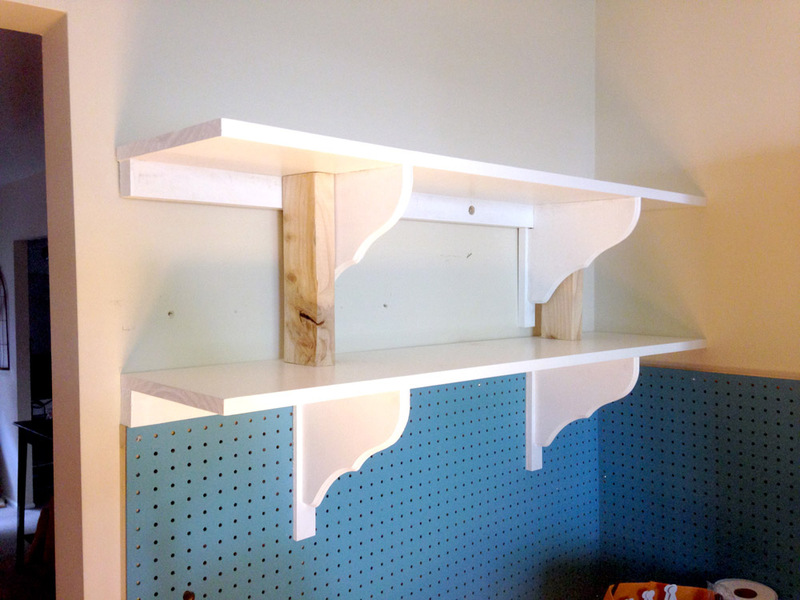 Eileen wanted to use decorative wooden shelf brackets. The only one I could find in stock at Home Depot was decorative but had a max weight capacity of 10 lbs. I knew Eileen would be putting more than 10 pounds of weight on shelves. However, the wood itself felt pretty sturdy. The low load capacity stemmed from the cheap keyhole hangers on the back. The shelves were going to be secured to the wall with lag bolts, so I could ditch those keyhole hangers and just reinforce the brackets. There are lots of ways to put a simple shelf on the wall. 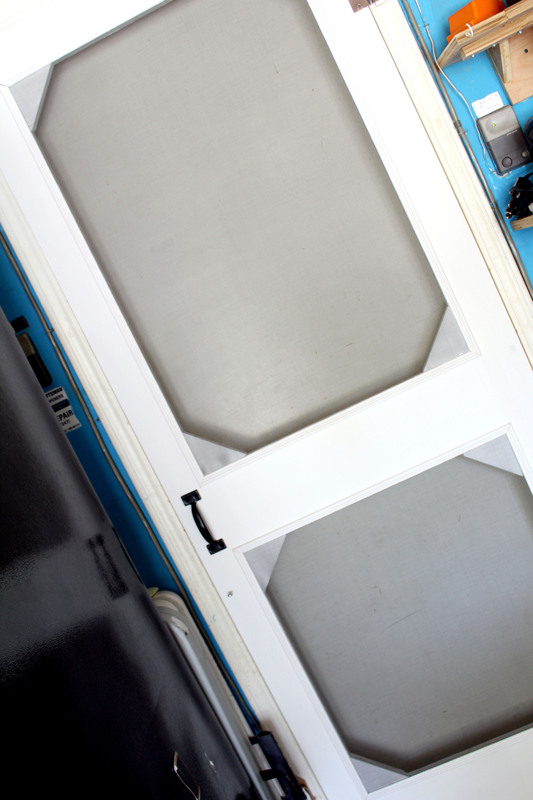 Depending on the design and load bearing capacity of the shelf, you can either attach directly to drywall (with toggle bolts or other drywall fasteners), attach to wall studs (with lag bolts), or a combination of the two. My homemade wall shelves needed to be able to hold a lot of weight, so pure drywall attachment was out of the question. 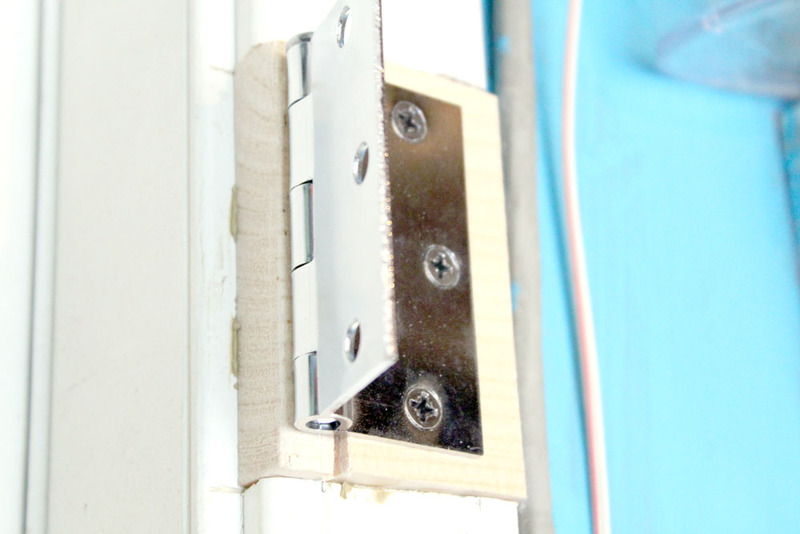 I had initially planned on bolting the wooden brackets directly to wall studs. 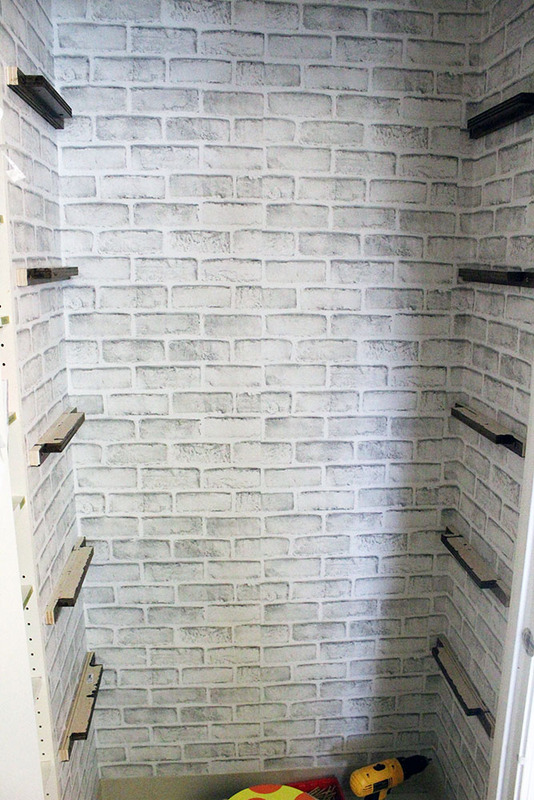 However, the placement of the wall studs was not practical for the look of the shelves. Either the brackets would be really close together, or one side of the shelf would extend very oddly past one bracket. I could attach one bracket to a stud and the other to drywall, but I wanted a more sturdier design. So I came up with an elegant alternative for the craft room shelves. 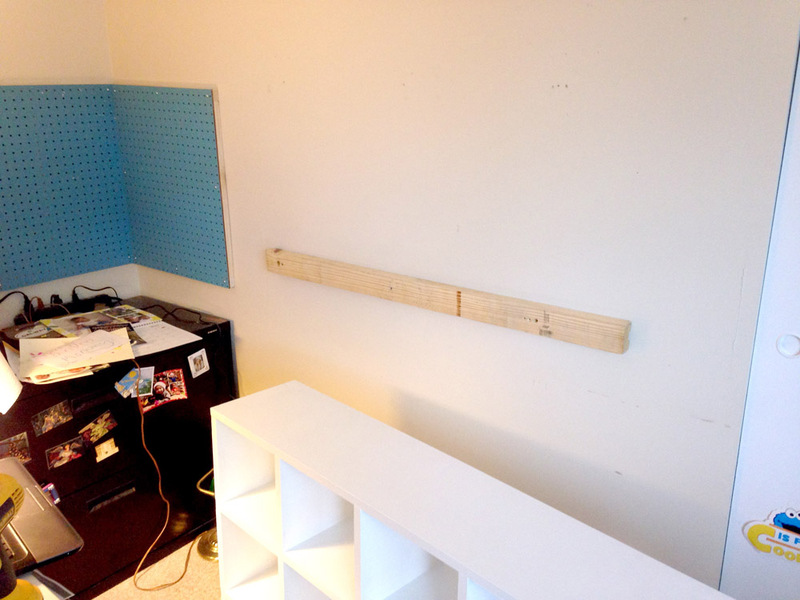 I would bolt a 2×4 directly to the wall studs, spanning the length of the shelf. This would hold most of the load. Then I could position the wooden brackets however I liked, as they would rest directly on the drywall (regardless of stud position). This design was essentially replacing the cheap keyhole hangers (that came with the brackets) with a beam bolted to wall studs. 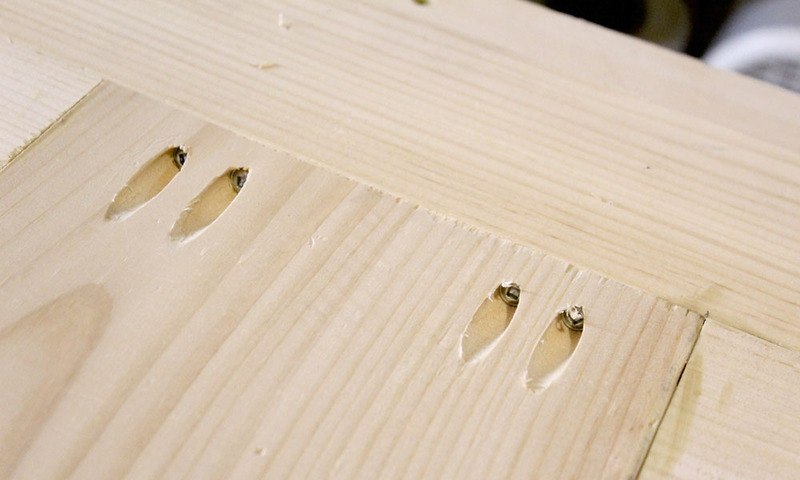 Once turned right side up, the surfaces currently facing you would be pressed flatly against the wall, and lag bolts would secure the 2×4 to wall studs. 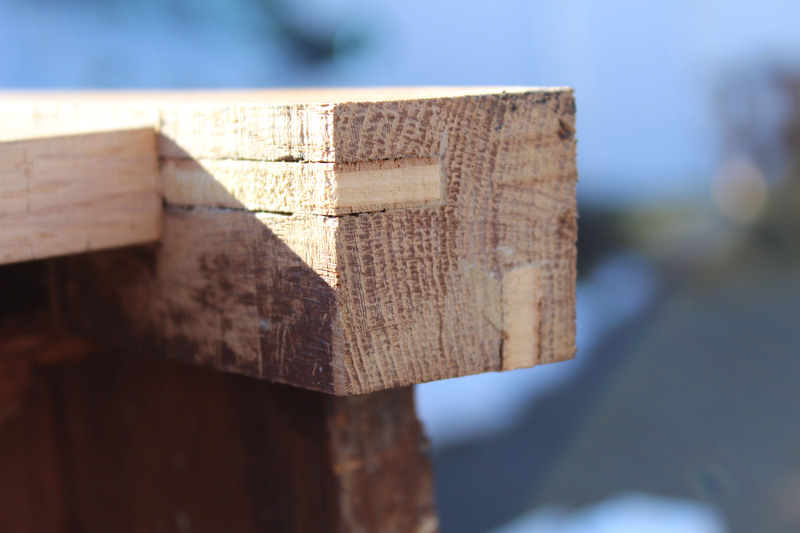 See how the vertical surface attached to the wooden bracket wasn’t flush with the 2×4? 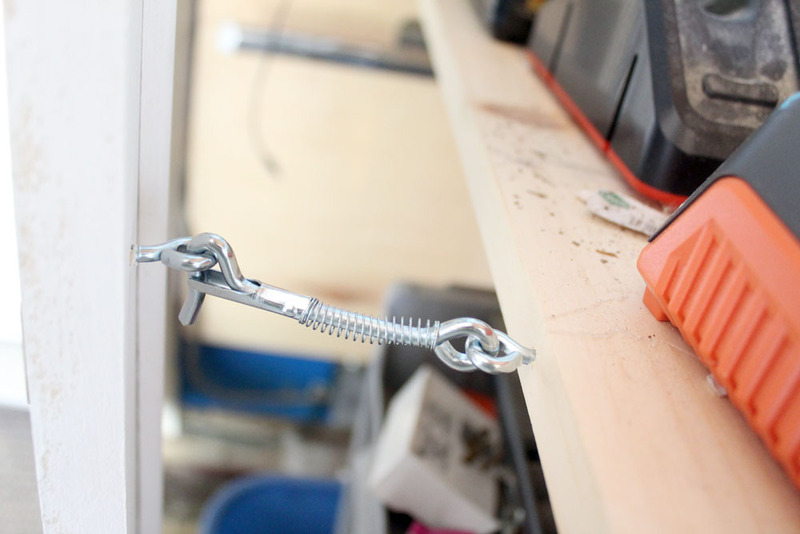 It’s because this shelf mount was going to rest directly on the pegboard. 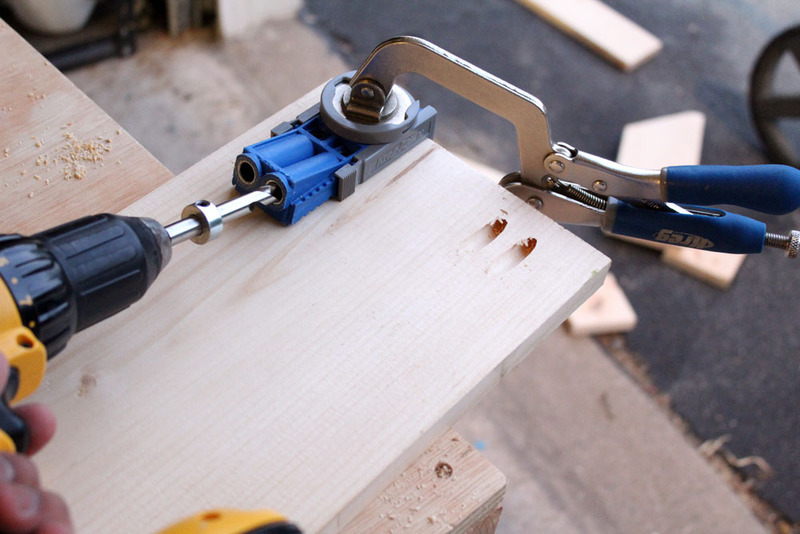 So even though the 2×4 would be bolted to the wall, the wooden brackets would sit on the pegboard. Eileen requested this design as it looked really good visually. So I had to offset the brackets for this mount to account for the depth of the pegboard. This wasn’t an issue with the second shelf mount, as it would rest entirely against the wall. 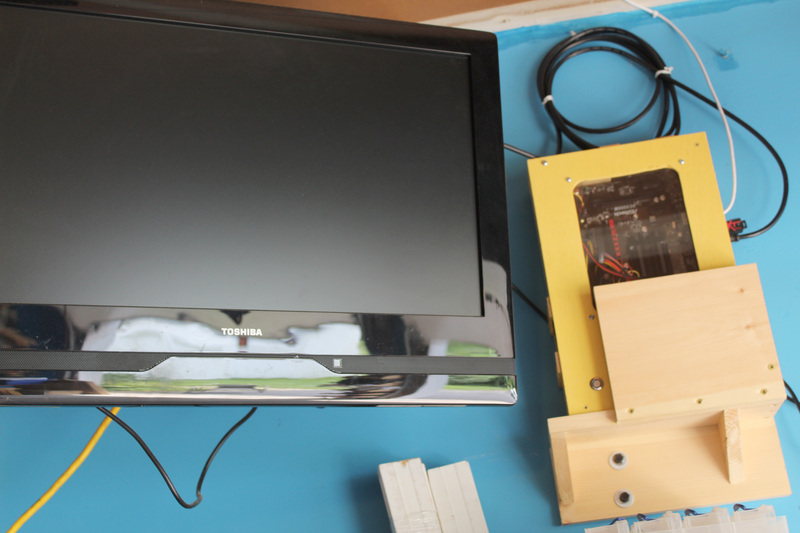 For the construction of the mount, I used construction adhesive and deck screws. 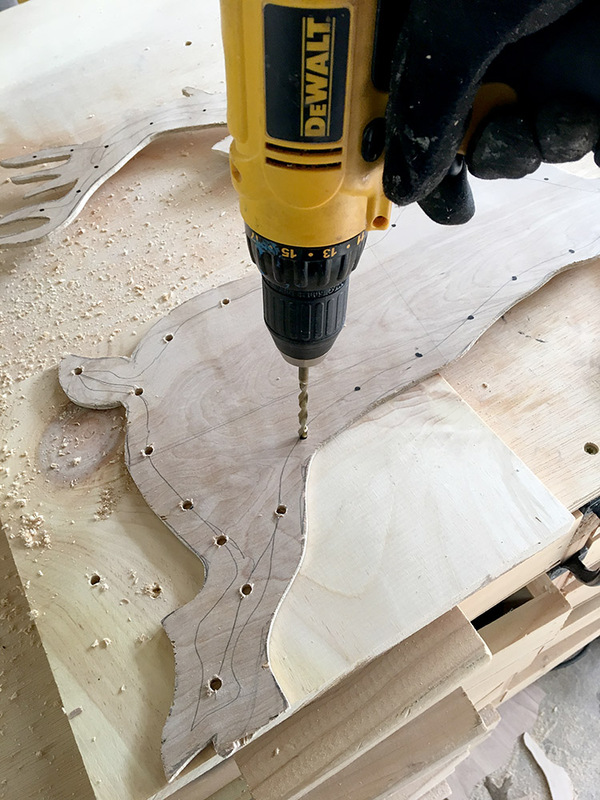 It was critical to pre-drill all the screw holes with a countersinking bit. 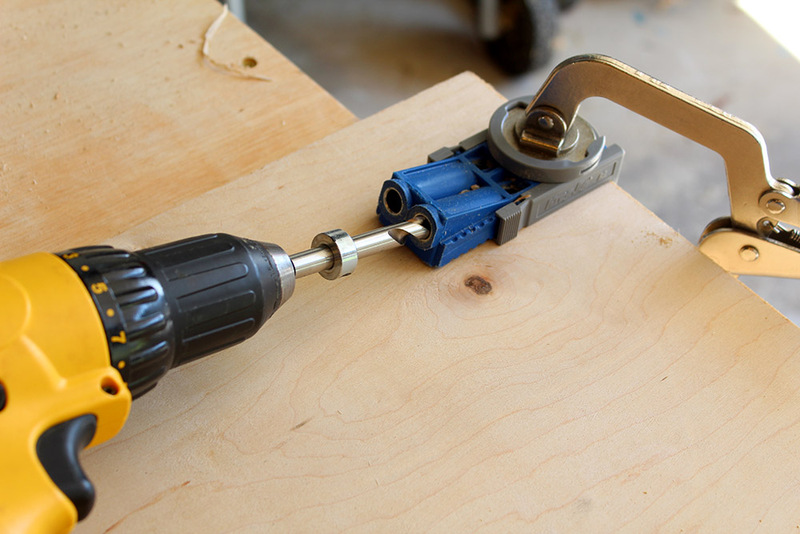 I had used a ¾” Forstner bit to make a hole for the lag bolts. 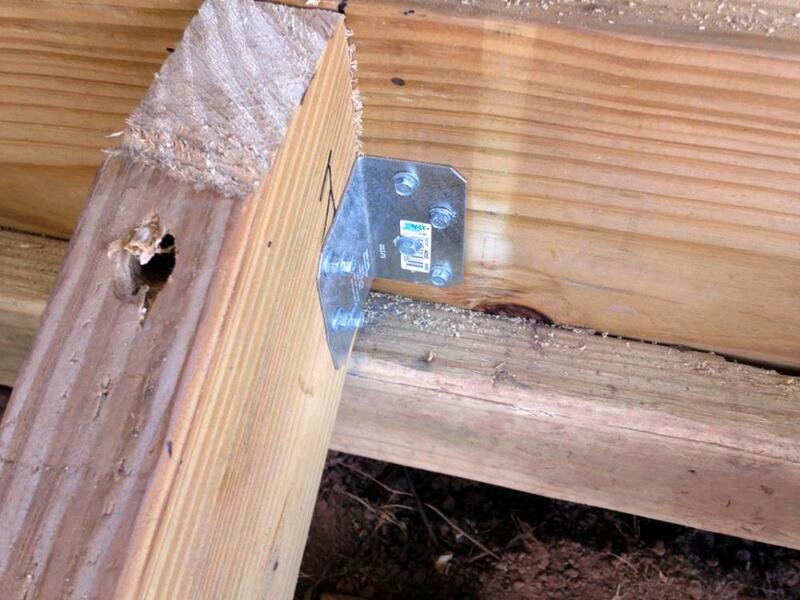 This would prevent the lag bolt heads from sticking out past the surface of the wood. For an even more aesthetic touch, I planned on covering the holes with some mushroom head screw hole plugs. In no time, the last construction part of the craft room storage and organization project was completed with these homemade wall shelves. 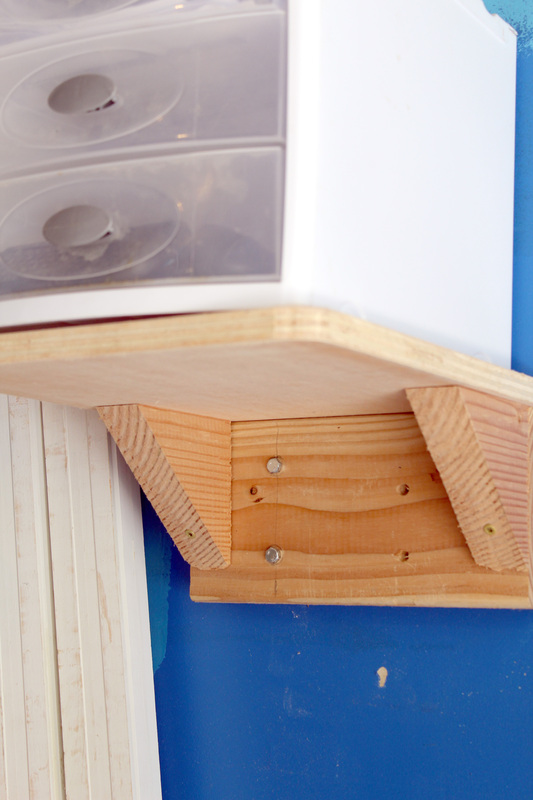 These simple storage shelves were very easy to attach. 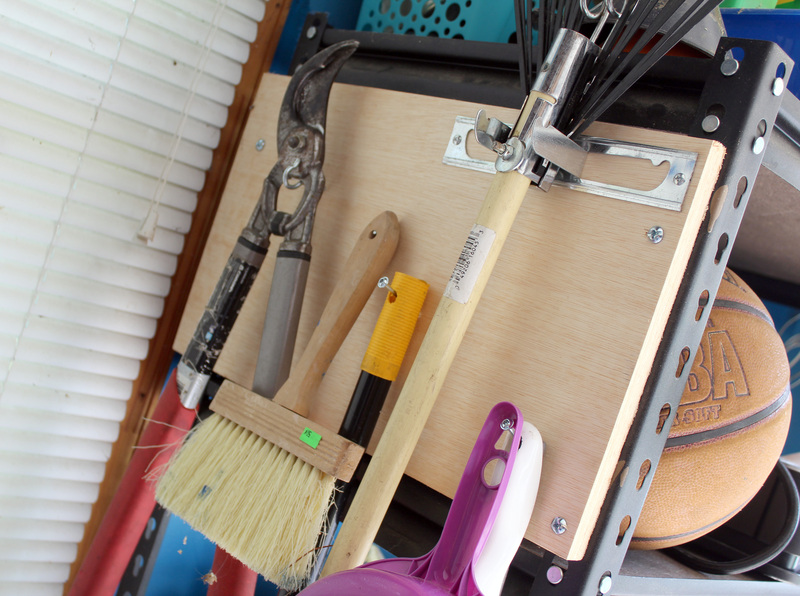 I rested the lower shelf directly on the pegboard and inserted the lag bolts. Since the pegboard was already level, I didn’t have to worry about this shelf being uneven. 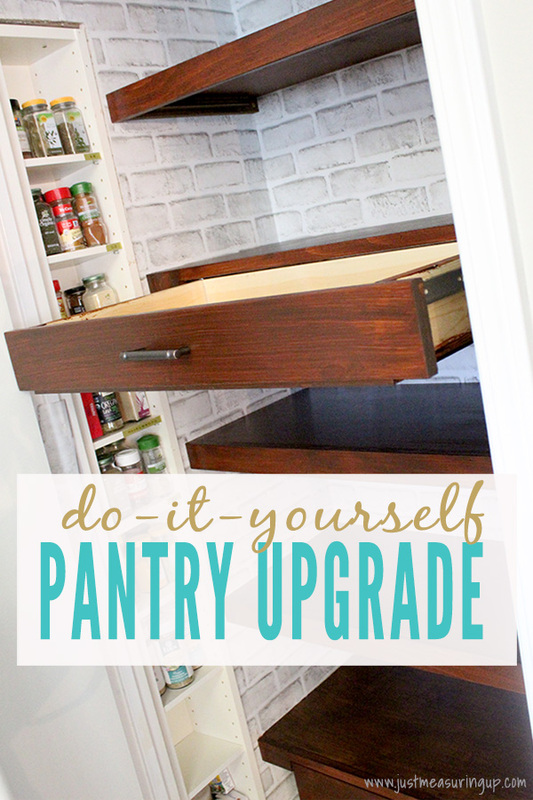 I purposely built the DIY shelves so that four storage bins could fit on each shelf. 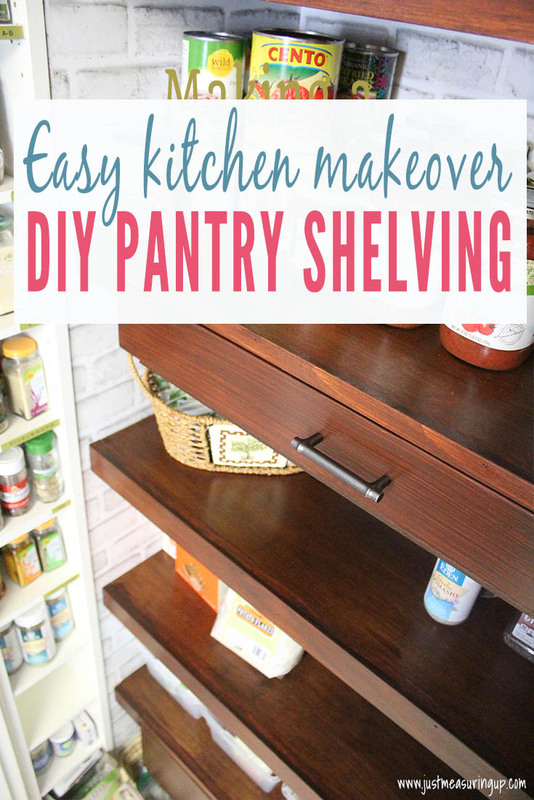 Below is how Eileen utilized these shelves. 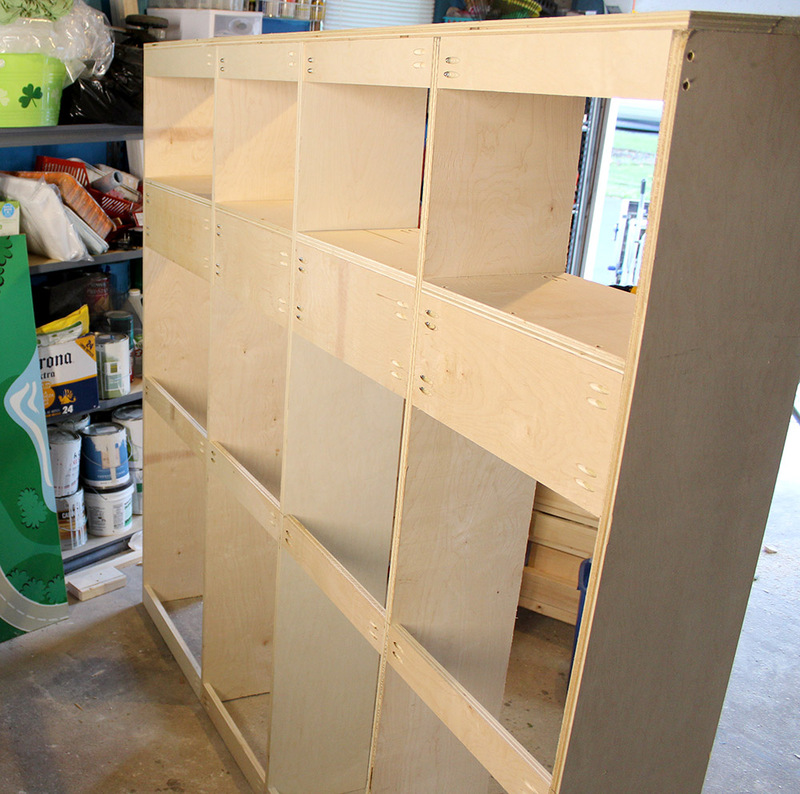 She picked up eight fabric storage bins from the dollar store! 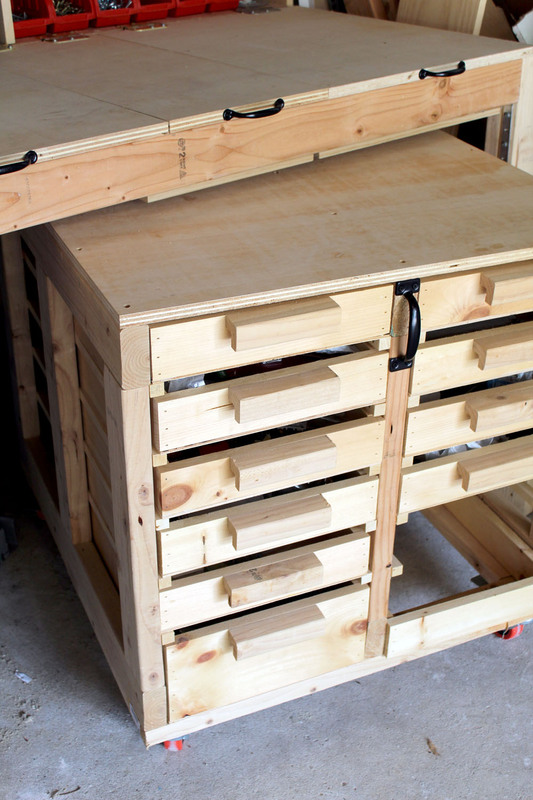 The storage bins aren’t super sturdy but they were perfect otherwise and could easily be reinforced. 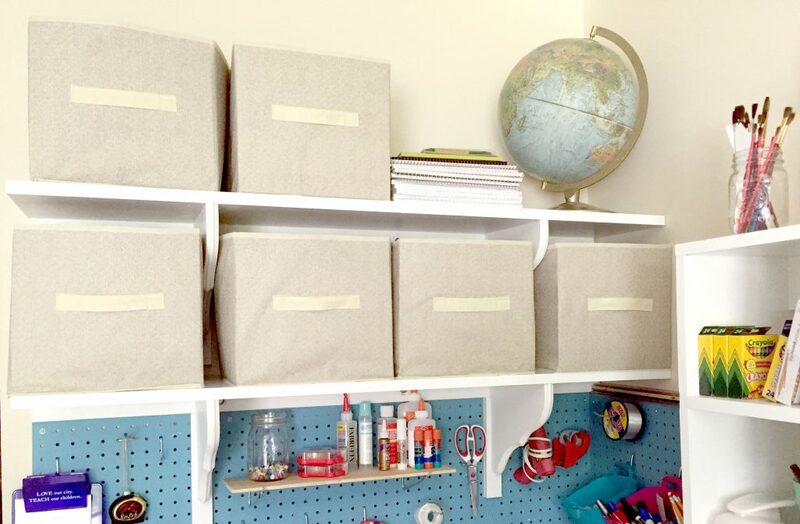 She ended up only using six, but each bin has a purpose – kids crafts, sewing accessories, holiday crafts, felt scraps, and extra office supplies. 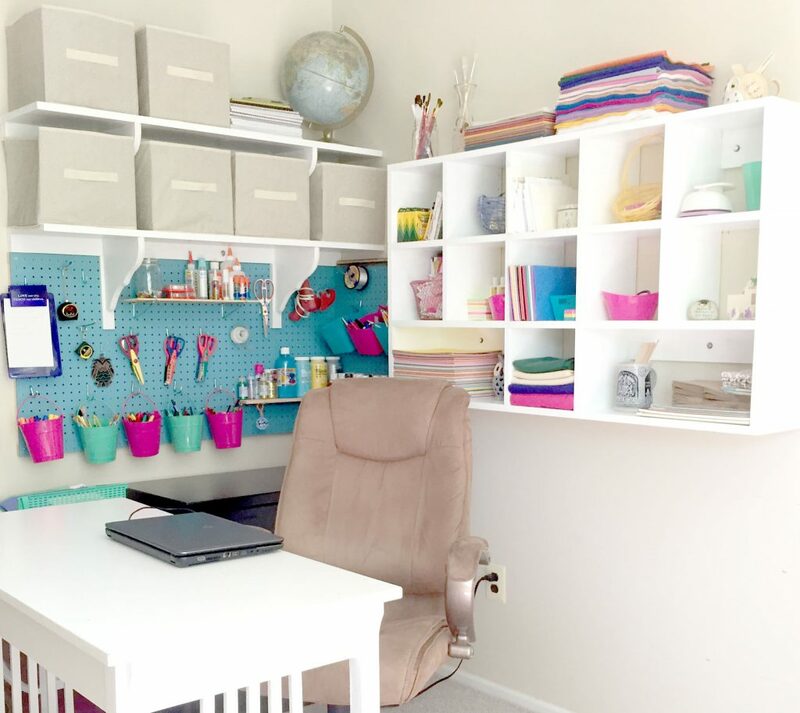 The pegboard, wall shelving, and cubby storage all came together really nicely, providing a plethora of DIY storage space in Eileen’s craft corner. 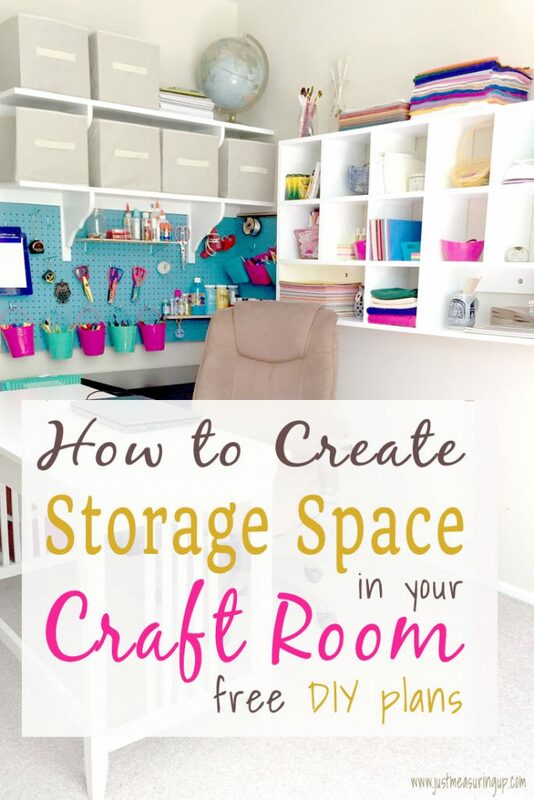 What used to be otherwise wasted space was now turned into a massively organized craft corner – just with wall space! 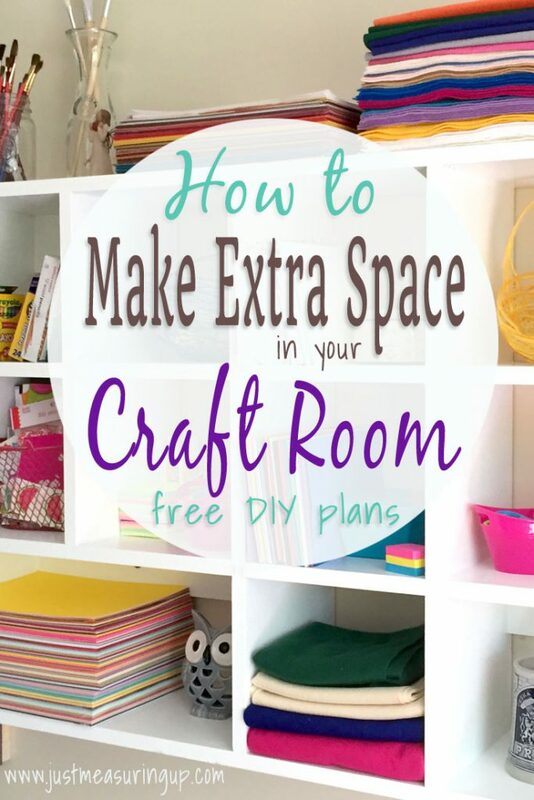 Don’t forget to get our free plans so you can fix up your craft space as well! 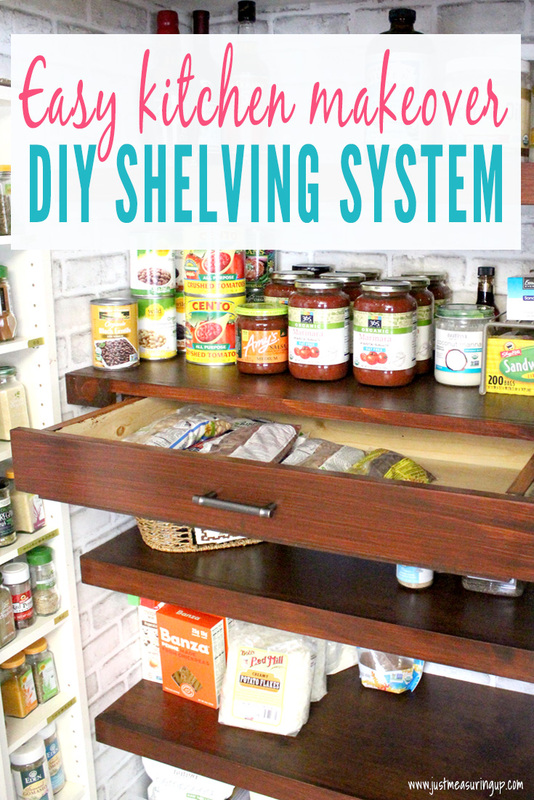 If you are looking for more organization, this quick easy DIY shelves are simple to make and hold tons of storage. 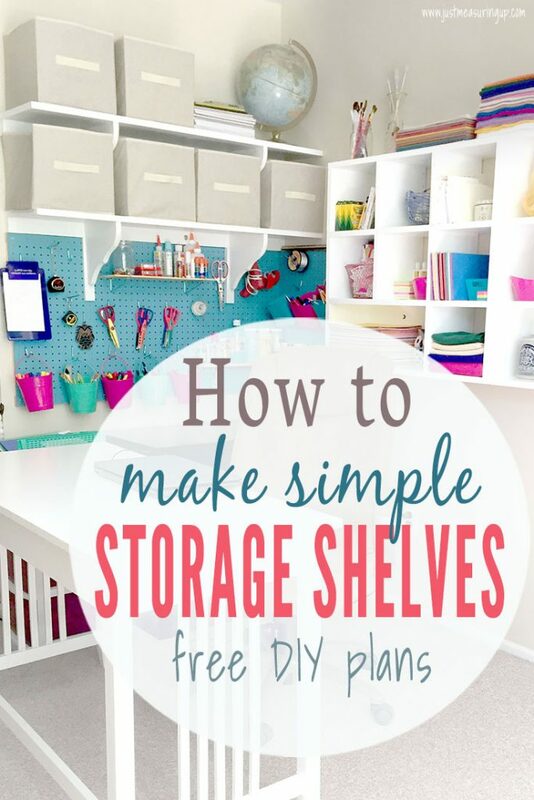 You can use these simple shelves anywhere you have wall space, not just in a craft room or office. 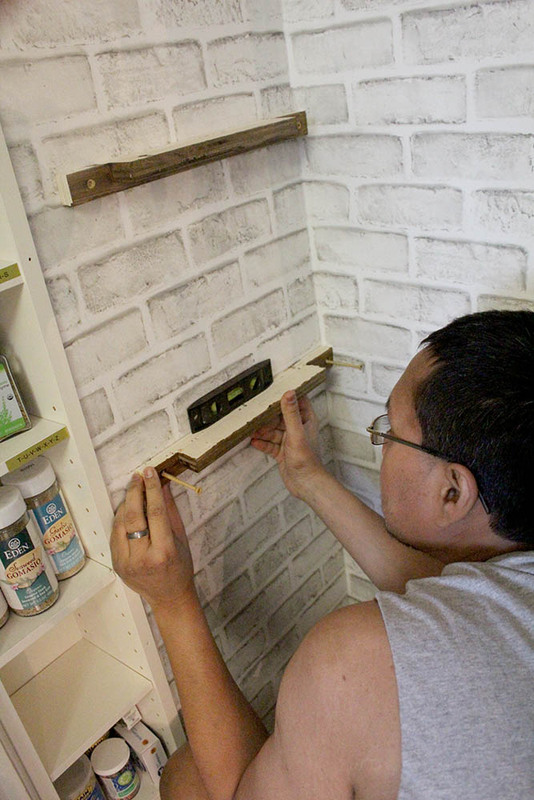 How to Build Wall-Mounted DIY Cubby Shelves Post Preview: You will see how you can build your own DIY cubby shelves and mount them to the wall. 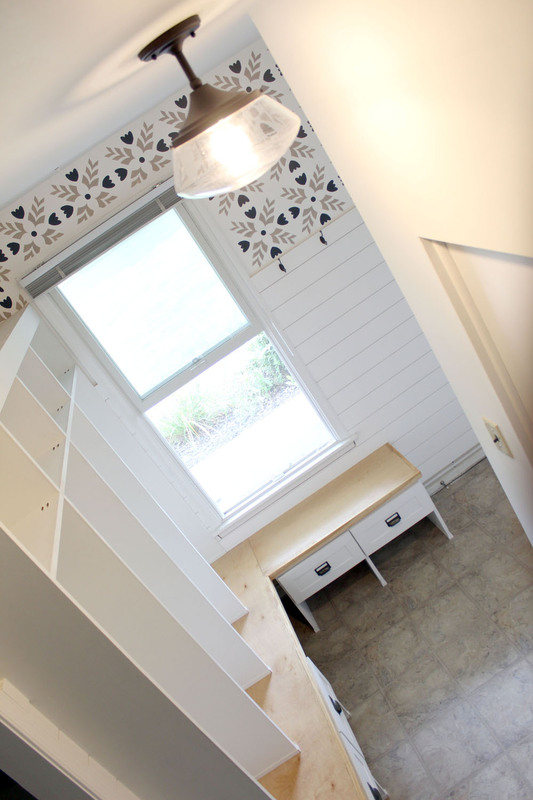 If there’s one thing we’ve learned in all of our DIY endeavors it’s that you can do a lot with a little bit of space. 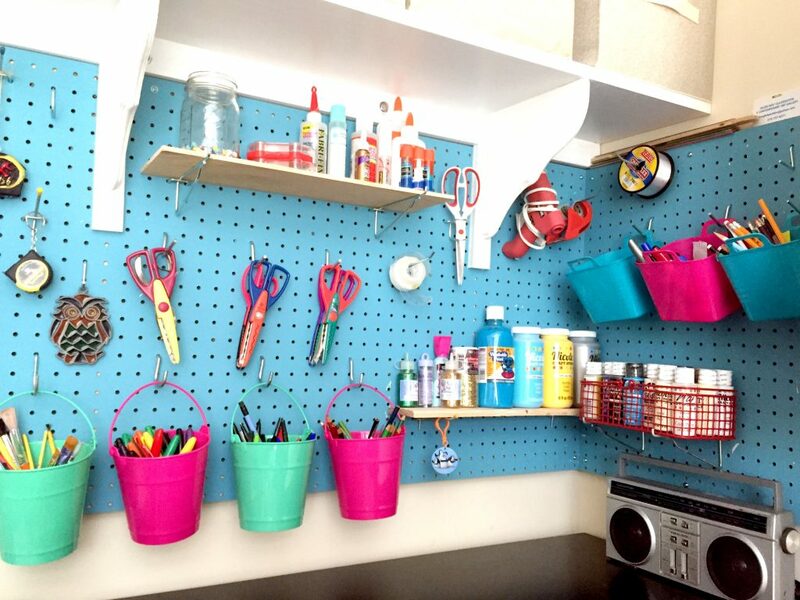 Using just one corner of a room, I’ve been revamping my wife’s craft corner with three things: pegboard, wall-mounted cubby shelf, and some simple wall shelves. 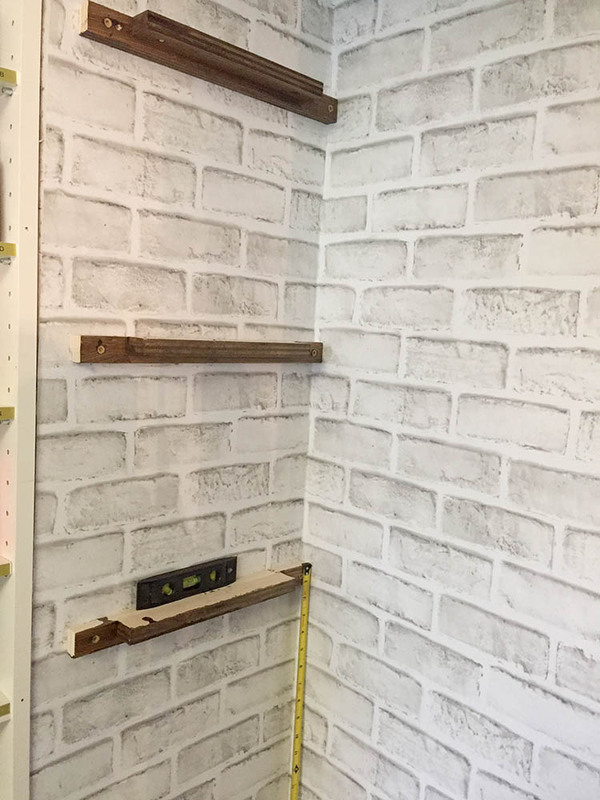 In our previous post, I shared how we mounted the pegboard, and in this post, I’ll be sharing how I built the cubby shelves. 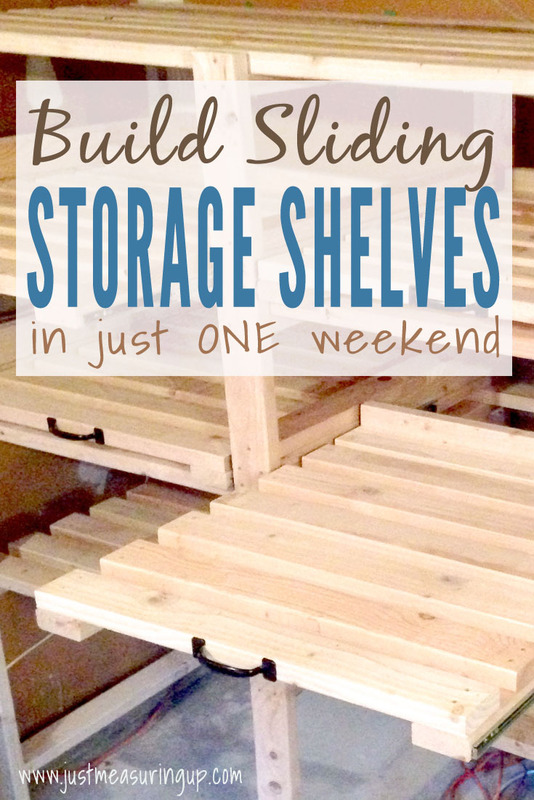 Afterward, I’ll share how I built the simple shelves (which are a gem as they hold 8 fabric storage bins!). 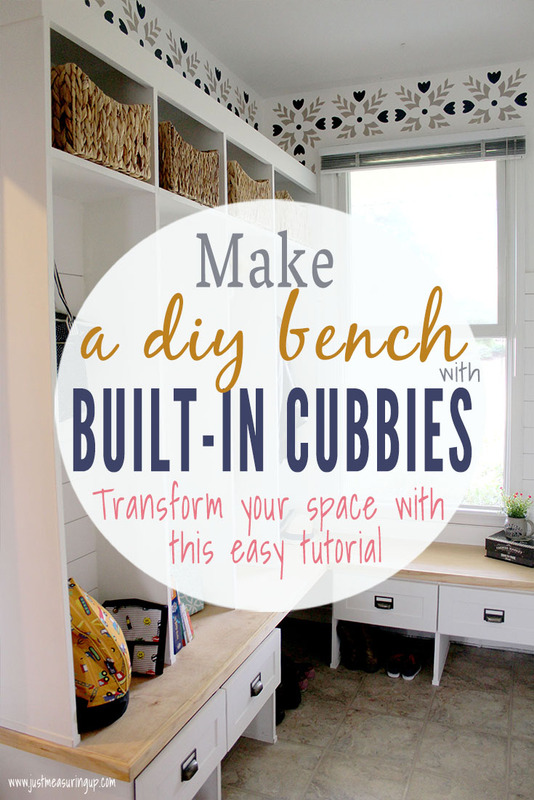 My wife was really excited about the cubbies, knowing they would bring a lot of organization and storage to her craft room. She had so many paints and other crafts that would fit perfectly onto cubby shelves. 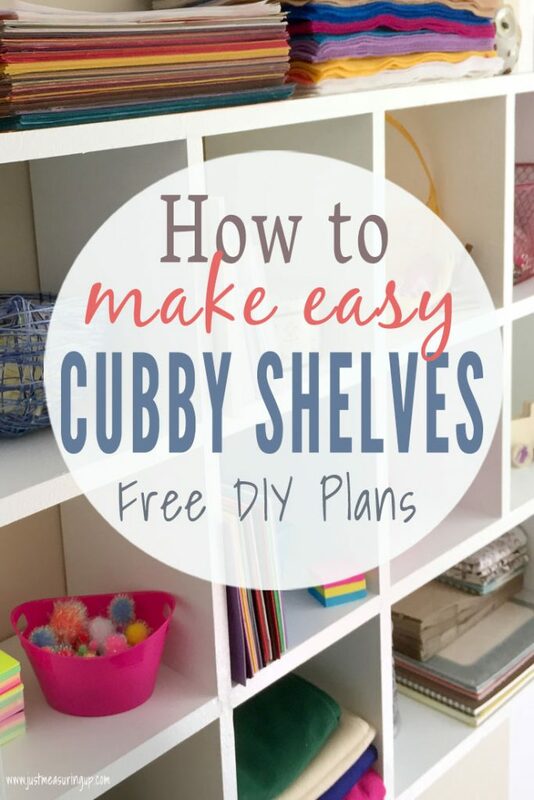 With cubbies being open, it makes things easy to find and quickly grab. 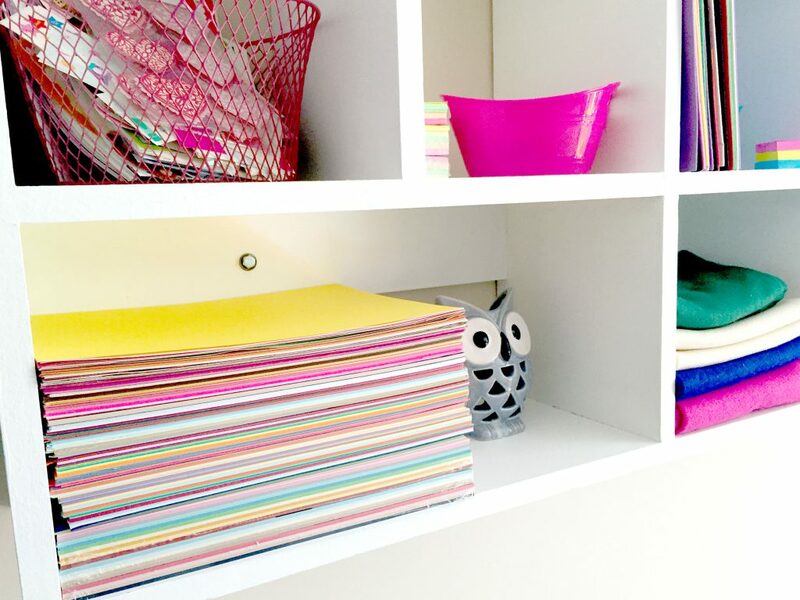 Since everything is on display, it’s natural to keep it organized. 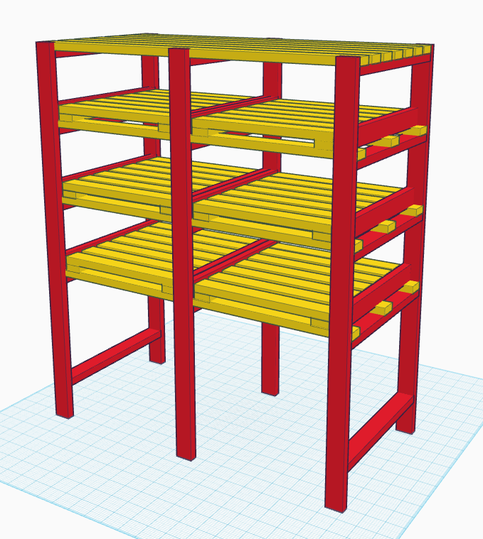 So, I did some research and came across two popular designs for cubby shelving. 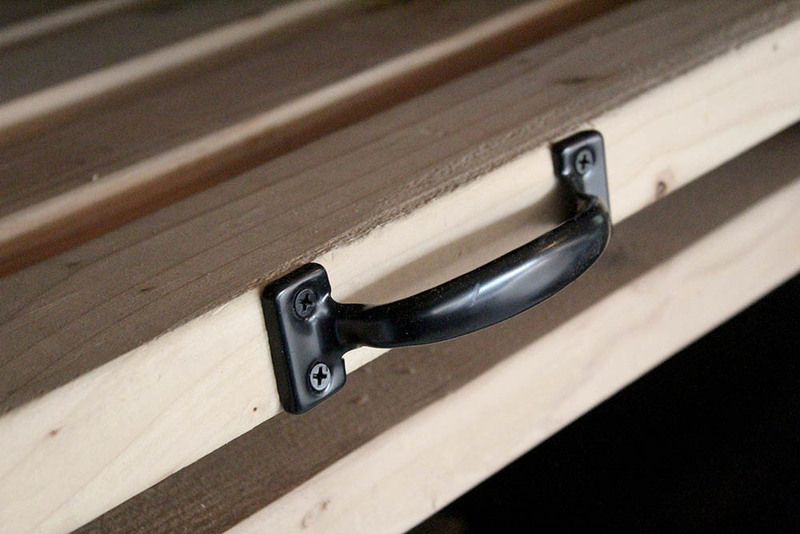 The first design used pocket hole screws to hold the cubby shelves in place. 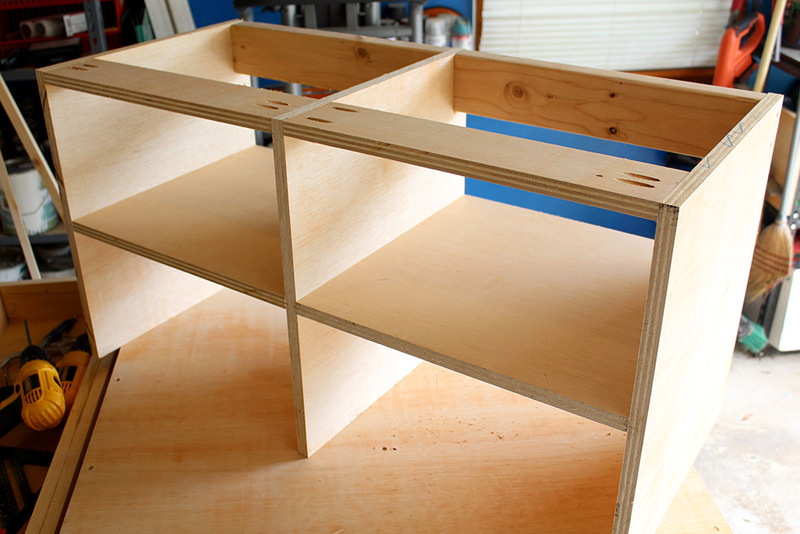 The second design used routed dados for the shelves. I went back and forth about which design I wanted to use. 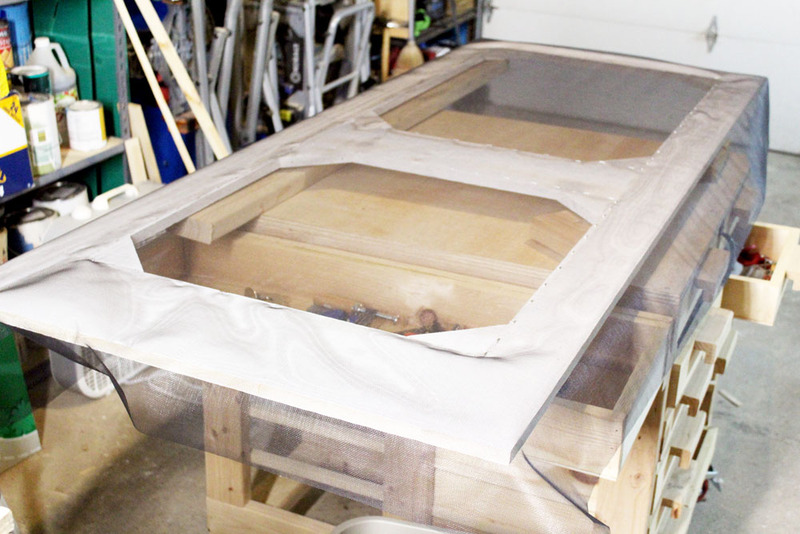 The pocket hole method was the fastest and easiest to do. I am also a huge fan of pocket holes. However, I felt that these cubbies needed a bit more craftsmanship. After all, they were going to be in the same room as our recent window seat bookshelf project. 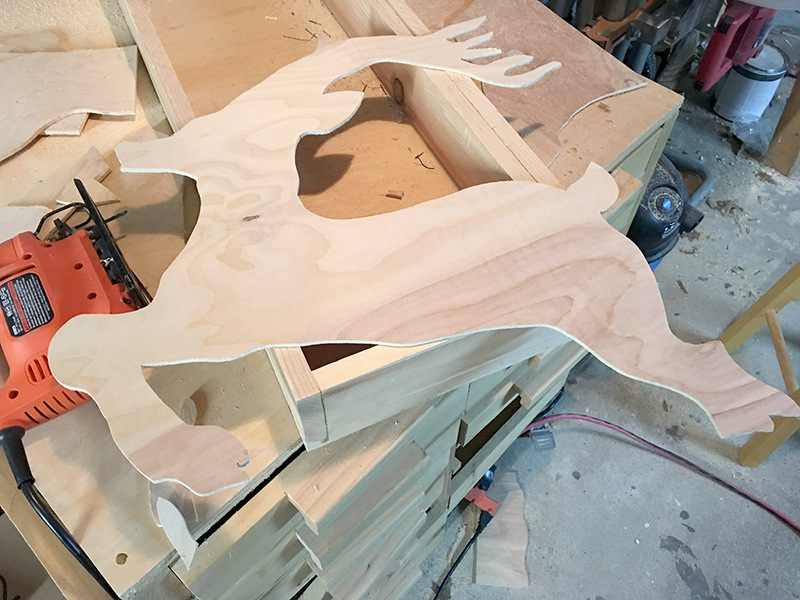 So I opted for the routed dado design. 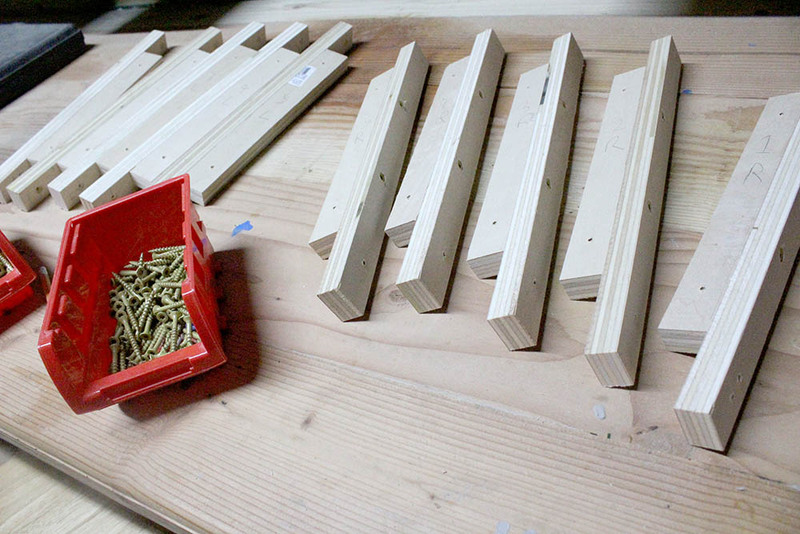 As for the wood, I normally just use the common pine boards sold at Home Depot for most of my projects. However, the cubby shelves needed an upgrade. 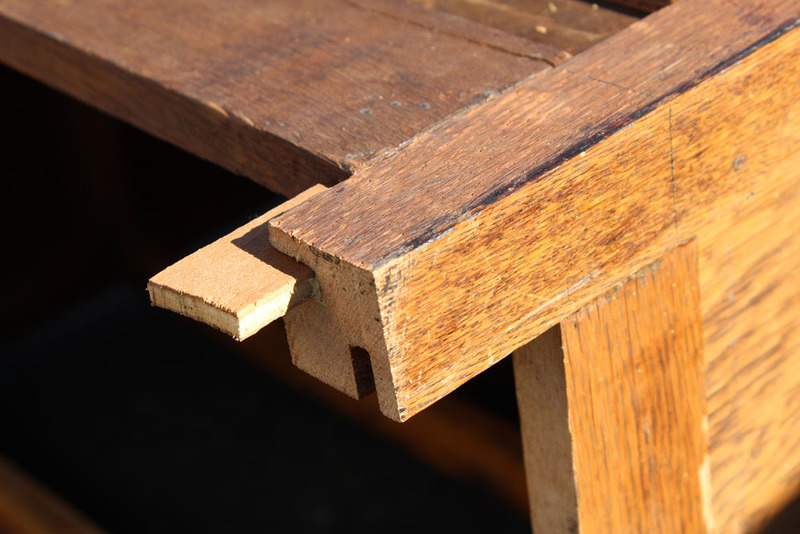 Common pine boards are full of surface imperfection and knots. 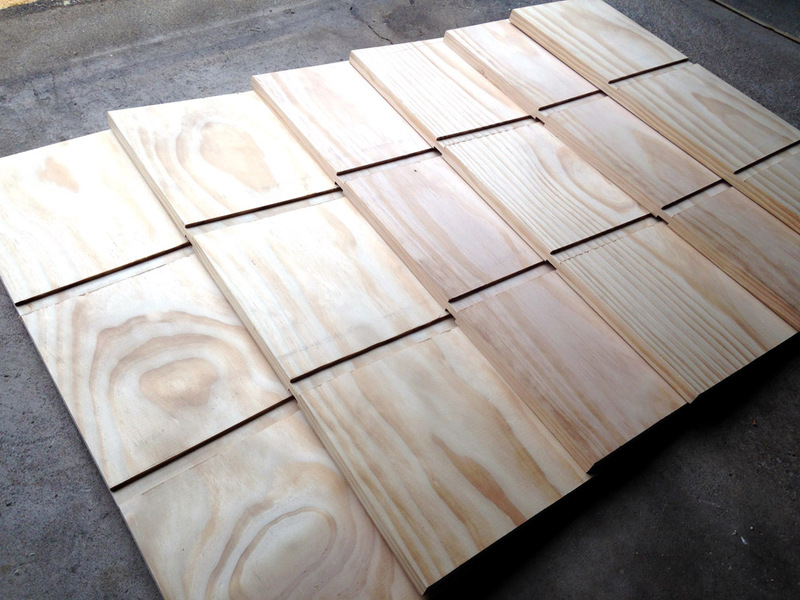 So I opted for their “select” pine boards. It was twice the price of the standard boards, but there was a huge difference in the quality. I was excited to work with wood of this quality. It was a rare treat for me. 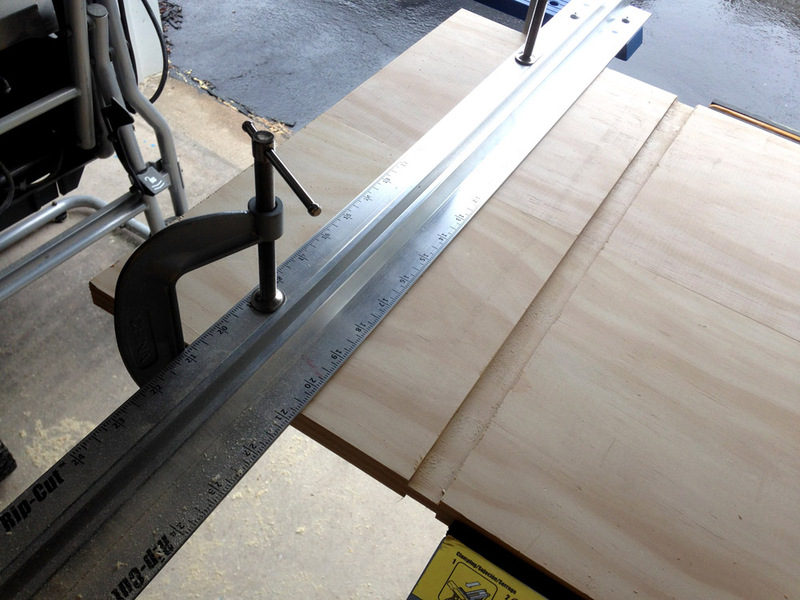 Next, I outlined the dados with a pencil and ruler, and clamped down a piece of scrap wood for a router guide. I was a little disappointed with my first dado. 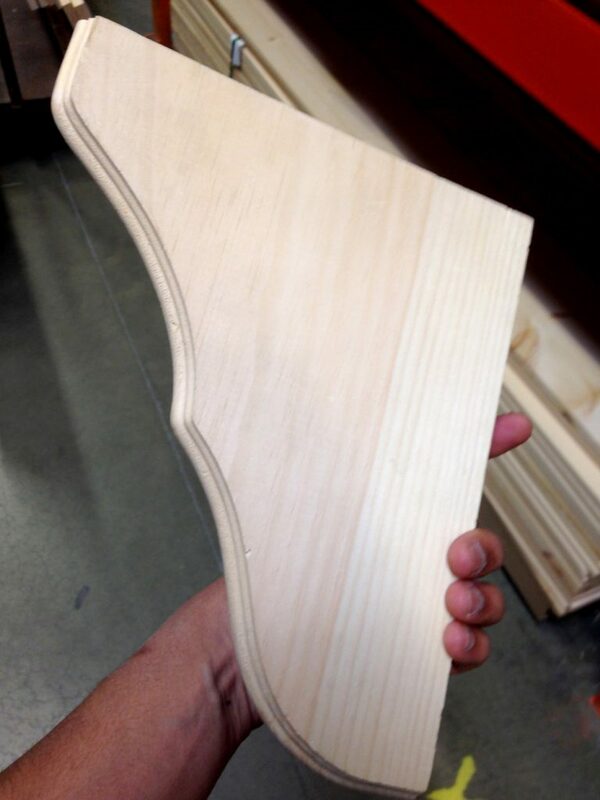 I’ve done many dado cuts in the past, but for some reason, this one was slightly wavy. The edges were not perfectly straight like I was accustomed to. I started to worry that something was wrong with the router. Then after closer inspection, I realized that my scrap wood guide fence had small imperfections along the surface. I re-ran the router through the cut and success! The wavy edges went away. I guess scrap wood isn’t the solution to everything. I had to be careful using my ruler as a fence for the rest of the cuts though. It provided a very small surface for the router to move along. 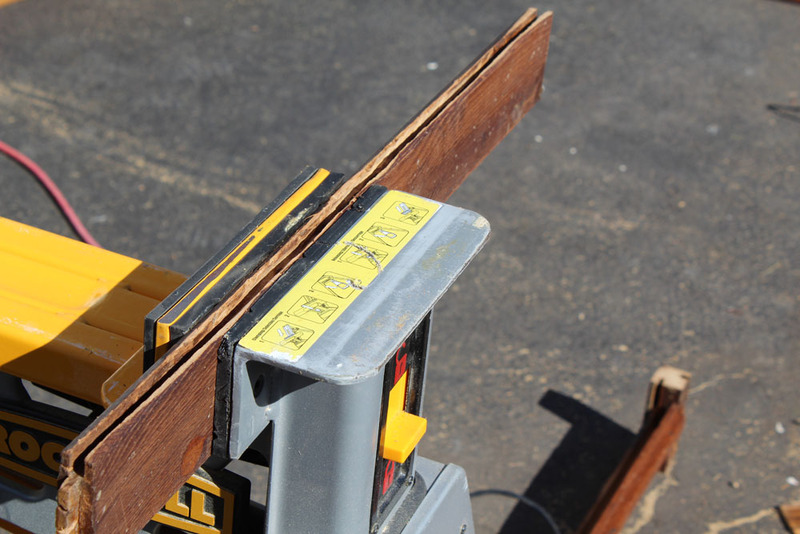 The router risked slipping over the edge of the ruler and ruining the boards. 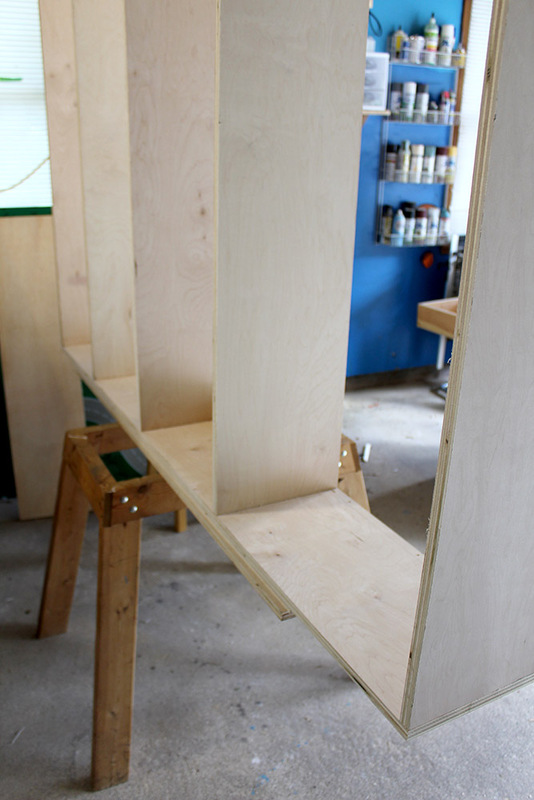 The boards with dados on both sides were going to sit vertical inside the cubby shelf. 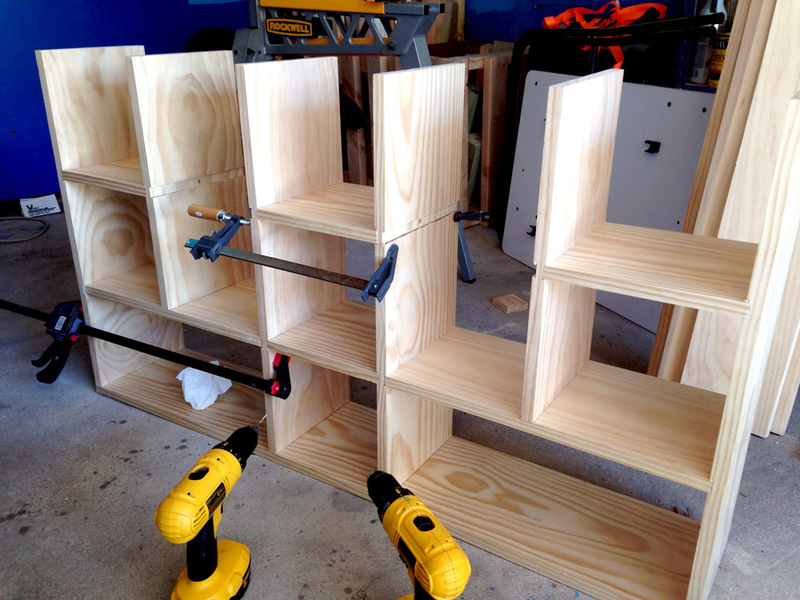 Then square shelves would be inserted into the dados to form the cubes. At this point, I took a look back at my design, and suddenly remembered something that I had forgotten. 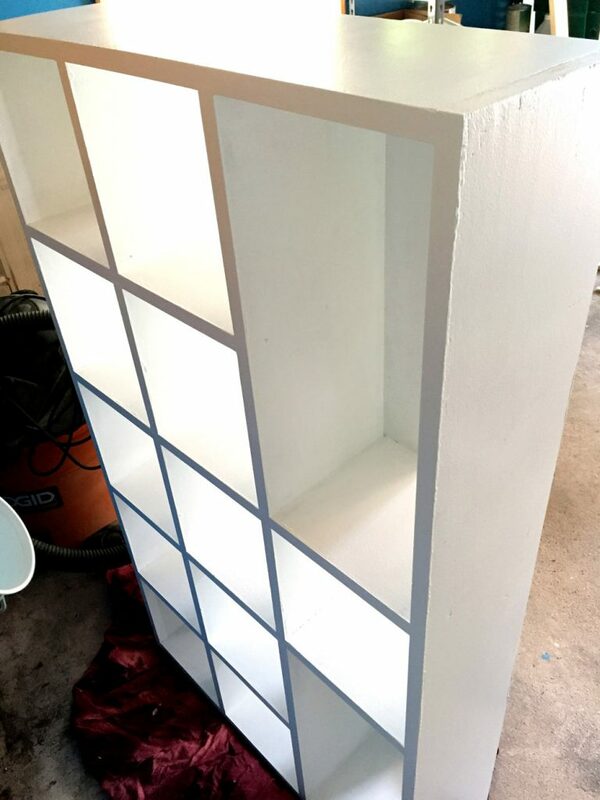 Eileen wanted some of the individual cubbies to be long enough to hold standard printer sized sheets (8.5×11) for her large card stock collection. I had intentionally gotten 10” wide boards for the cubbies to account for this. However, I forgot to factor this requirement into the rest of the design. 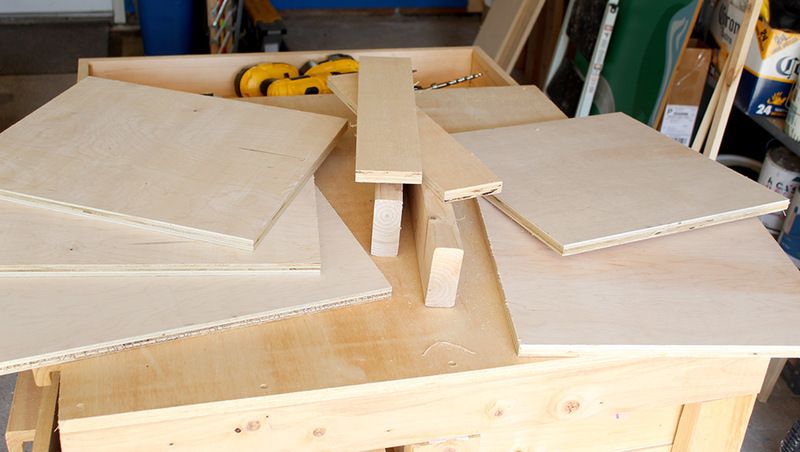 The dados were all cut to allow perfectly square cubbies, approximately 8”x9”x9.25”. 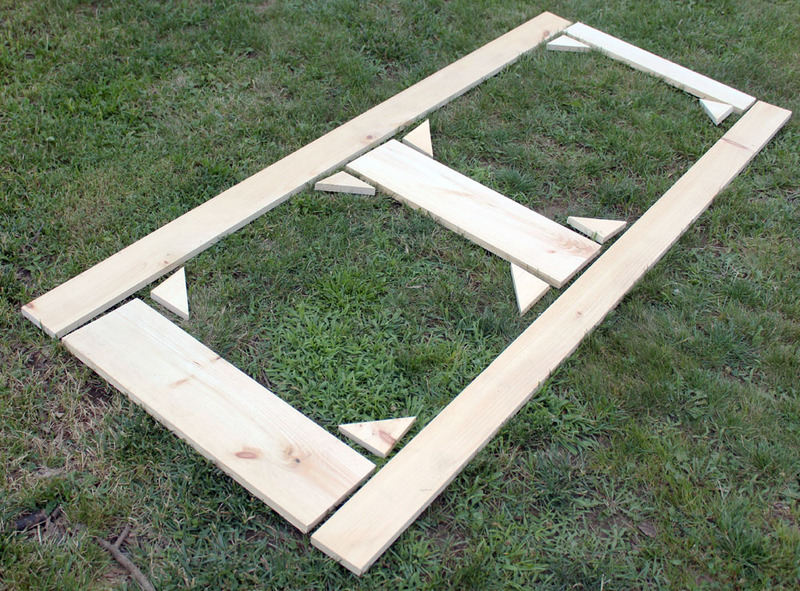 This would result in the 8.5×11 sheets hanging off the edge slightly. 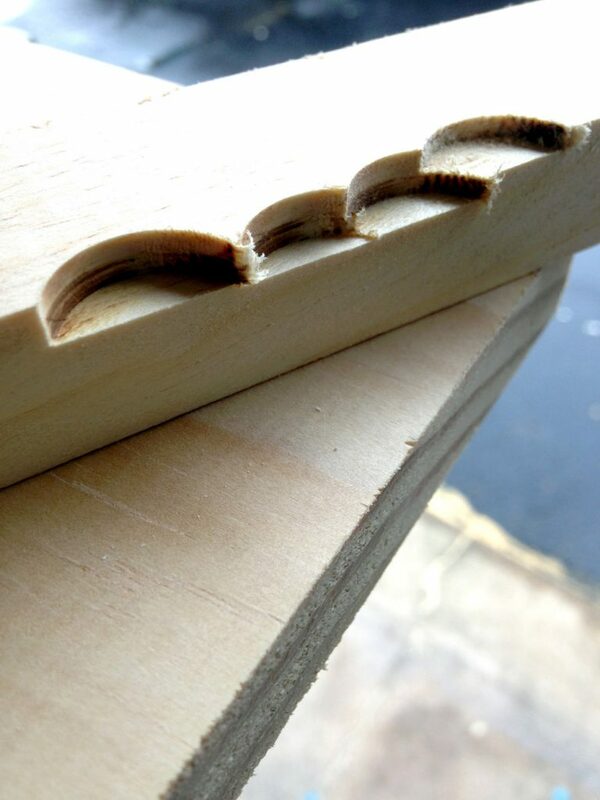 Two of the vertical boards could be cut right where the bottom dado groove was made. 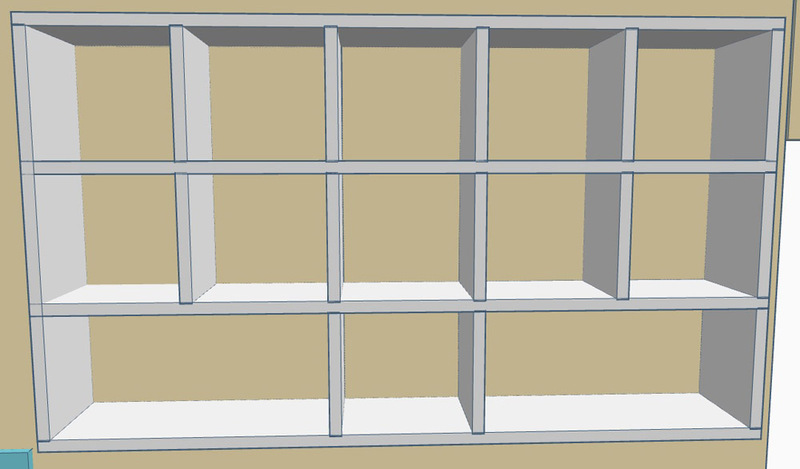 Then a longer horizontal shelf could be inserted spanning two cubbies. 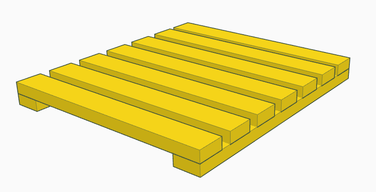 This would result in the two end cubbies at the bottom being long enough to hold the 8.5×11 sheets easily. It also added a nice aesthetic touch to the design, breaking up the repeating squares. Both Eileen and I were very happy about the design modification. With that little hiccup out of the way, I proceeded to assemble the shelves. I used deck screws, construction adhesive and 90 degree wood clamps. 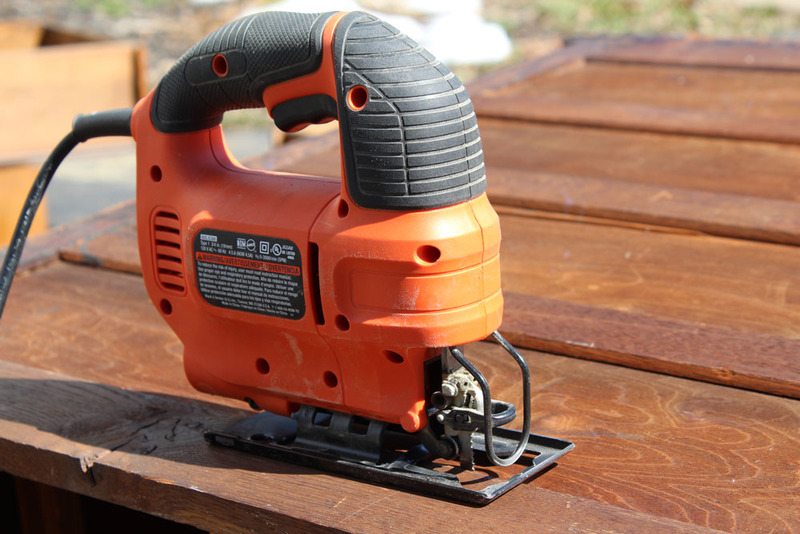 Also, I used a countersinking bit with my drill for the deck screws. I didn’t want to risk the wood splitting. 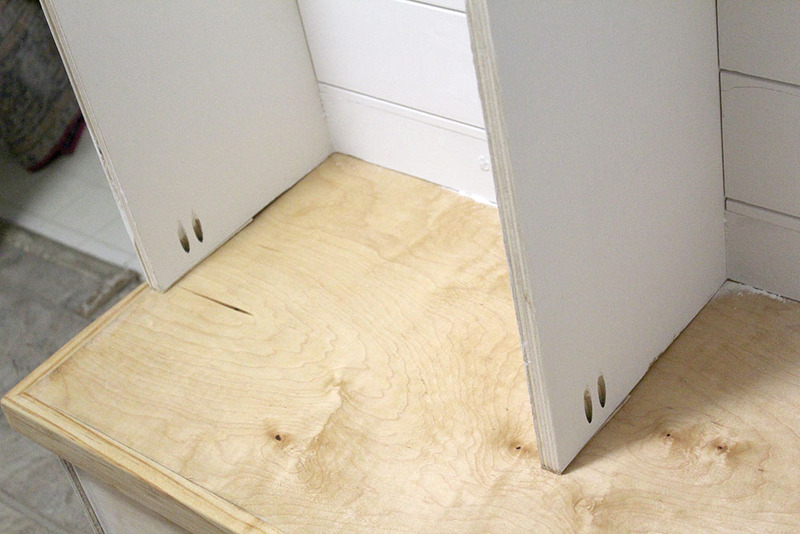 I used construction adhesive for all the inside shelves too, I didn’t want them moving in the dado grooves over time. 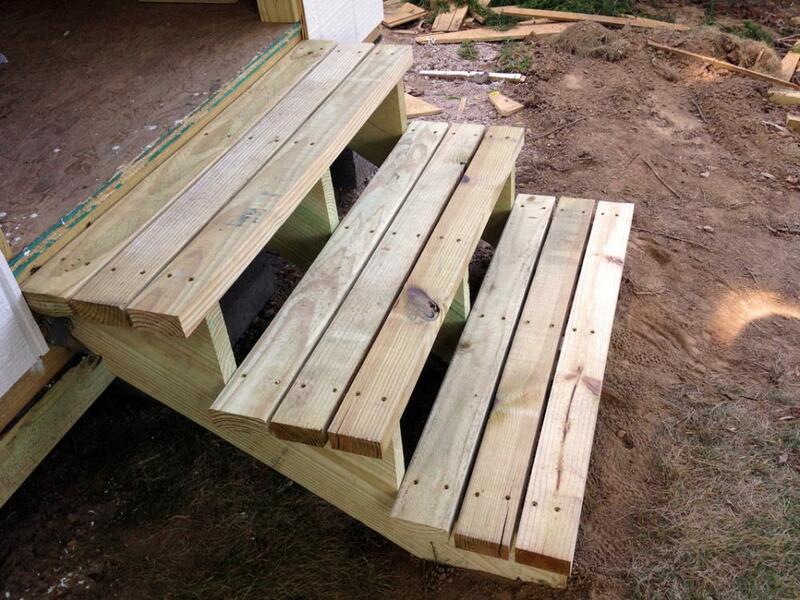 I also used some deck screws where possible too (like on the end pieces). 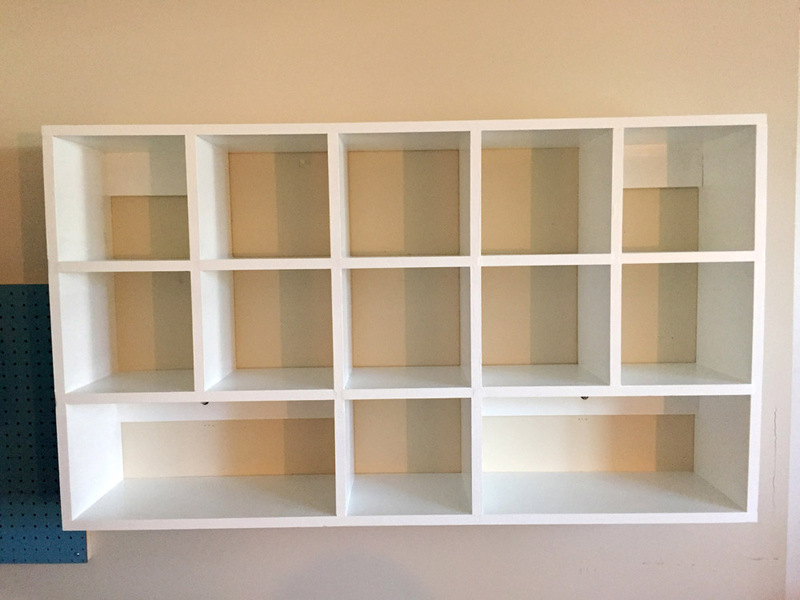 When all the inside shelves were placed into the dados, I saw that the top measurement of the cubby shelf didn’t match the bottom. 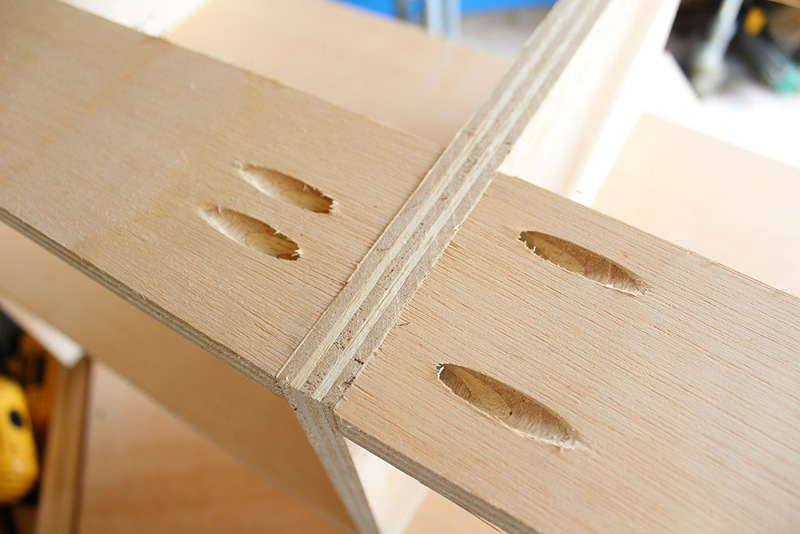 Little gaps here and there in the dados were adding up and making the top of the cubby wider than the bottom by about an inch. 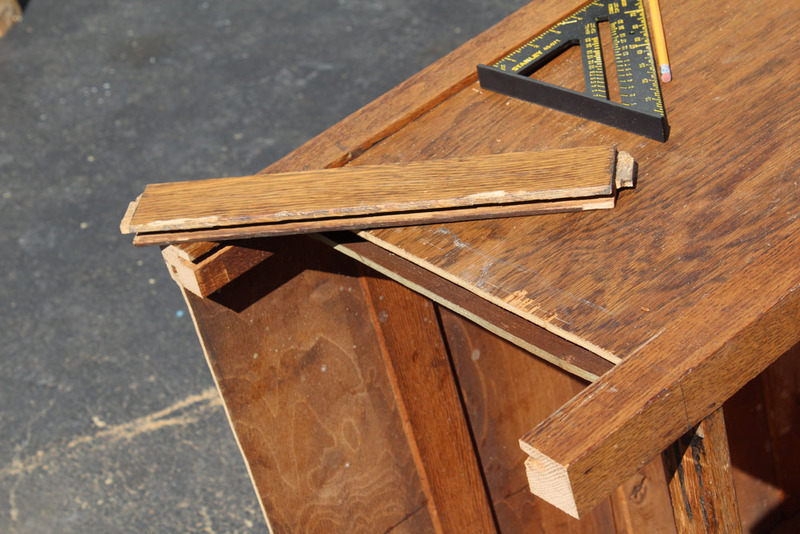 When I squeezed in one pair of dados with a bar clamp to eliminate a gap, another gap would open up slightly somewhere else. It was getting a little frustrating. Guess what? The ratchet straps worked. 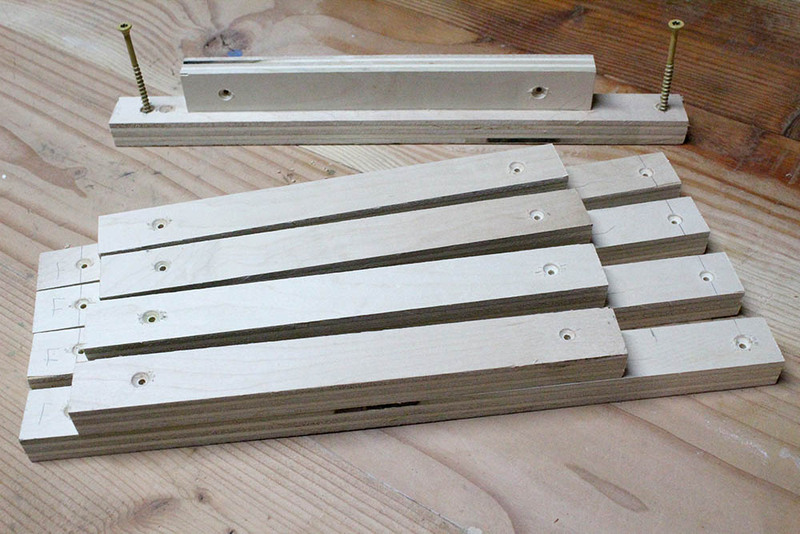 As I tightened each ratchet, I could hear the satisfying creak of the dados squeezing together tightly. I checked the upper measurement of the shelf and it was finally in agreement with the bottom. I secured the final top board and attached some strategically placed boards in the rear to help mount the cubbies to wall studs. The cubby build was pretty much complete. 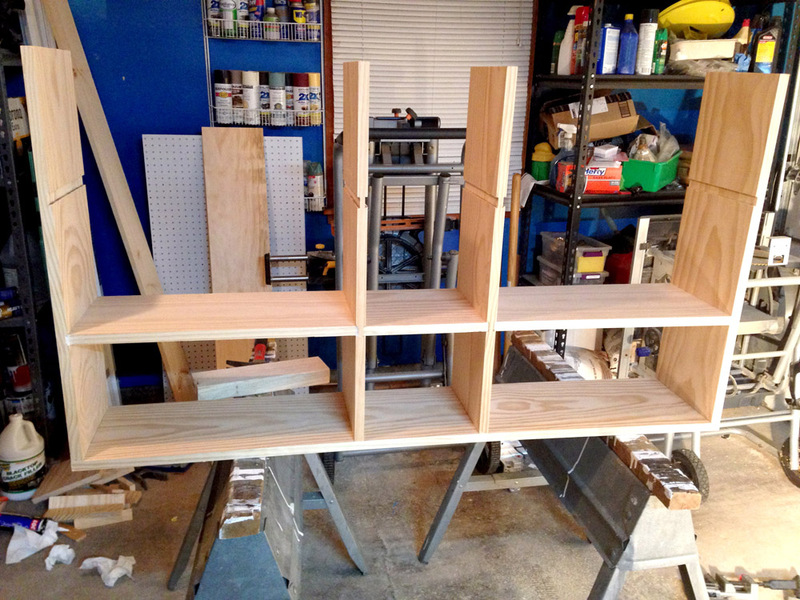 Here is the cubby shelf so far. It looked so nice – and Eileen loved it. 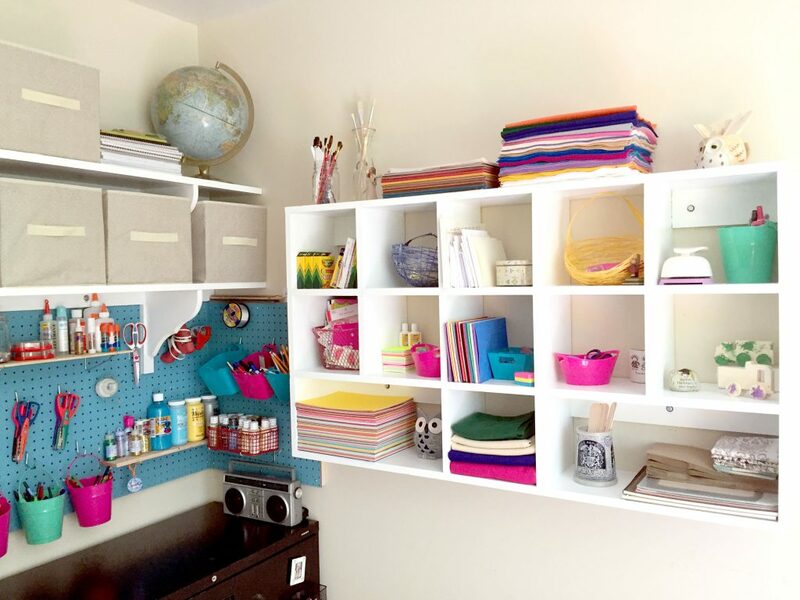 It was the perfect answer to her craft room organization and storage problem. All that remained now was to wood putty the screw holes and paint. 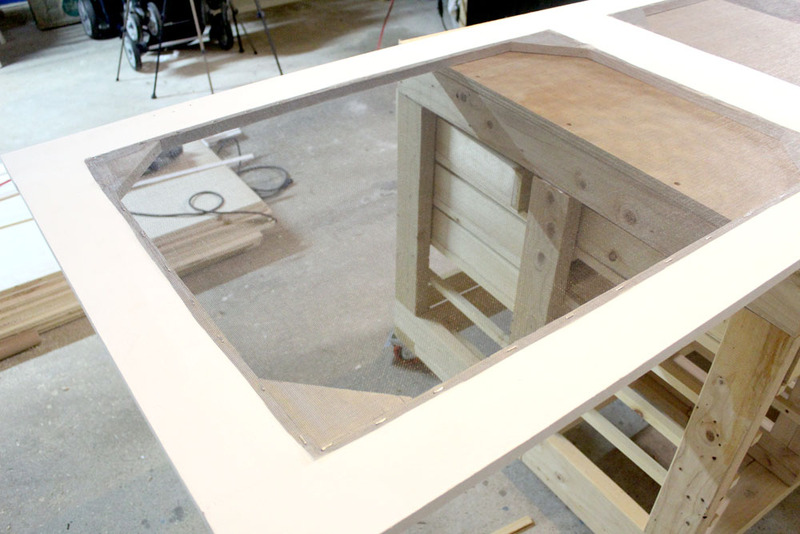 I used one coat of primer and one coat of cabinet enamel paint. I had some enamel paint left over from previous projects, and thought it would be perfect for the cubbies. Since I didn’t want items sticking to regular paint over time, the enamel based paint would eliminate this concern. With the pegboard already mounted to the wall. 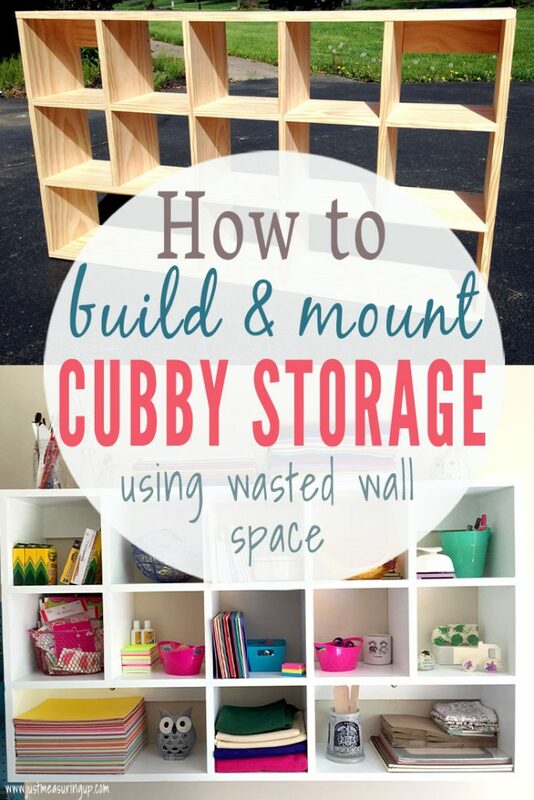 I next needed to hang the cubby storage. Unfortunately, the size and weight of the cubbies was too much for me to just hold it against the wall while I attached it. Eileen was pregnant at the time, so she couldn’t help me out. So I got creative and I attached a temporary 2×4 to the wall studs for me to rest the cubby on. This would allow me to position it perfectly without breaking my back. It would result in some small screw holes in the drywall after removal, but I could easily patch that up with drywall compound. Here is the completed shelf – including Eileen’s organization. 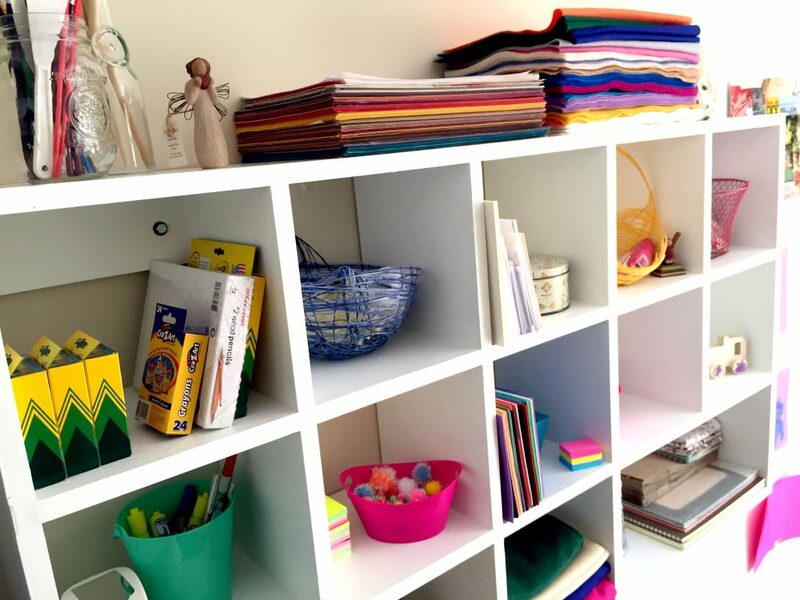 She used the cubby shelf for card stock, construction paper, and felt organization. That emptied an entire cart worth of messy piles. She used little bins and mason jars to organize things like paper clips, tacks, paint brushes, pom-poms, kids scissors, and popsicle sticks. She does a ton of kids crafts with our son, including lots of card-making and letter-writing. 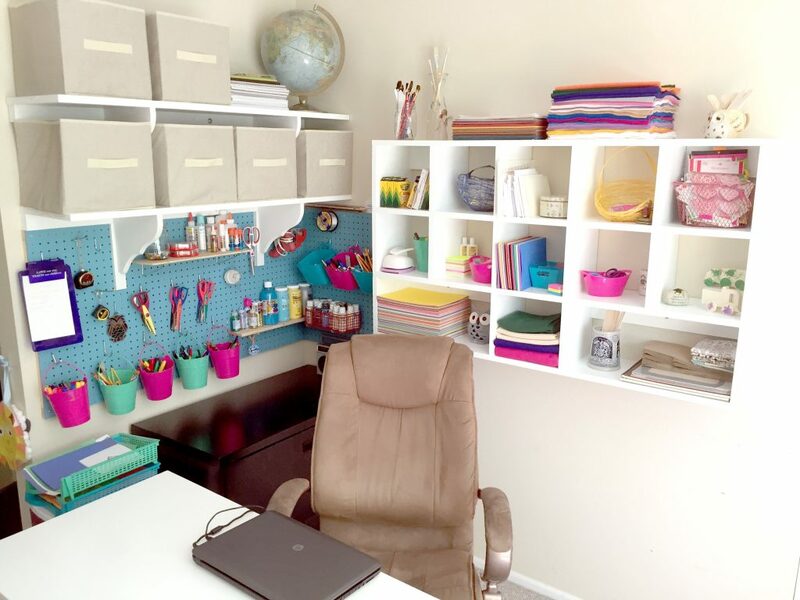 With this cubby organization, she can easily access his collection of stickers which are grouped in a bin as well as card stock and envelopes. 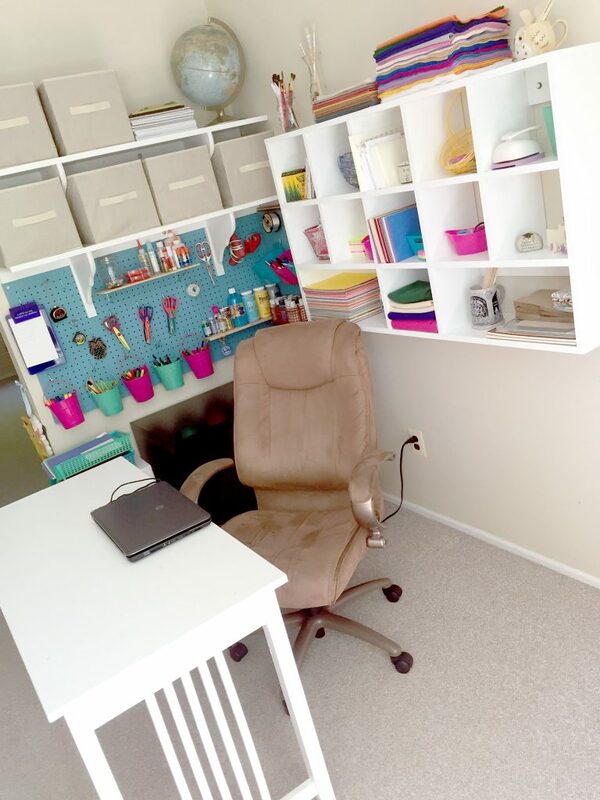 Here are some final pictures of the craft room organization. 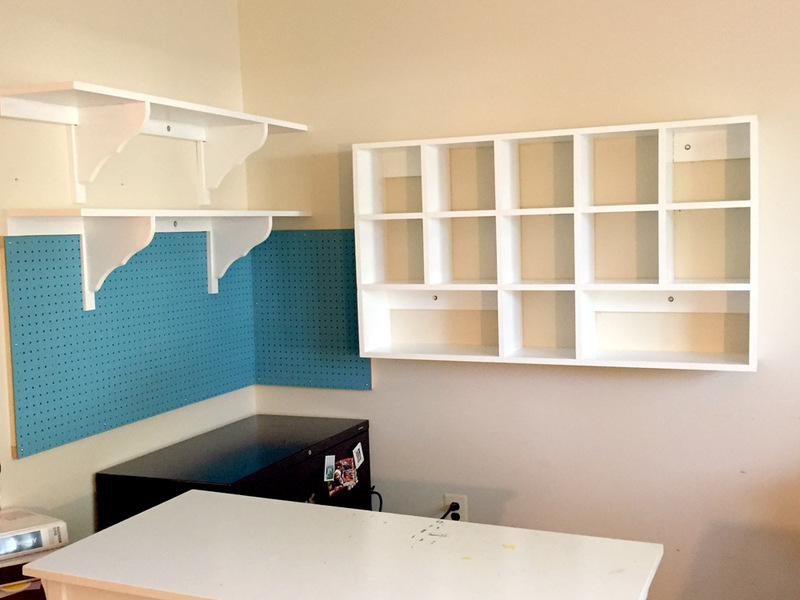 The project was comprised of three parts: the pegboard, the cubby shelf, and the simple wall shelves. 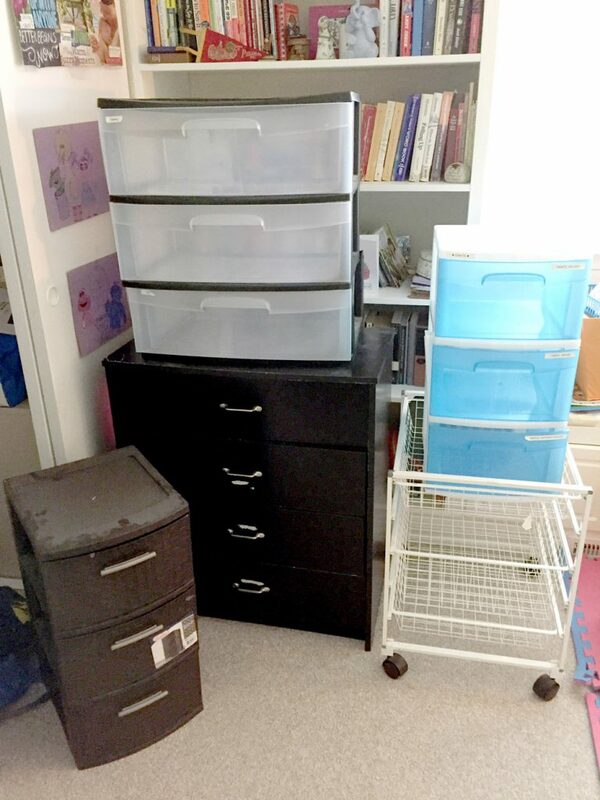 With the amount of new storage created with these three things, Eileen was able to empty out tons of storage containers. 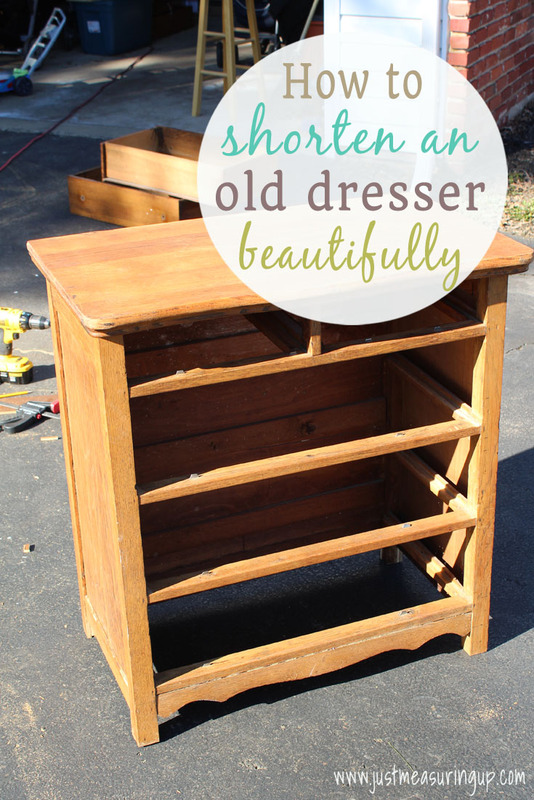 She emptied three storage towers, one cart, and one dresser. She completed underestimated the amount of space all of the new craft room storage gave her. I was sure happy to see that black dresser emptied out. I tossed it to the curb that very day. It had been in closets for the past eight years and before that was my old college furniture. Outdoor Christmas decorations are always so expensive. We’ve had our eyes on a set of reindeer and a Santa sleigh for years – but the price is always ridiculous. And, at the after Christmas sales, they are always sold out. So, I did what I do best – and I made my own. 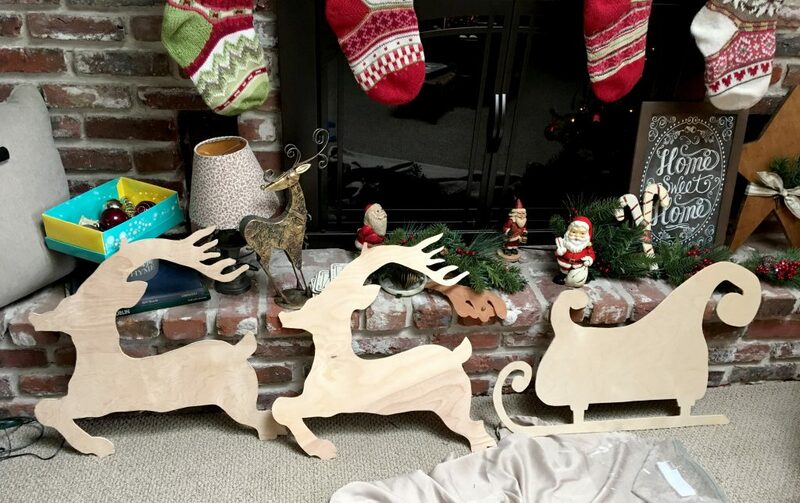 It’s not the exact Santa sleigh and reindeer set she had her eyes on, but I wanted to go in a different direction than the standard Christmas yard props. 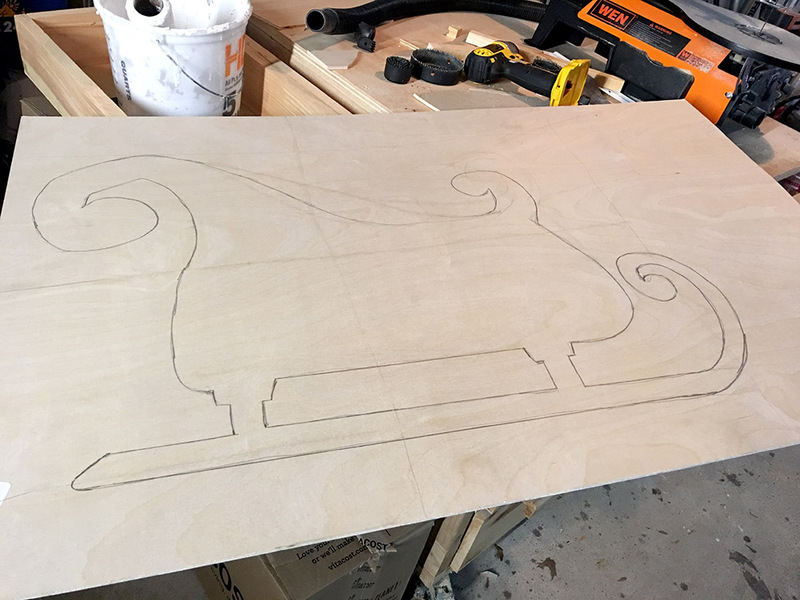 With my recent purchase of a new jigsaw, I could get pretty creative in making a homemade outdoor Santa sleigh decoration. 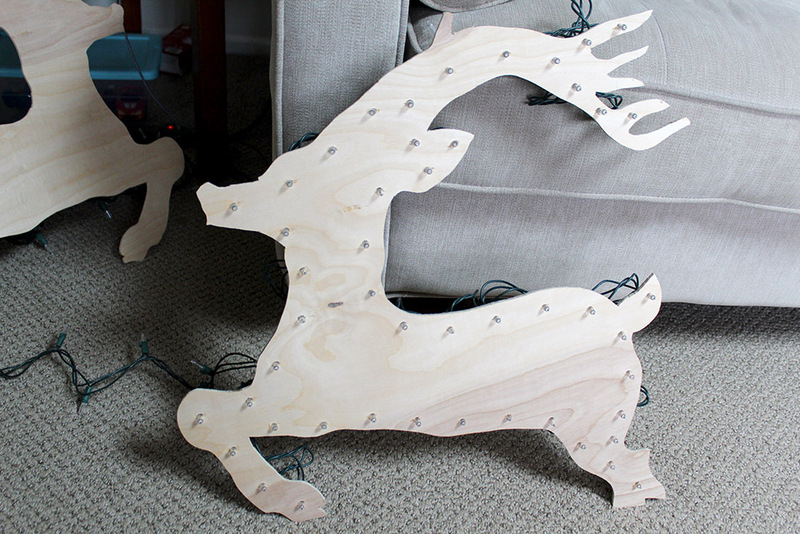 After bouncing some ideas off Eileen, we decided to cut out a sleigh and two reindeer from plywood. 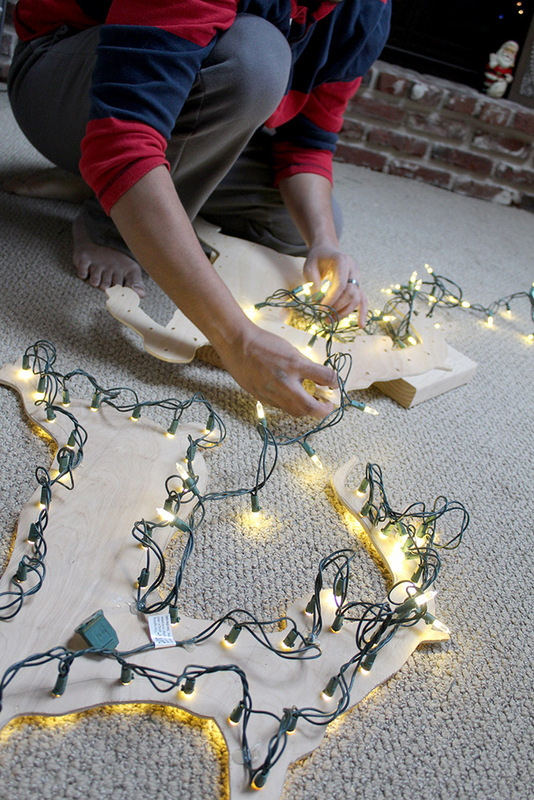 Then, I would drill tiny holes along the perimeter and insert string lights. The whole thing was to be suspended between my front porch posts. It turned out pretty nice – and we paid nothing for it. We used plywood leftover from various big projects and lights that we already had. 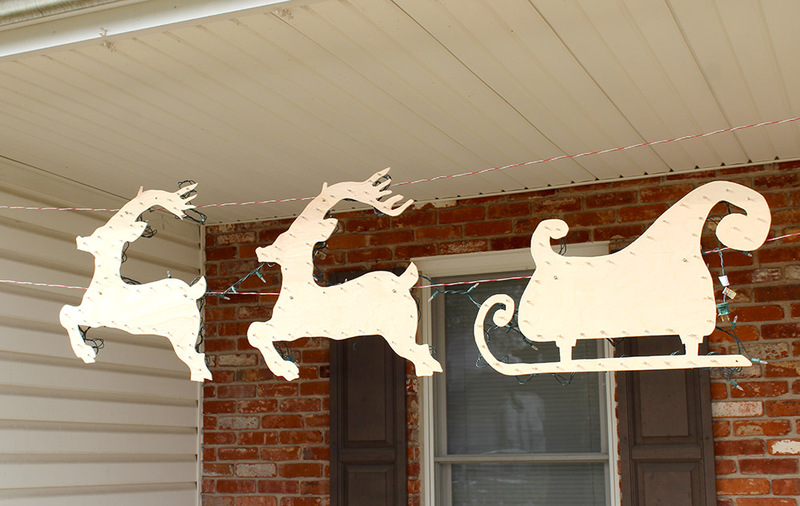 Without further ado, here are the instructions on how to make this outdoor Santa sleigh decoration. 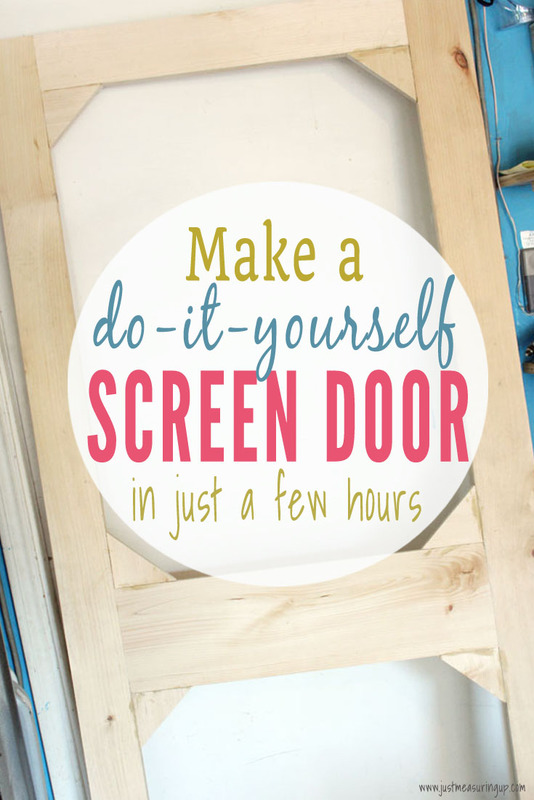 Don’t forget to scroll to the bottom to see the other outdoor projects and tutorials in the blog hop. 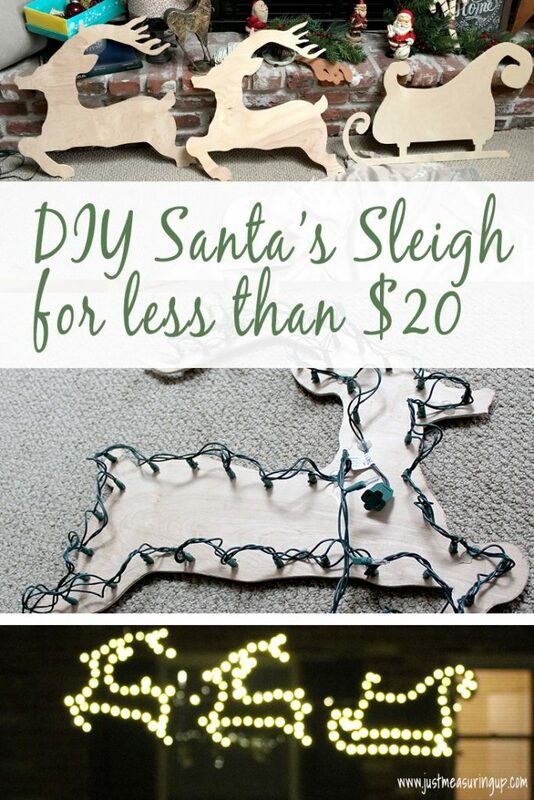 For just a few hours of time and less than $20, you can make your own reindeer and sleigh outdoor decorations. Once I was happy with the sketches, I moved onto my jigsaw to start cutting them out. It was important to use the right saw blade as I didn’t want to risk breaking off an antler or produce really rough edges. 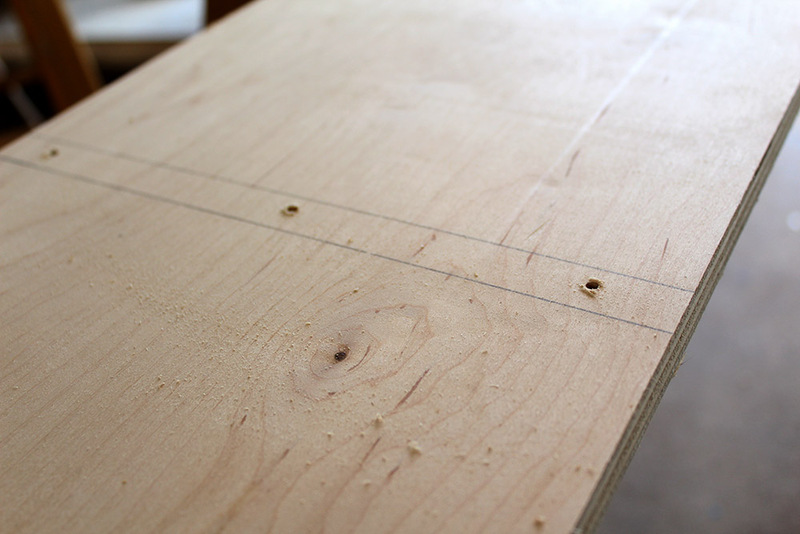 I opted for a fine blade made specifically for cutting curves in plywood. 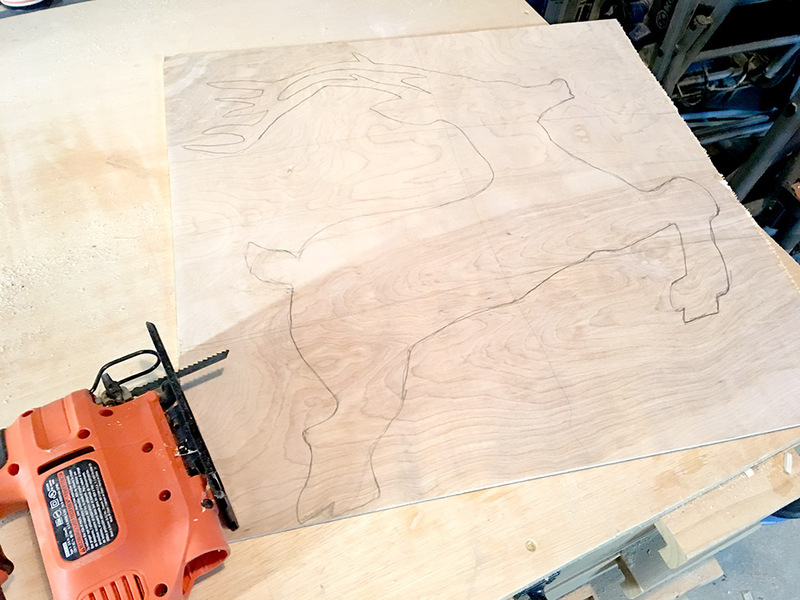 To cut out the sketches, I found it easiest to place the plywood on top of a wooden box while using the jigsaw. 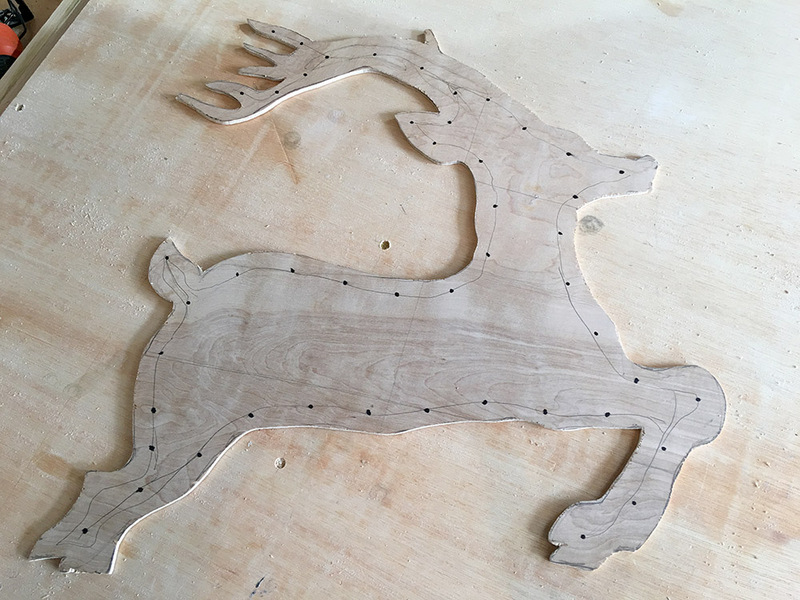 I did two reindeer, so after I cut out the first, I traced it onto another sheet of wood to make a second reindeer. 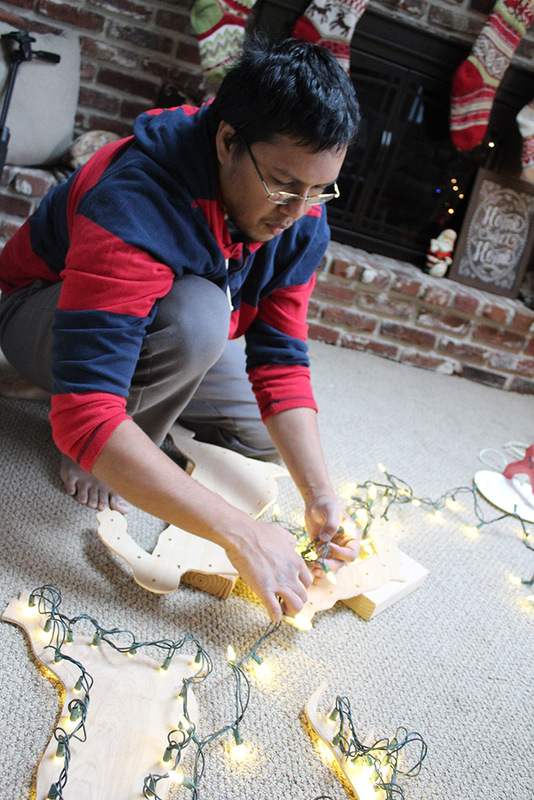 With the cutouts made, I moved onto drilling holes for the lights. To start, I used a marker to place dots where I wanted each hole to be. When all the marker dots were added to the sketch, I had to determine what size drill bit best matched the diameter of the string light bulbs. 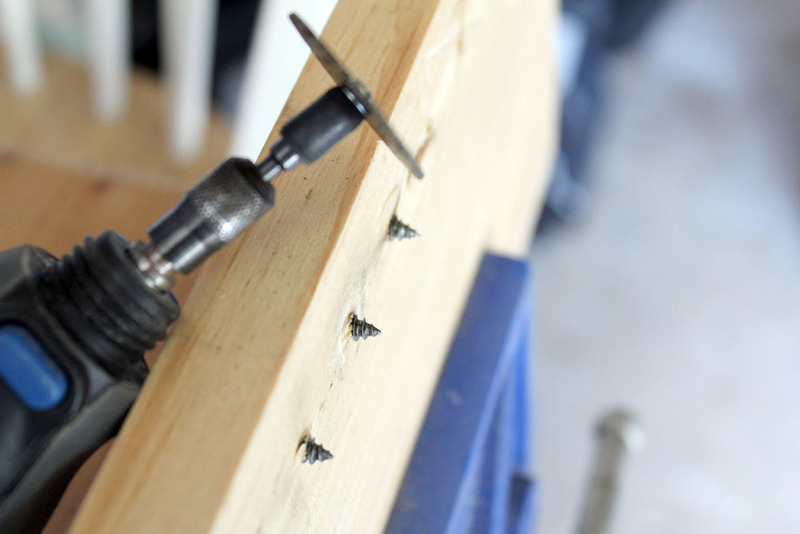 I figured out what drill bit to use by trial and error drilling various sized holes into a piece of scrap wood. With my ideal sized drill bit selected, I proceeded to drill out all the marker dots. 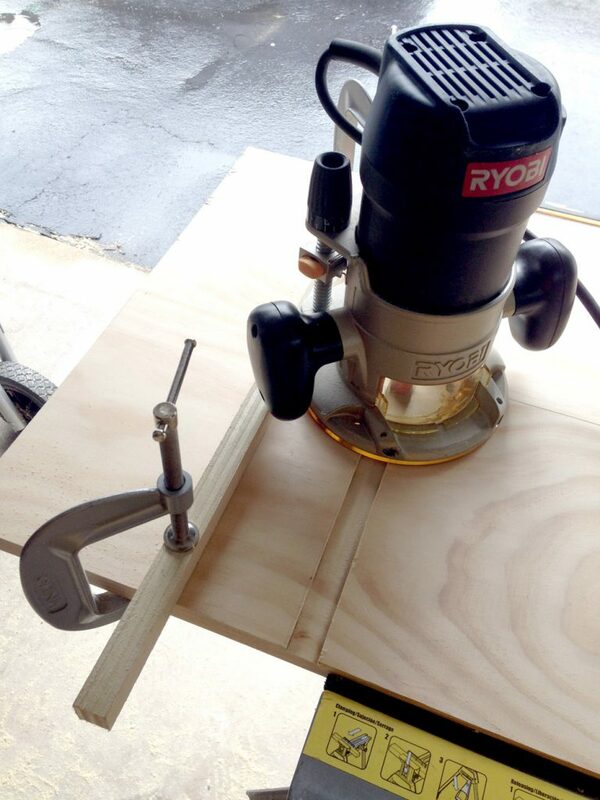 It was important to use a piece of scrap wood as a backing for the plywood as I drilled each hole. 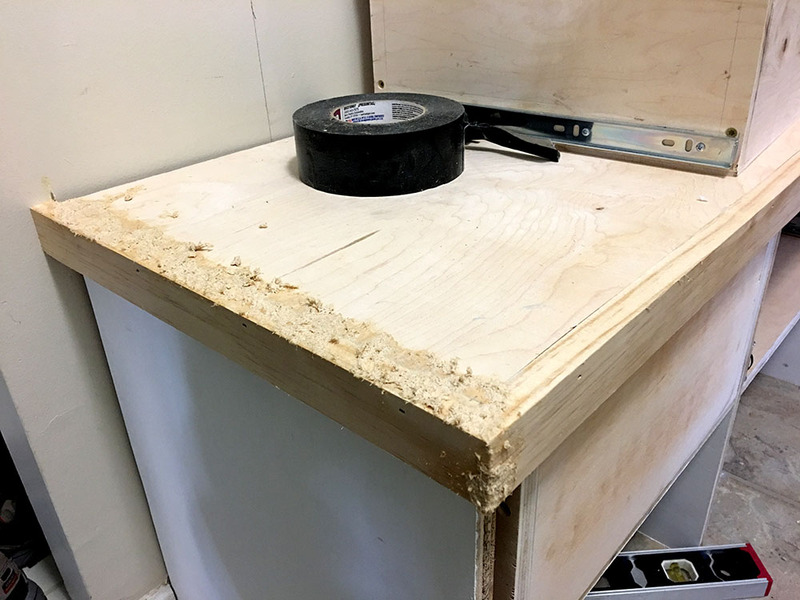 The backing allowed me to quickly move from hole to hole without worrying about damaging my work bench. 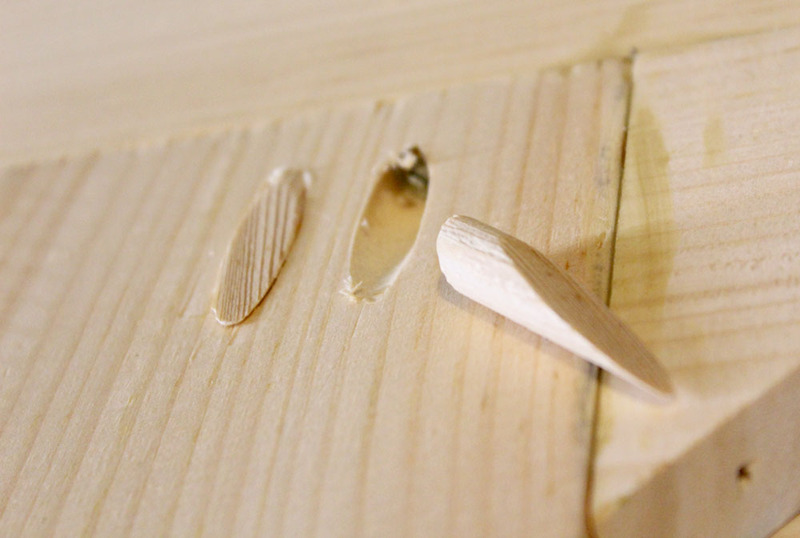 Also, it reduced the likelihood of the drill ripping out any plywood as the bit emerged out the other side. With the holes drilled, the next task was to insert the lights. I had initially hoped that the holes were going to be snug enough to securely hold the bulbs without them falling out. This was not the case however. 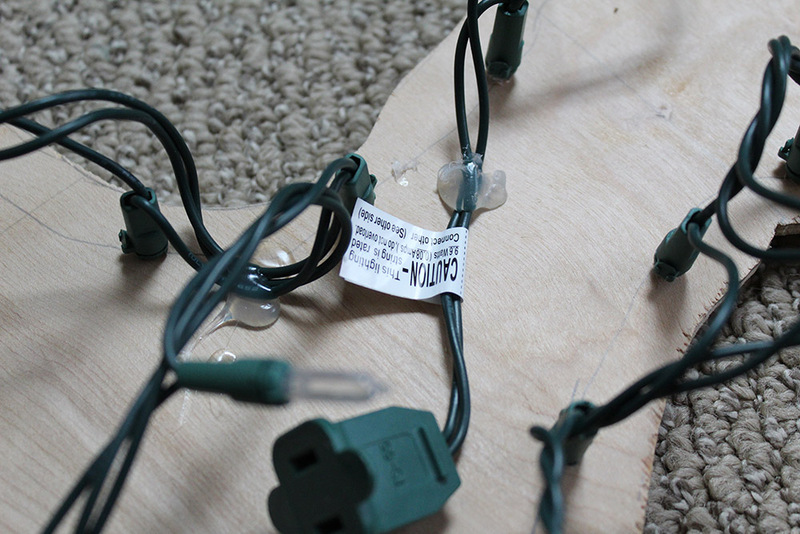 So I strategically placed several globs of hot glue to keep the string lights attached to the plywood. I repeated the process for the rest of the entourage until all the bulbs were inserted into the holes and secured down with hot glue. 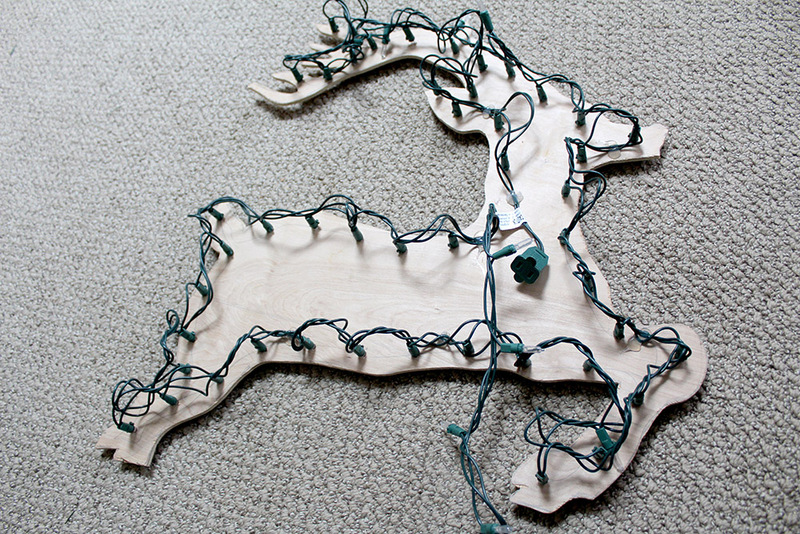 One last thing remained and that was hooks to allow the sleigh and reindeer to be suspended. I decided to use some wire mounting clips for this task. 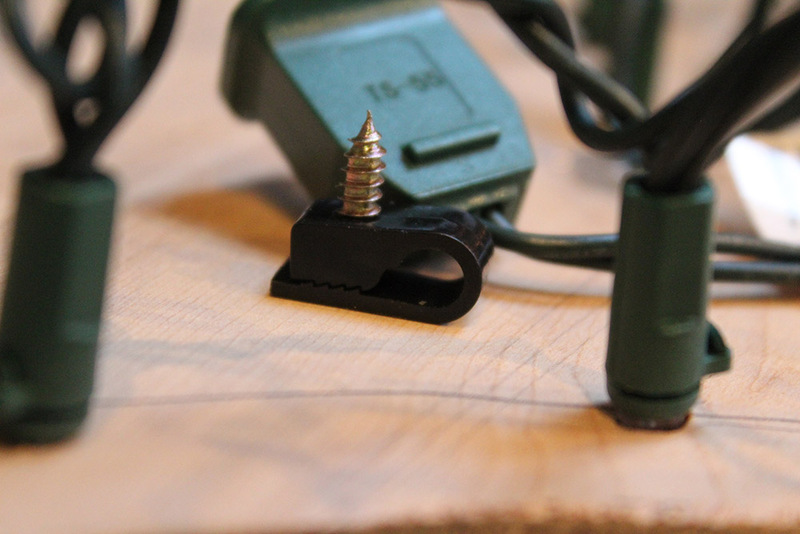 These were small plastic clips normally used to mount coaxial cables to walls for organization. However, they would be perfect for my project. 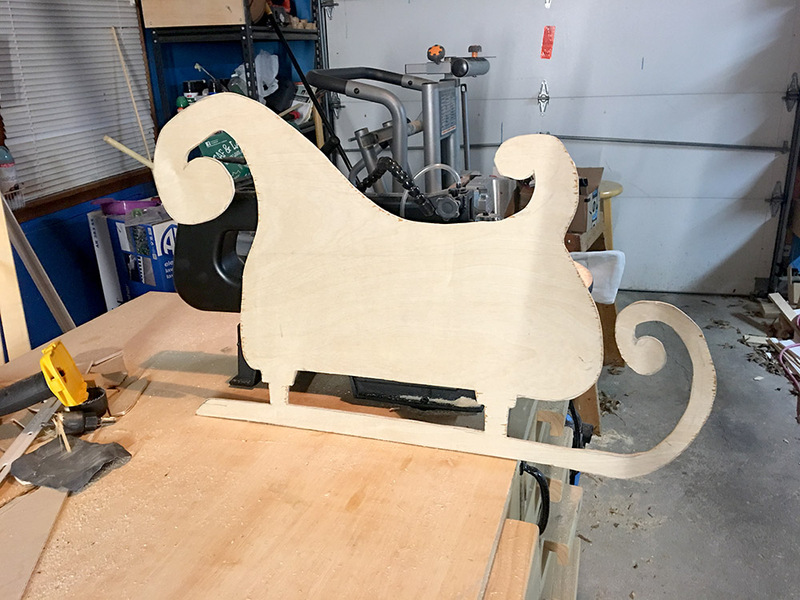 The sleigh and reindeer were now completed. 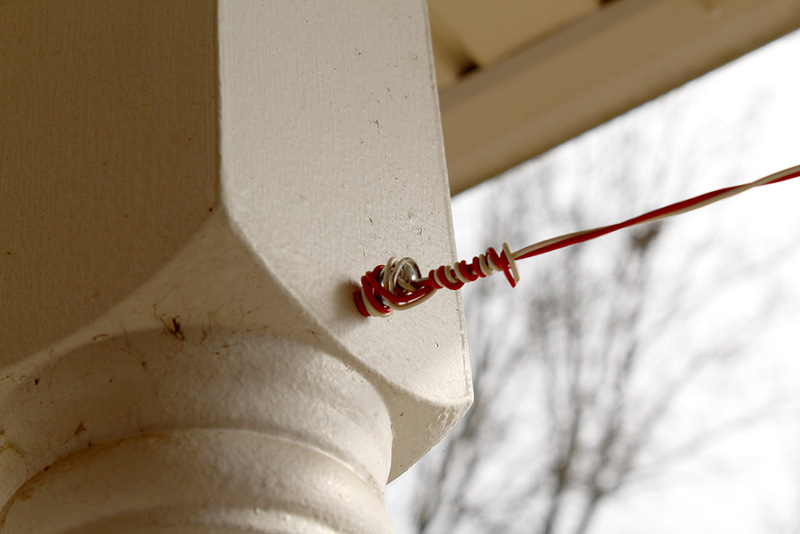 To hang them up outside, I added two eye hole screws to my porch posts. Then I ran some wire through the plastic clips attached to the plywood earlier. Finally I strung the wire through each eye hole screw, tensioned it well and plugged in the lights. Here is the sleigh and reindeer in it’s full beauty. 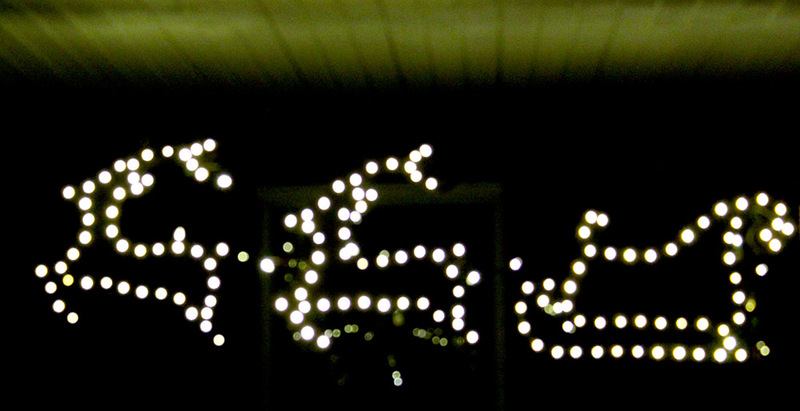 And, I lost the daylight pretty quickly, so I lucked out in seeing the lit up reindeer and Santa sleigh right away. I was pretty pleased with how it turned out. More importantly, my wife loved it. 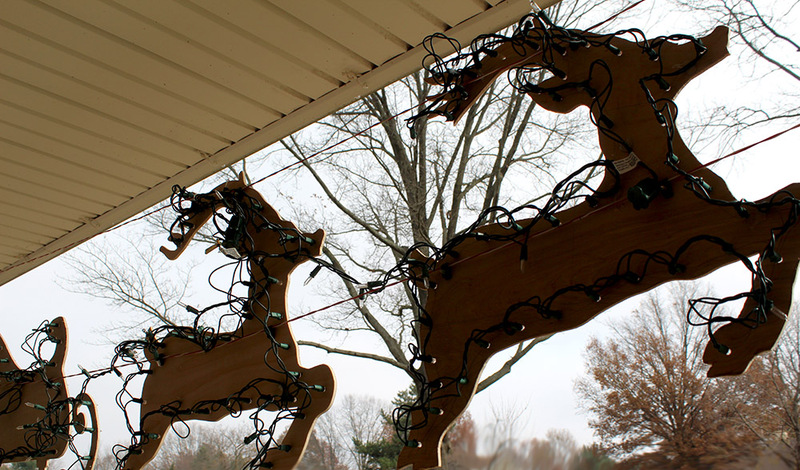 If you are wanting to buy outdoor Christmas decor but don’t want to spend the money, definitely think about making your own. We made ours for free with extra materials we had. 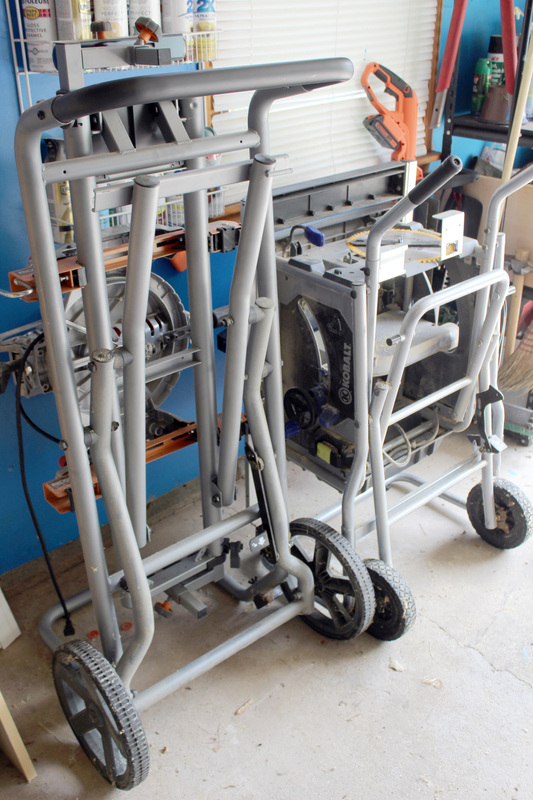 However, if you have to run to the hardware store for materials, it would probably run about $20 (plywood and 3 strings of lights). Not bad for $20, right!? 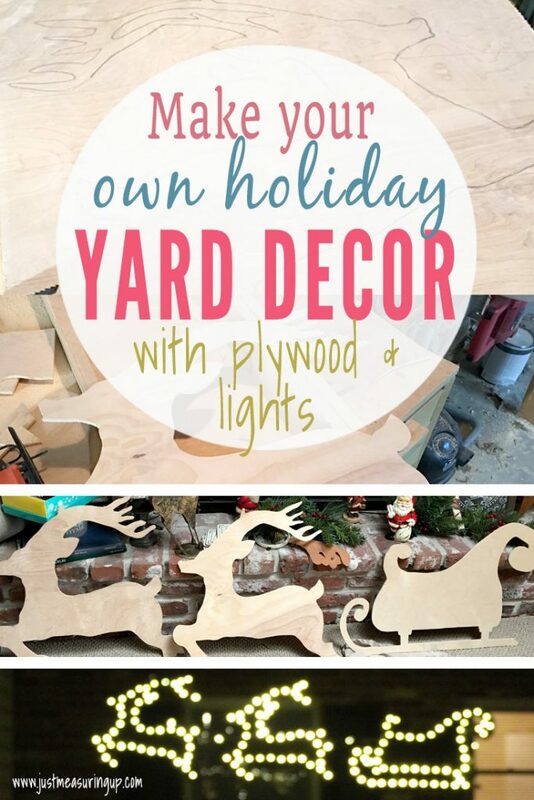 Check out my favorite holiday DIY outdoor decorations here, or see all of the Deck the Home holiday DIY projects.